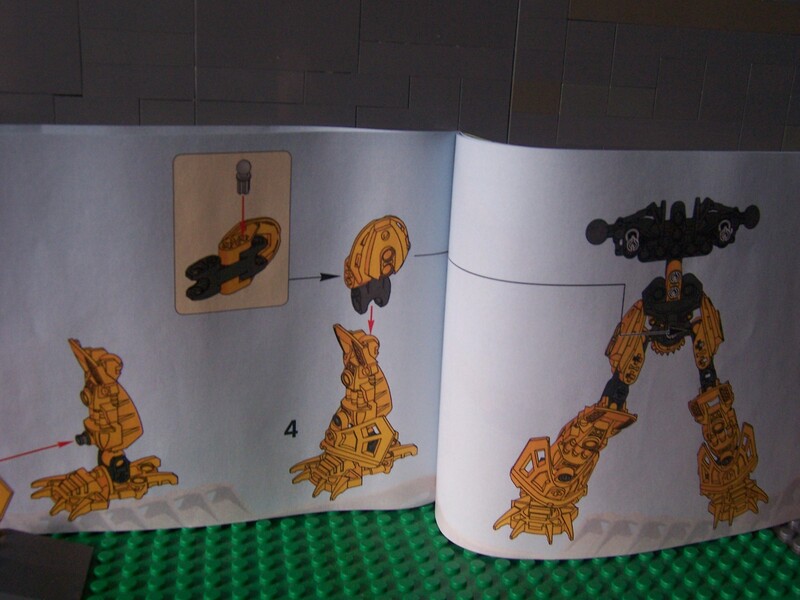 Building time: It takes longer to open the packaging than it does to build the figure. 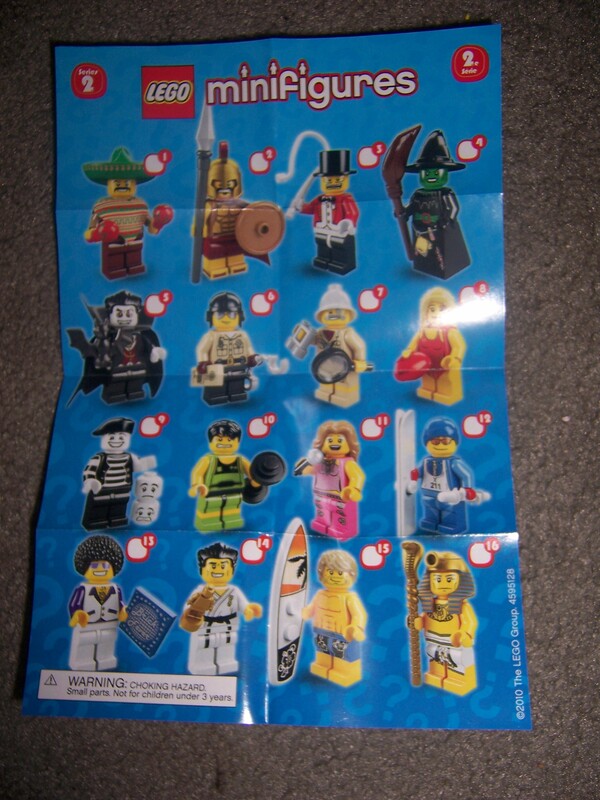 As you can see the Collectible minifigures each come in their own polybag. There are 16 unique figures per series. Some are more common than others.For example, there will be 5 traffic cops per box whereas there are 3 spartans per box. Each figure offers something magnificent that everyone will enjoy. Each box of figures contain 3 complete sets and 12 random spares. Each packet has a barcode on the back. In North America, the special barcode is on the right. The rest of the world has the special barcode on the left. 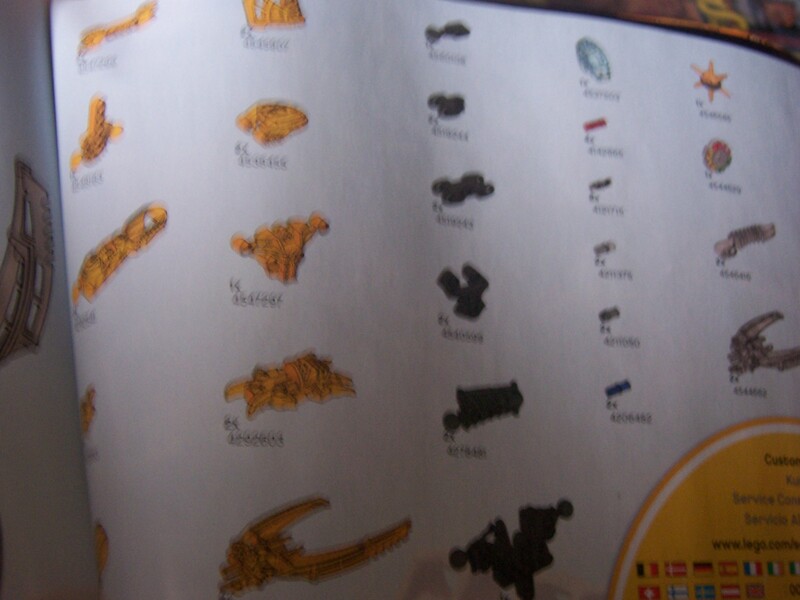 These special barcodes can be used to identify each specific minifigure. 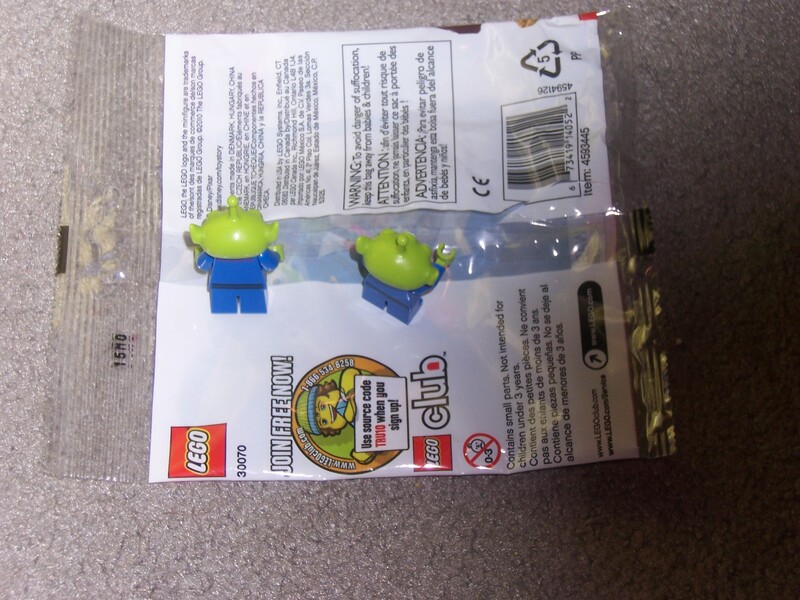 Both series 1 and 2 have barcodes. 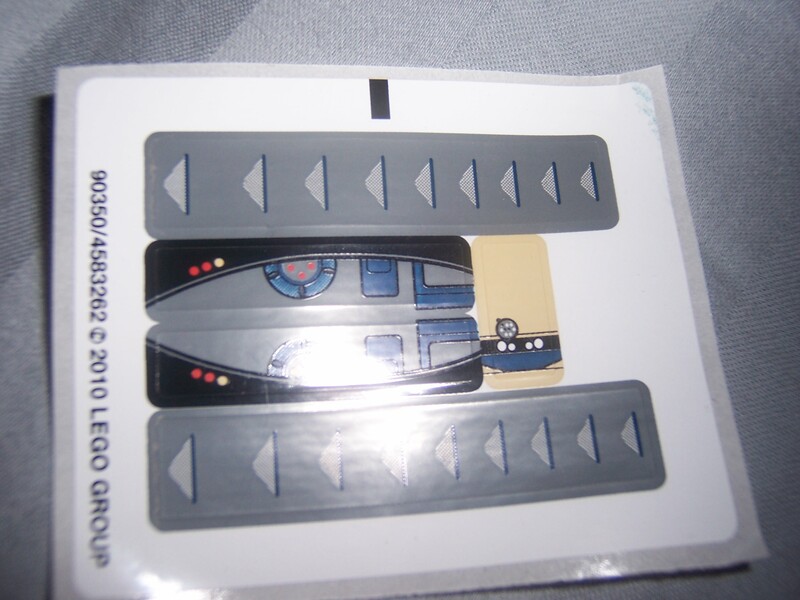 It has been said that series 3 will carry no barcodes. 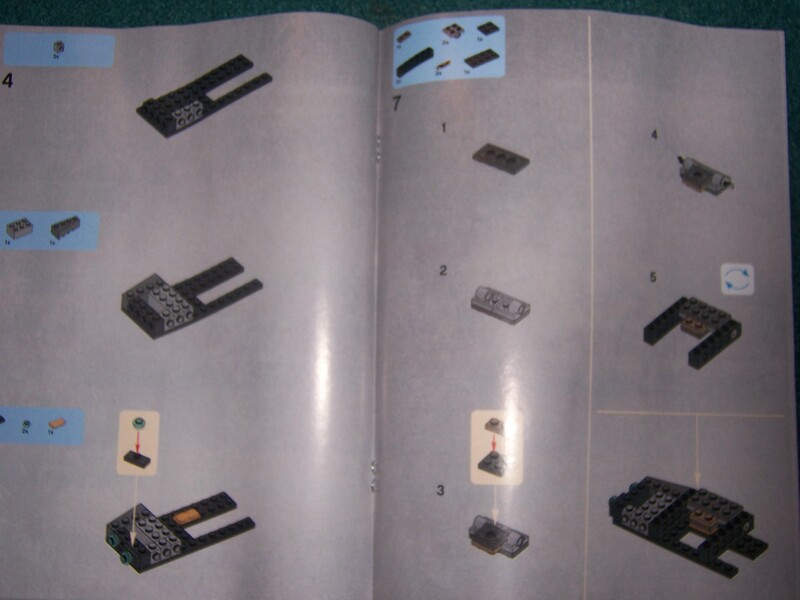 The barcodes can be found via Brickset.com(Series 1 and Series 2). Series 2 can be found at various places like Cosco, Target, Lego (in store or online), Toys r us, Independent Toy stores, Walmart, Argos, and many other stores. 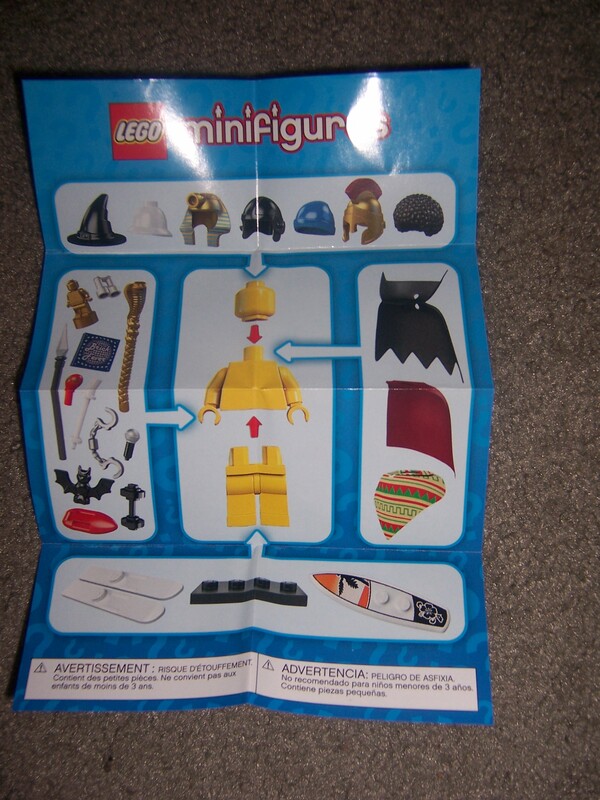 Lego even provided instructions to show how the minifigure is built. These instructions make it harder to feel a bag for those without the barcodes. 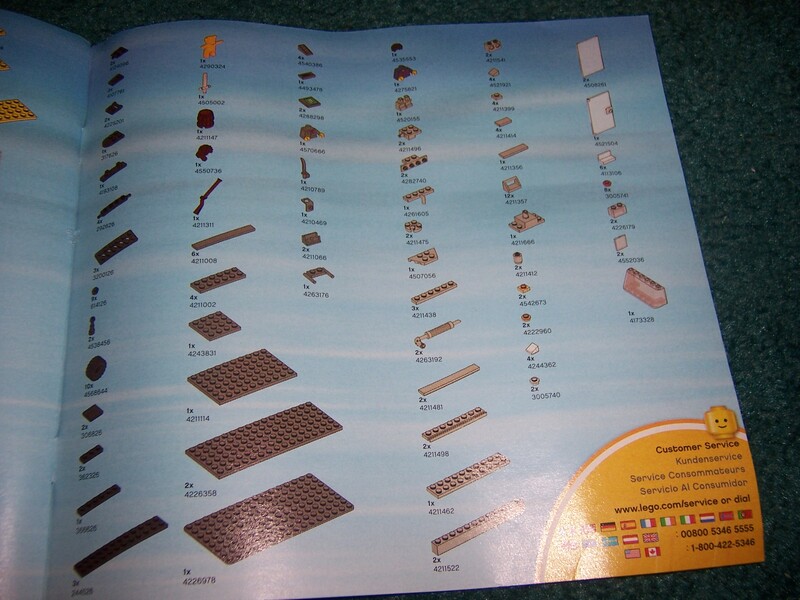 The other side of the instructions shows the whole group of 16 from series 2. 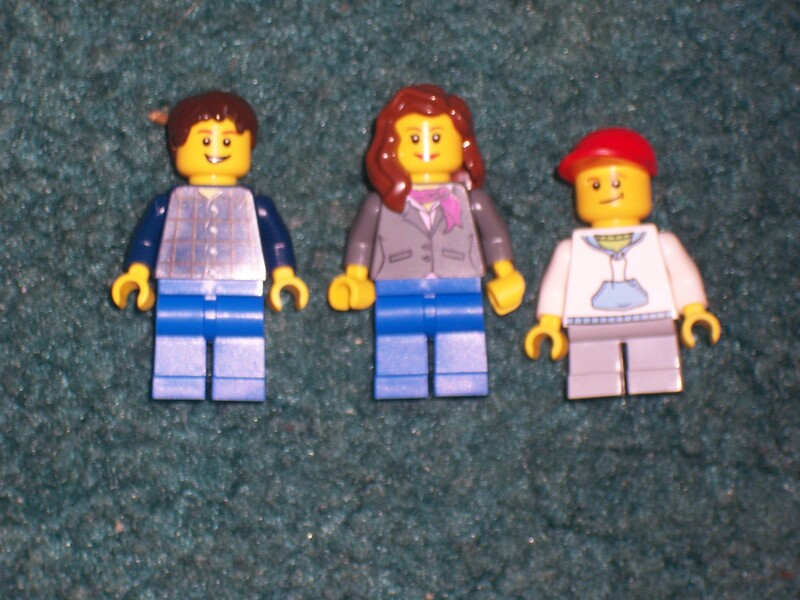 There bios can be found on the official Lego website, Link. The most unique and highly anticipated figure from this series. I give you the Spartan. 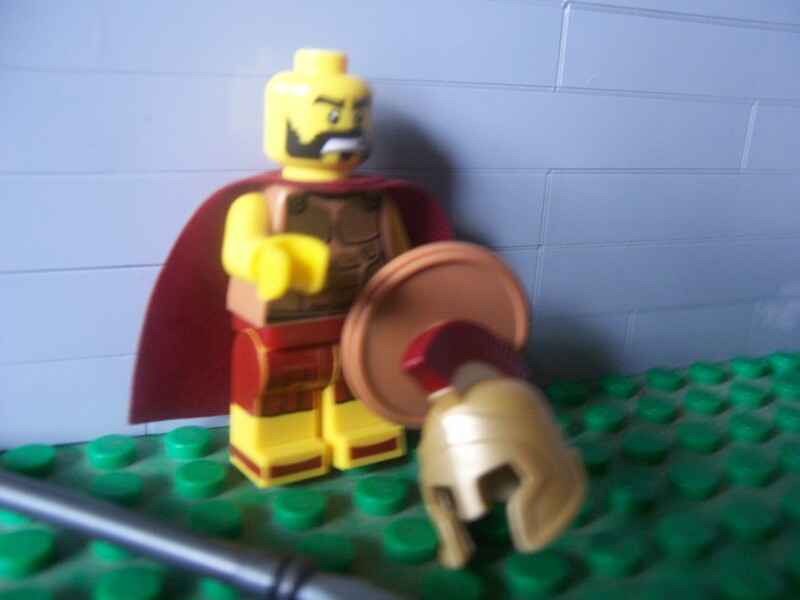 Just looking at him makes you want to yell ”This is Sparta!”(300). Sadly, the Spartan and the rest of the figures in this series have no backprinting. On the upside, the spartan does have side print. Many collectors will want to build armies of this guy. There are no extras with the Spartan. Up next is the Skier. Three new pieces are featured with this guy. 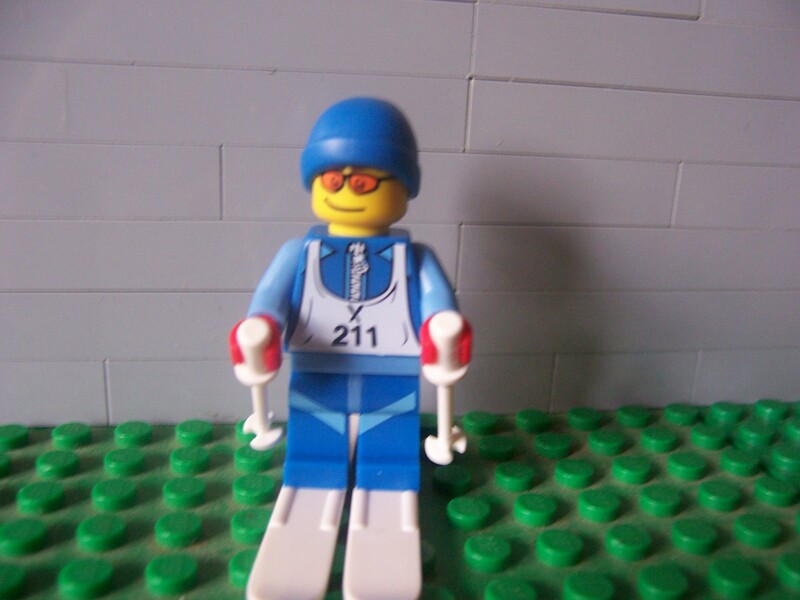 You could make a whole skiing Olympics with this minifigure. Of course though they would all be number 211. 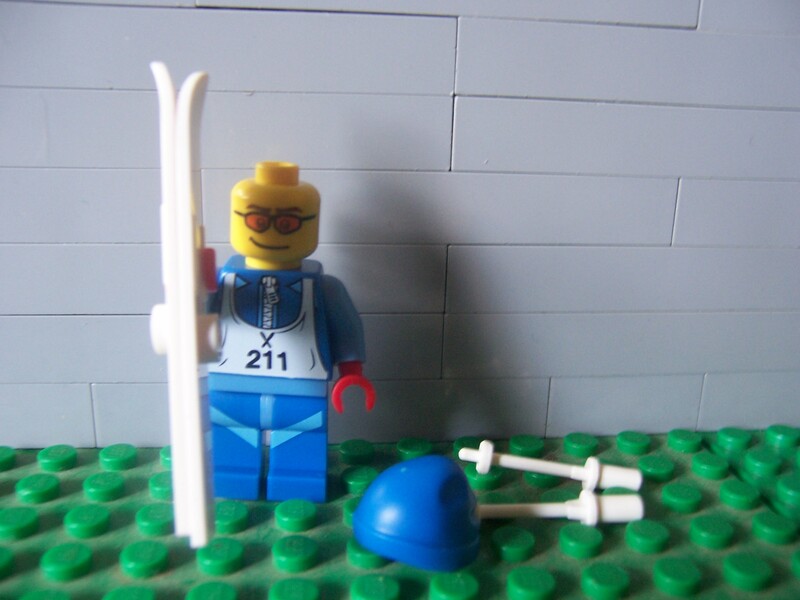 The skier comes with an extra ski pole. 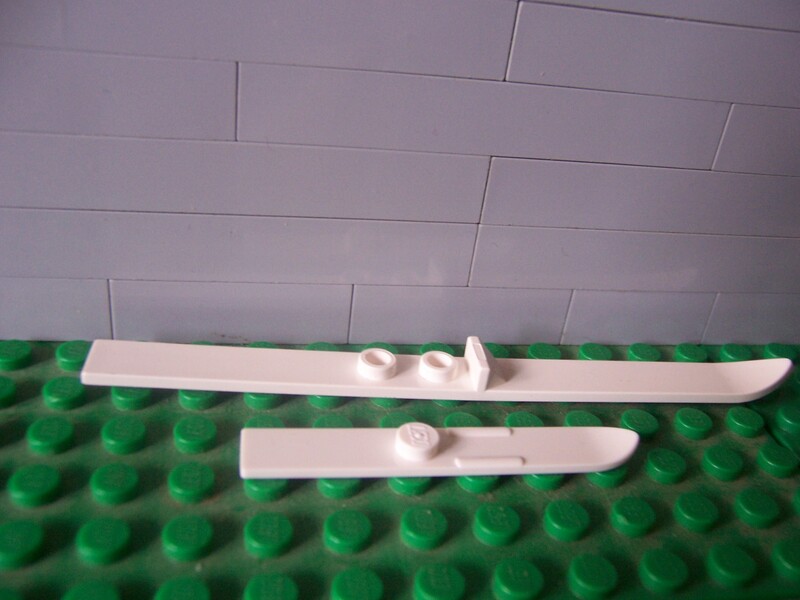 The ski boards are brand new and fit minifigures much better than the old ones. 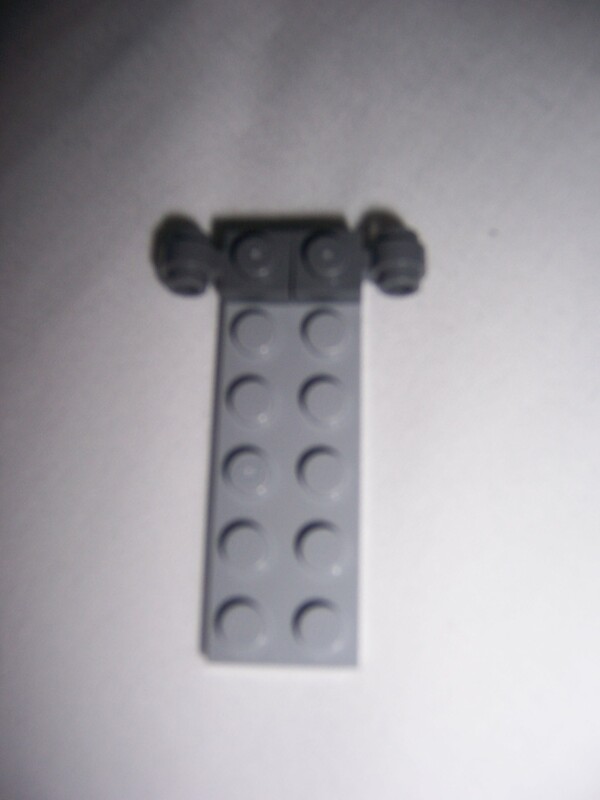 Both of the ski boards can fit into one minifigure hand. 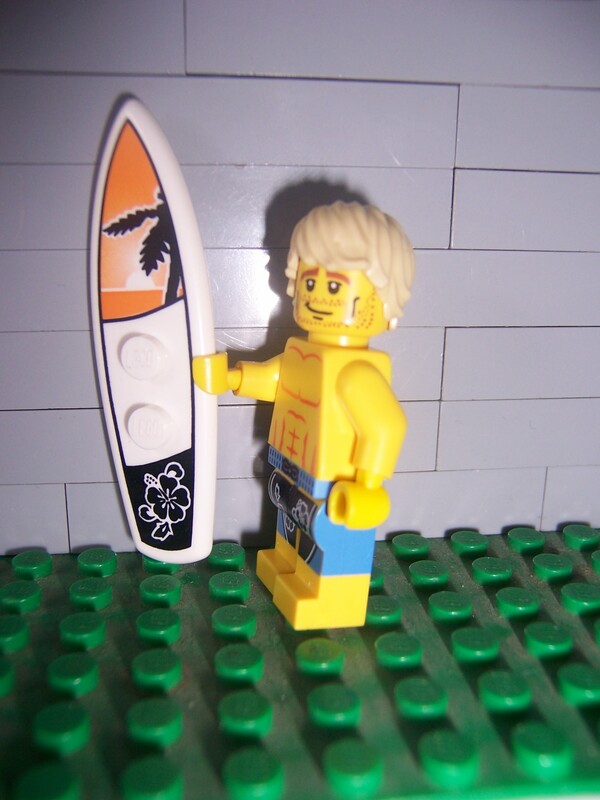 Let’s catch a wave with the Surfer, dude. 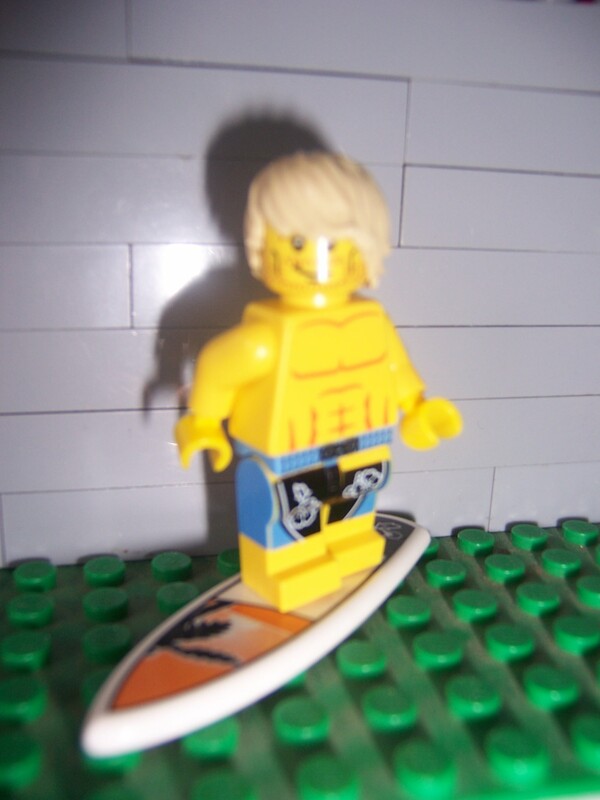 The surfer also comes with an updated piece to fit minifigures, the surfboard. He also has side prints for his pants. I really do like this new hairpiece that was introduced in series 1, it really makes him look like a surfer. There are no extras with the surfer. Lets hit the streets of Paris with the Mime figure. He comes in a black and white format to draw a world without sound. He comes with 3 faces to express Happiness, Sadness, and Fear. Definitely a must have for City collectors. 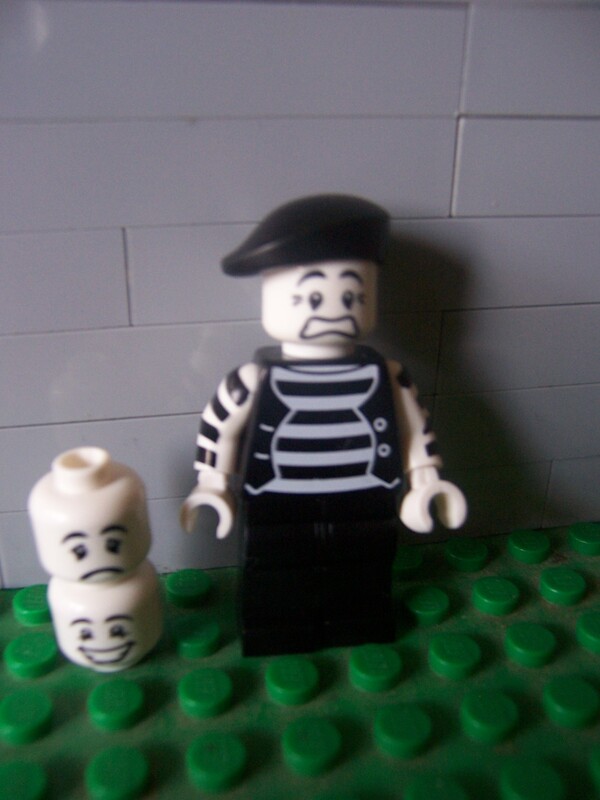 The mime even has a black beret which can be used as an artist minifigure, hopefully, series 4 will have an official artist. The mime has no extras. Go head backstage with the singer. The new microphone will be a great add on to Rock concert, tv shows etc. She also has a new hairpiece in light orange. Hopefully in a future series there will be a Guitar player to go along with the singer to make a full rockband! 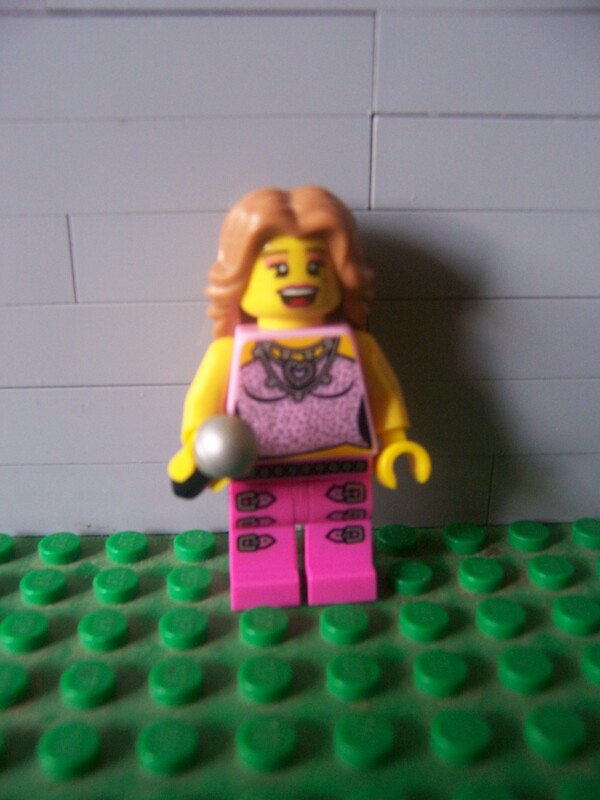 She comes with an extra microphone. 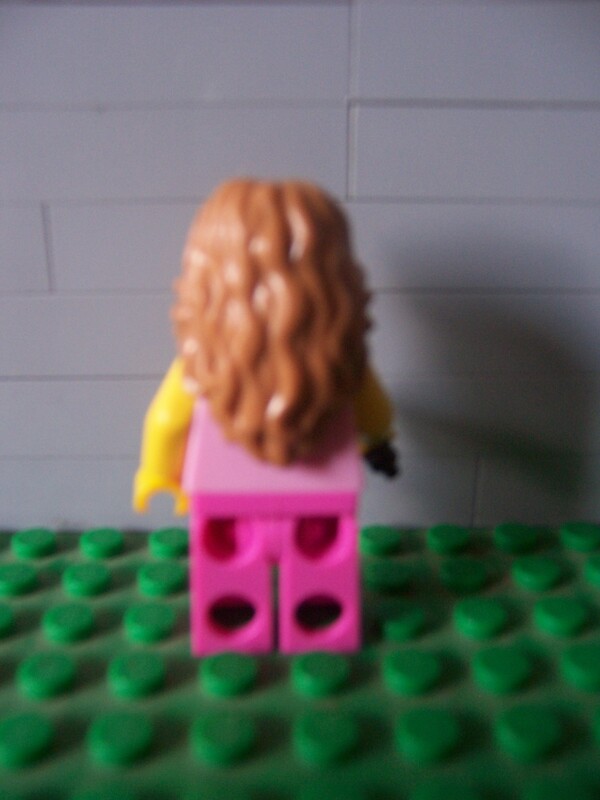 The back of the hairpiece. 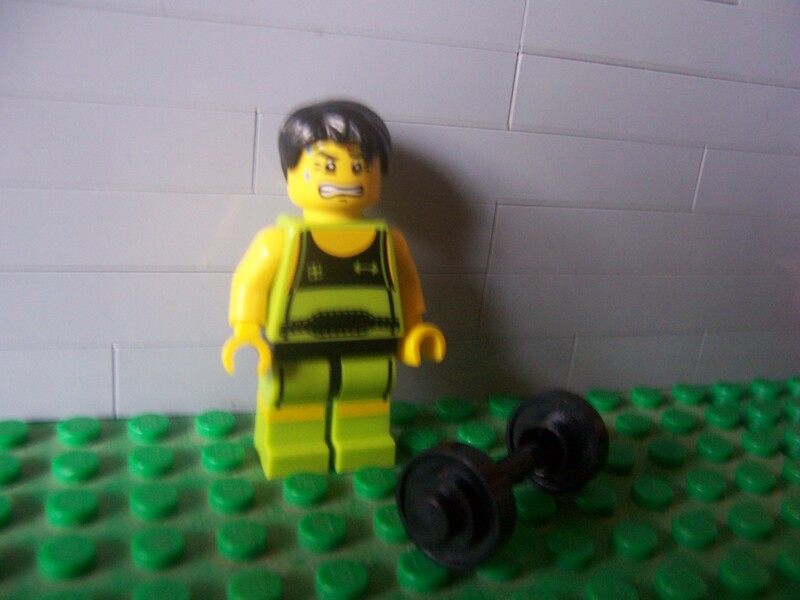 Lets head to the gym with the weightlifter. He comes with 2 new elements. 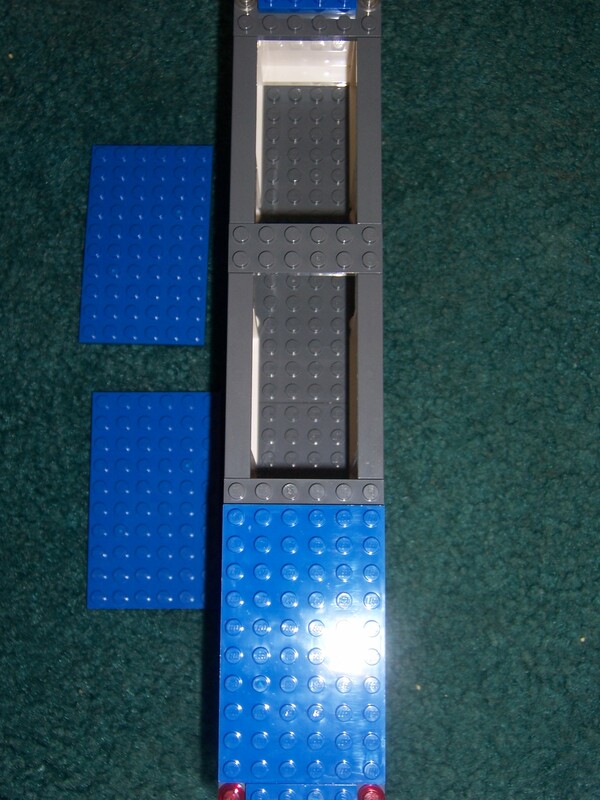 A black 3L bar and 2 weights that can be attached to the bar. Surprisingly he has no muscle armprint. He has no extras. Ready to learn karate with the Karate Master! Hi-yah! He has Count Dookus hair in black. 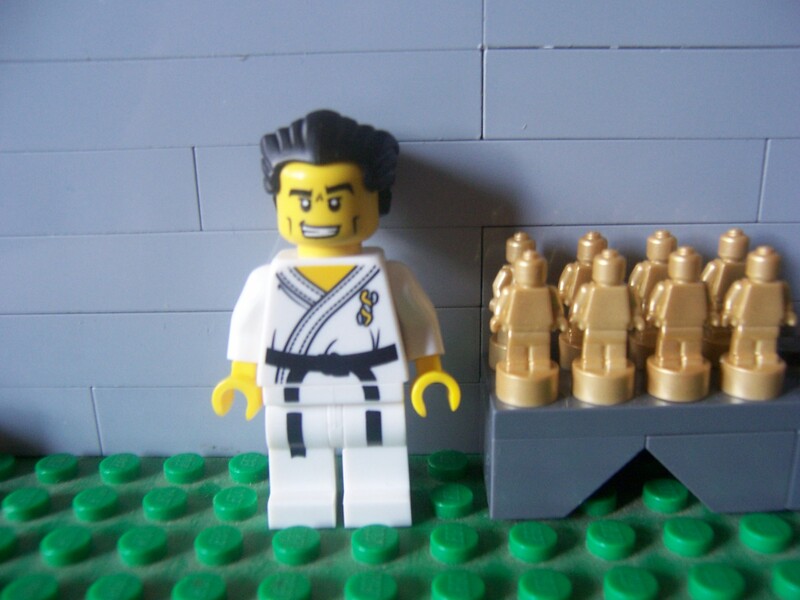 He also has a minifigure award which can be used for award ceremonies. 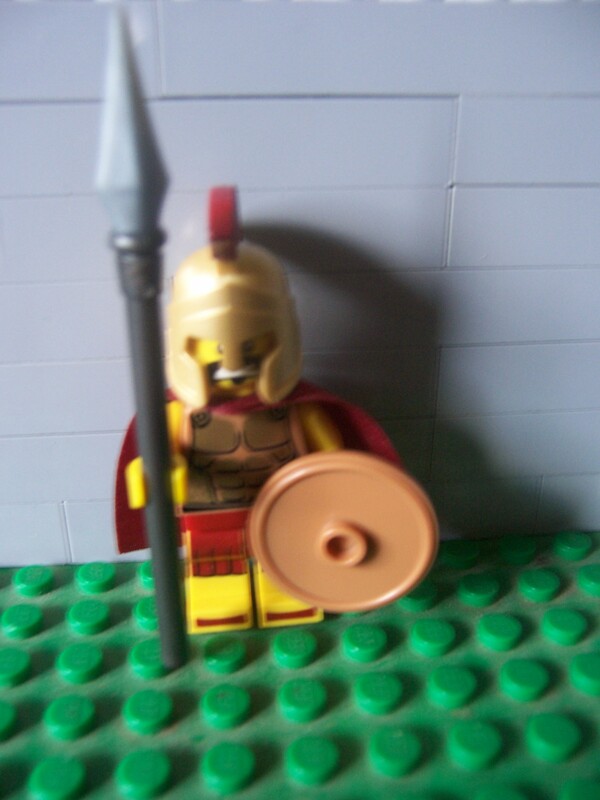 He comes with an extra minifigure award. 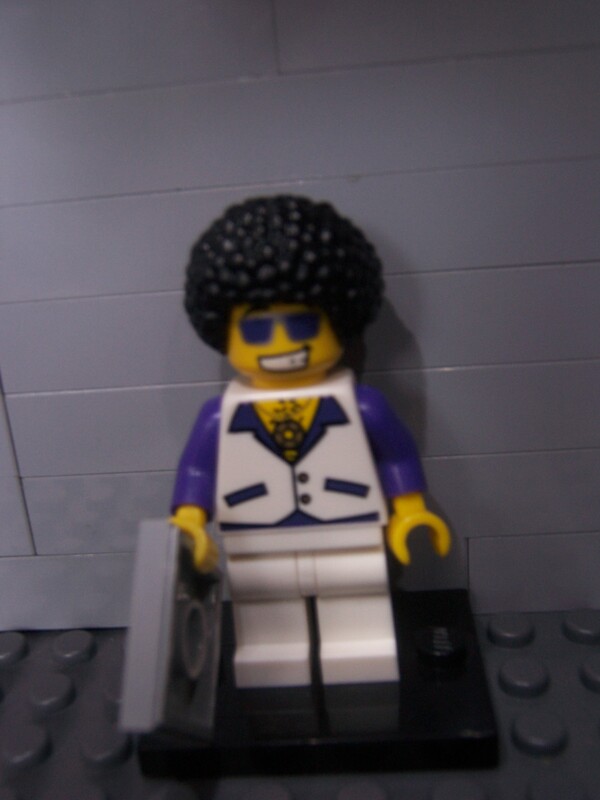 Shake it down on the dance floor with Disco dude. He comes with the series 1 clowns hairdo in black. He also has a Brick fever 2×2 album. He reminds me of Disco stu from The Simpsons. There are no extras. There goes the Traffic Cop in High speed pursuit. 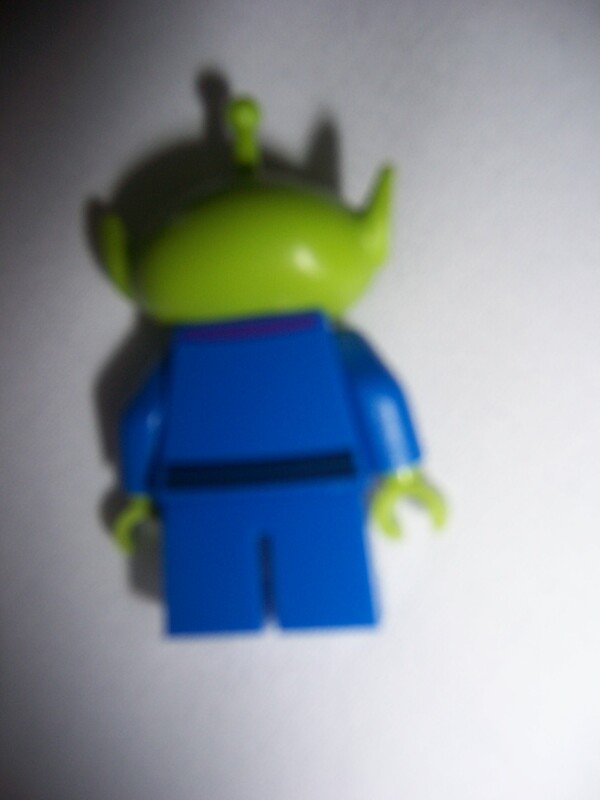 This minifigure has only one somewhat new piece, a oversized 1×2 ticket tile. The helmet appears in Space Police III. The handcuffs also are from the City police sets. He comes with one extra Handcuff. Look its the Wicked Witch of the west. 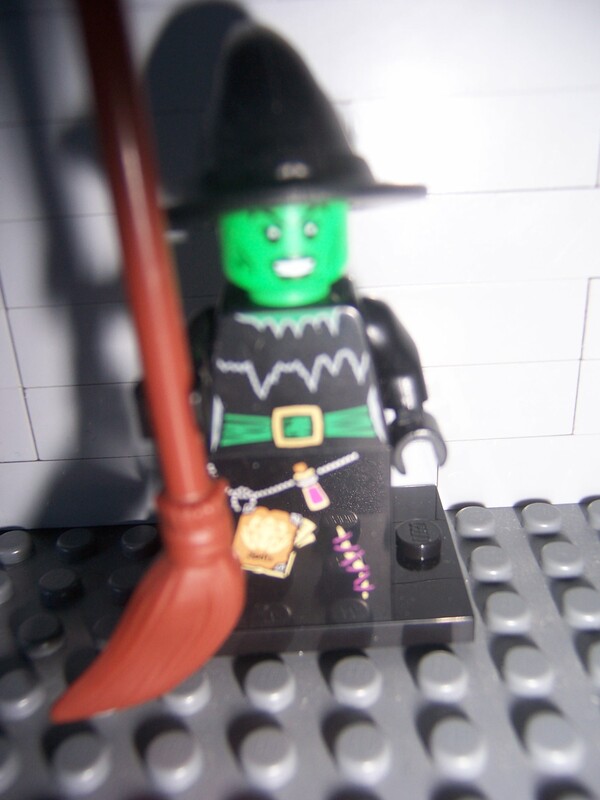 The witch has a decorated 2x2x3 slope as legs, has a black hat, and a slime face. She appears to be inspired by the Wizard of oz. There are no extras. 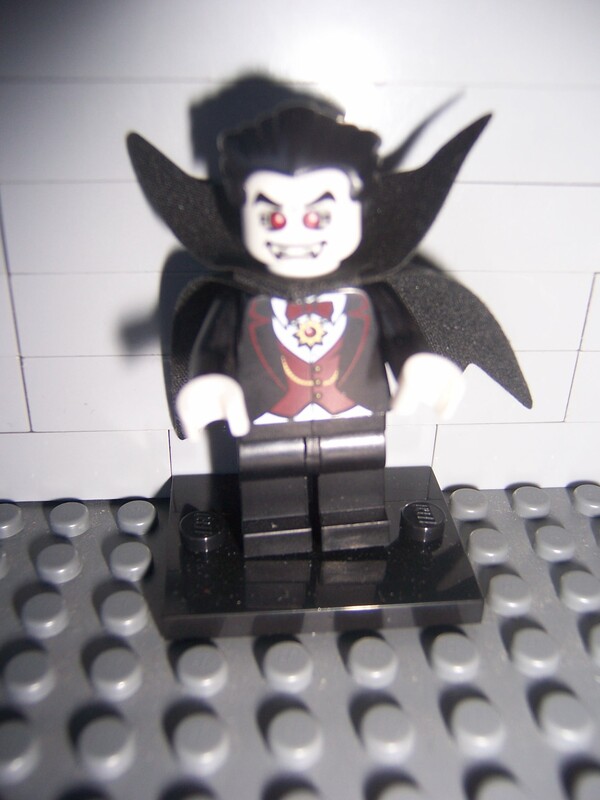 Look out for the blood sucking vampire! 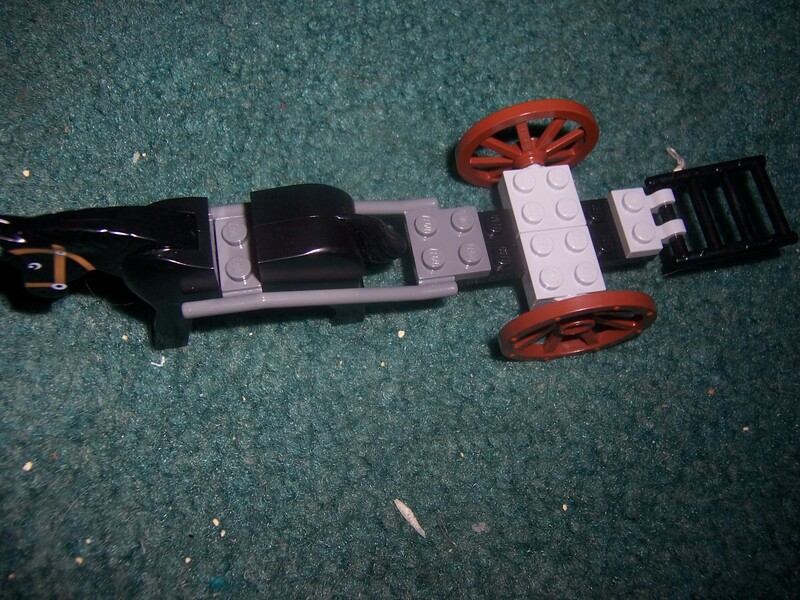 The vampire comes with an awesome cape which is a little complicated on how it is attached to the vampire. He also has a miniature bat. A must have for horror fans. The torso looks like an excellent use for a suit. There are no extras. There goes the lifeguard saving another person from drowning. She comes with the Agents hairpiece in blond and also has a new flotation piece. She goes along with the surfer for a Beach moc. There are no extras. 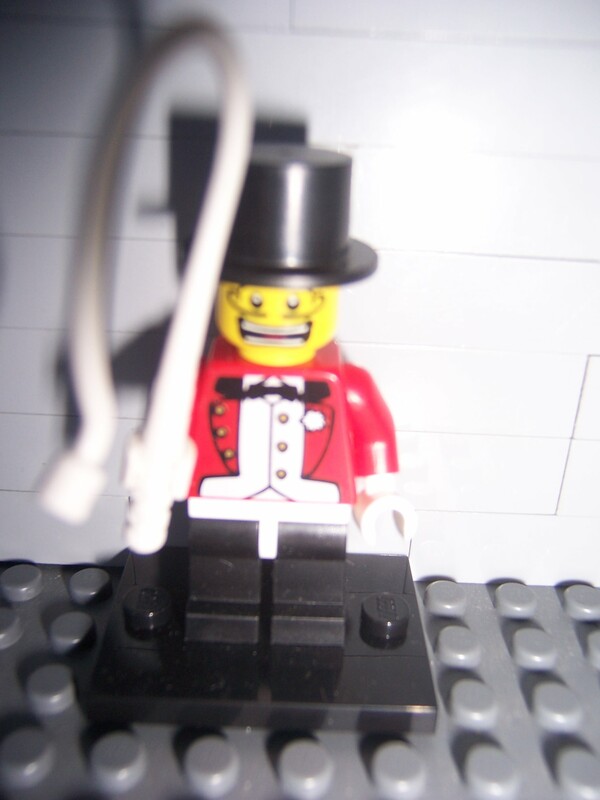 The ringmaster uses his white whip to keep the Lion back. He comes with a Prince of Persia whip in white though. 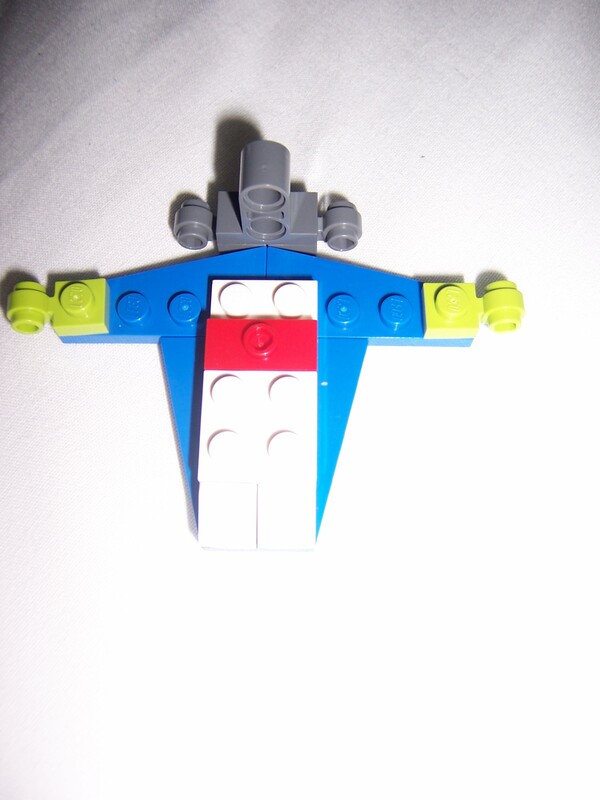 The torso seems to have some use as a tuxedo or a clown figure. He has no new pieces. The explorer wanders the forest look for lost artifacts. The explorer has a magnifying glass that appears to have a different design in the lens part, maybe to discourage kids from splitting the piece into two? He comes with an extra binocular. The mighty Pharaoh sits in his throne watching another pyramid be built. This figure has a decorated crown and a new serpent staff. 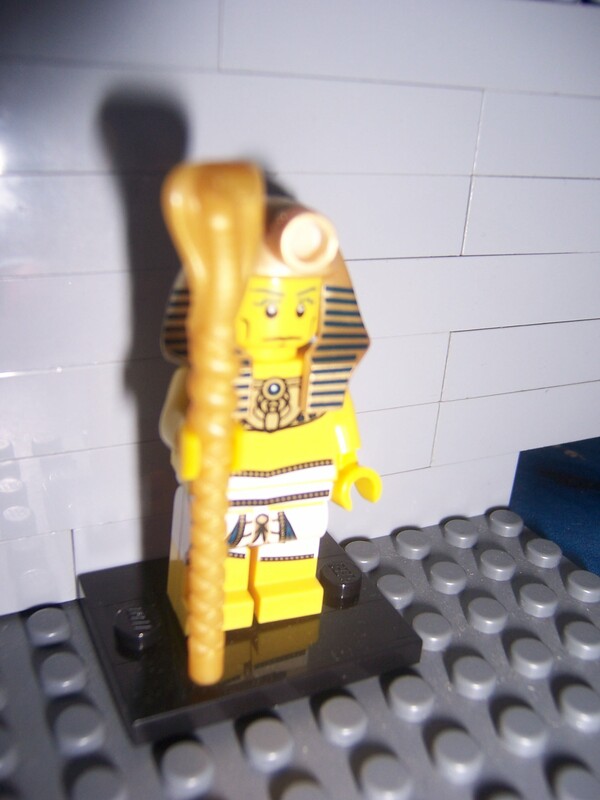 He will be a great add on to the Pharaohs Quest theme next year. He has side leg print.There are no extras. And finally last but not least we have the Mariachi figure. 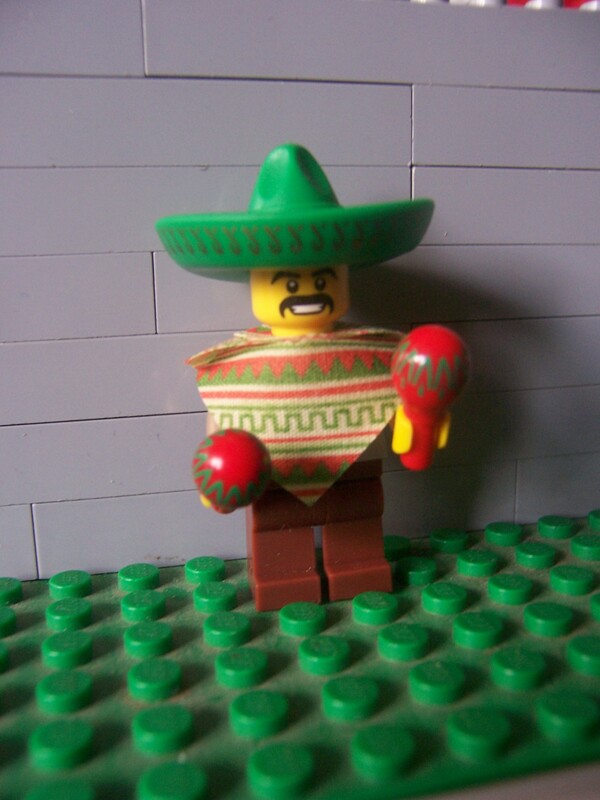 He comes with 2 brand new pieces which are the maracas and his sombrero, he also has a new cloth design. 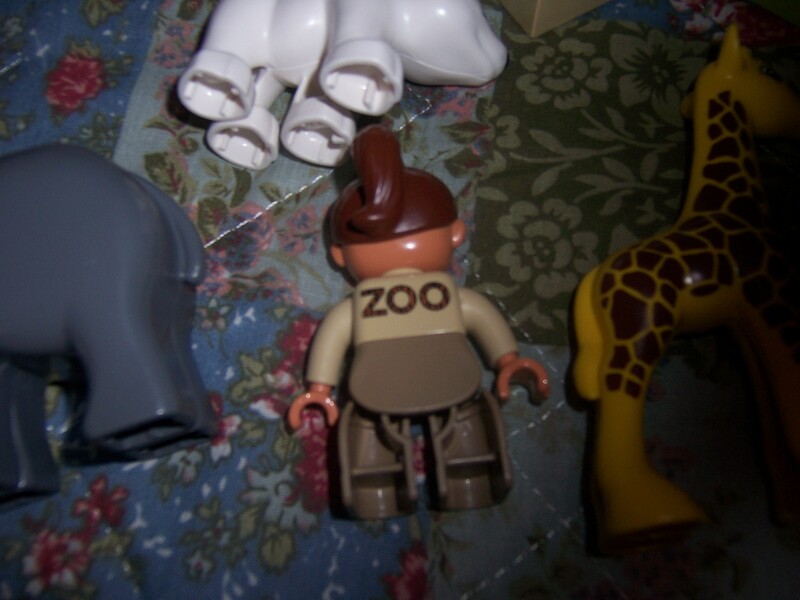 There is no torso print on this figure. 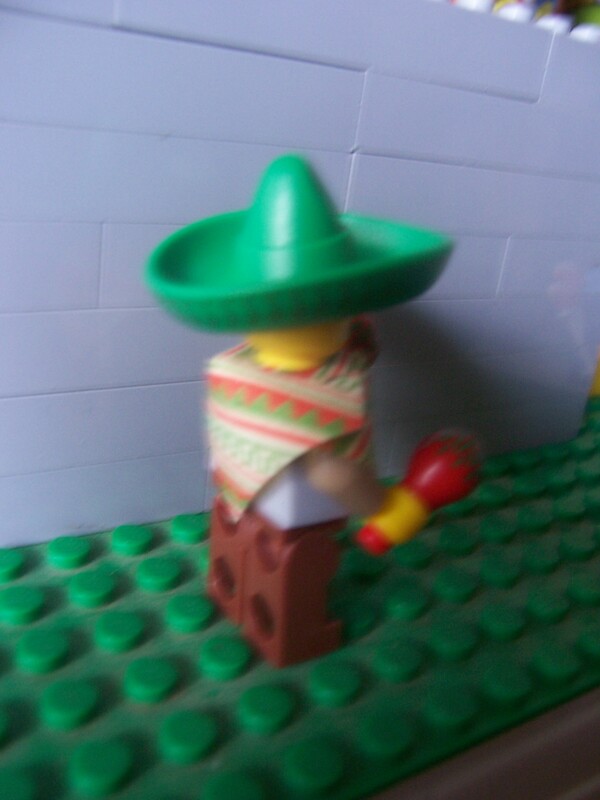 The mariachi figure comes with an extra maraca. The cloth is made up of two pieces that go in the front and back. Design: 5/5 –The printing is absolutely awesome and can be used in different themes. All of the new accessories are very useful. 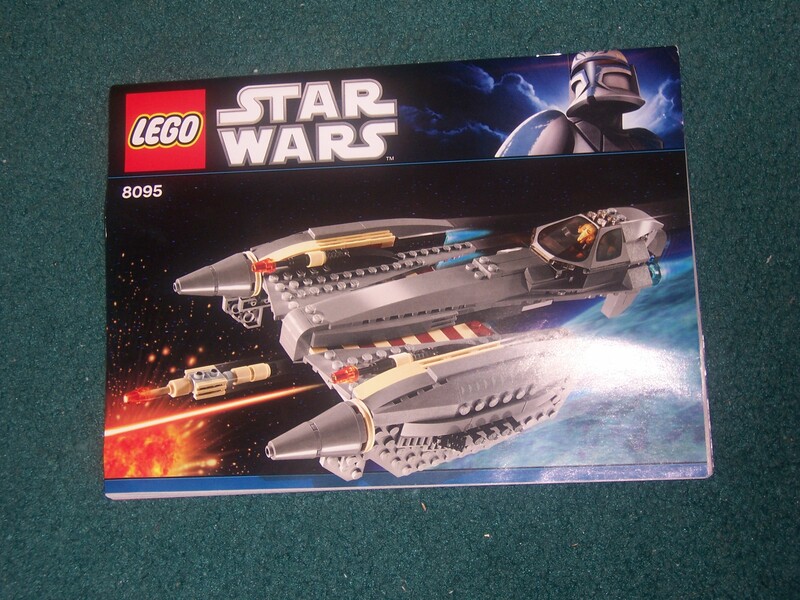 You can’t find these designs in other sets which make these highly collectible. 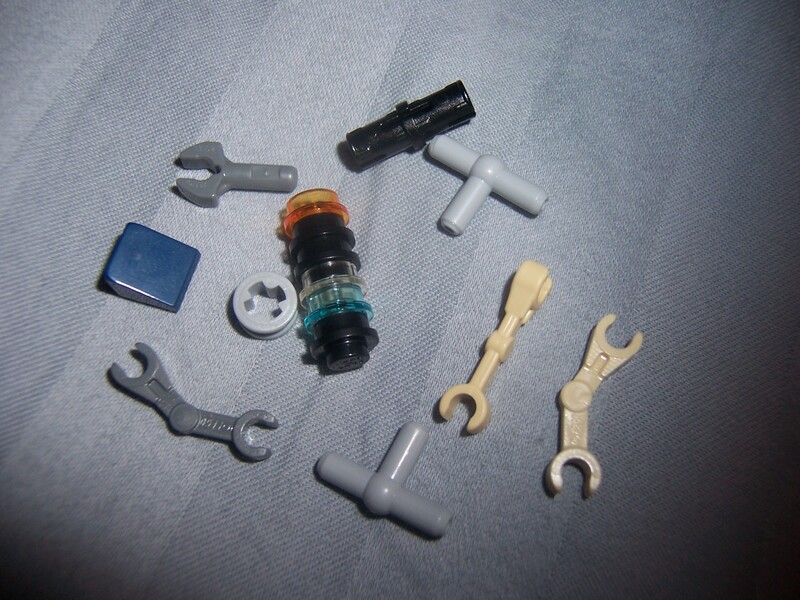 Parts: 4/5 – There are many unique parts that can be integrated into mocs. Most of the parts these figures come with, are special to this series only. 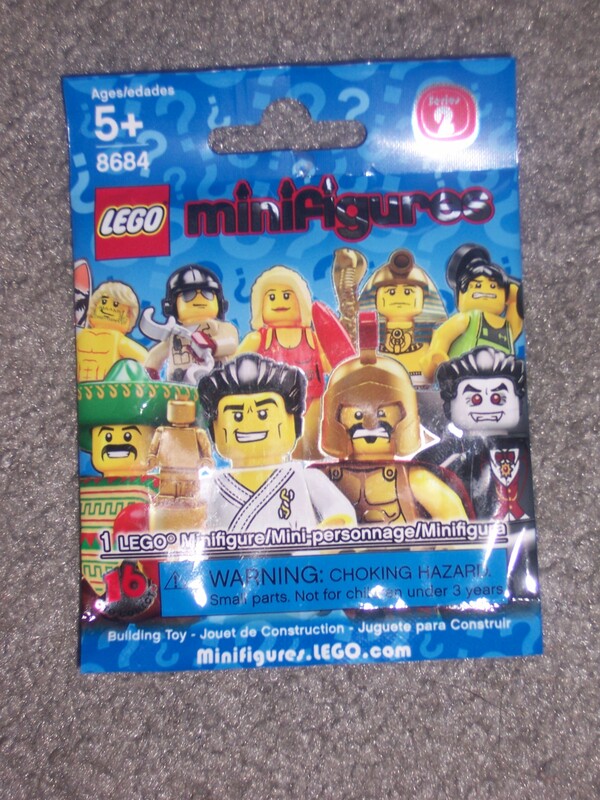 Price: 5/5 – A cheap reasonable price for a cool minifigure. Overall: 5/5- I highly recommend this series for all Lego collectors. 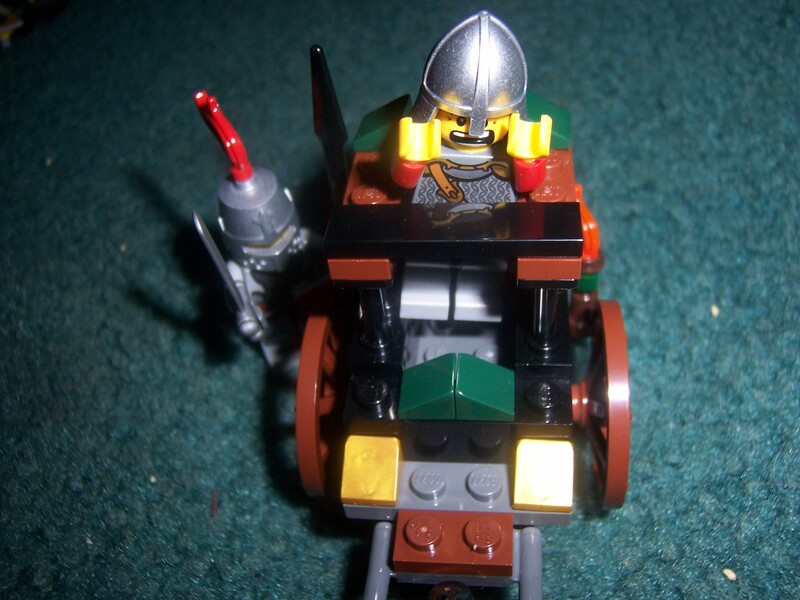 Unique elements, cheap prices, and special one of a kind minifigures. What is there not to like about it? 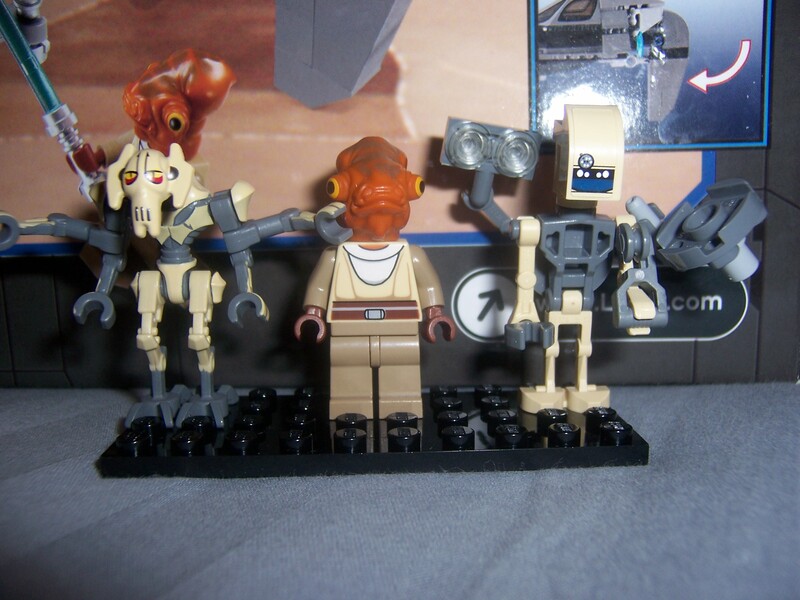 There great for adding on to the minifigure population. I really recommend to get this series complete or at least a few you would want. 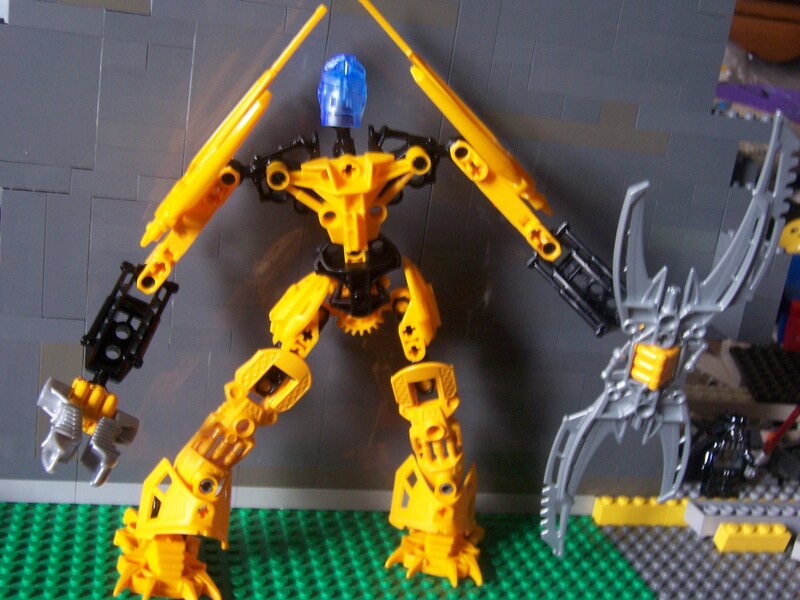 After 9 years of waiting Lego has finally released an official Mata-Nui. Many fans will (hopefully) enjoy this set. The back of the canister shows the rest of the 2nd wave. 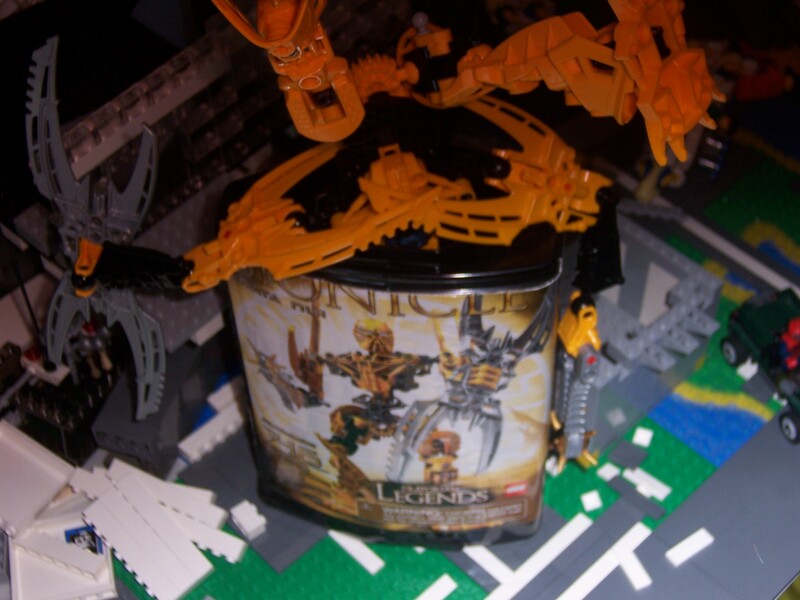 The Bionicle Legend Reborn Movie has a advertisement for it on the back of the top right of the canister. It also has a Choking label and the Bio Code: M74NUI. The bio code can be used here. The image on the instructions are the same as the front of the canister. Random picture of the Building Process. Near the end of the manual there are instructions on how to battle against a Glatorian. Every time you hit the enemy’s canister it brings there life down 1 point. Every time you hit the enemy it brings there life 2 points down. You can use the Life Counter on the back of the Glatorian to keep track on how much life they have left. 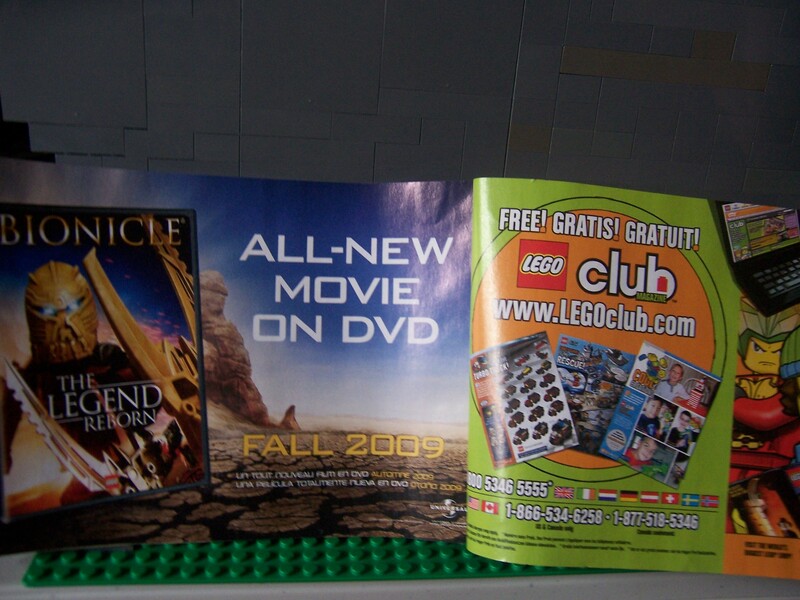 Advertisements for Bionicle The Legend Reborn which is available on DVD and you can join the Lego Club Magazine for free. 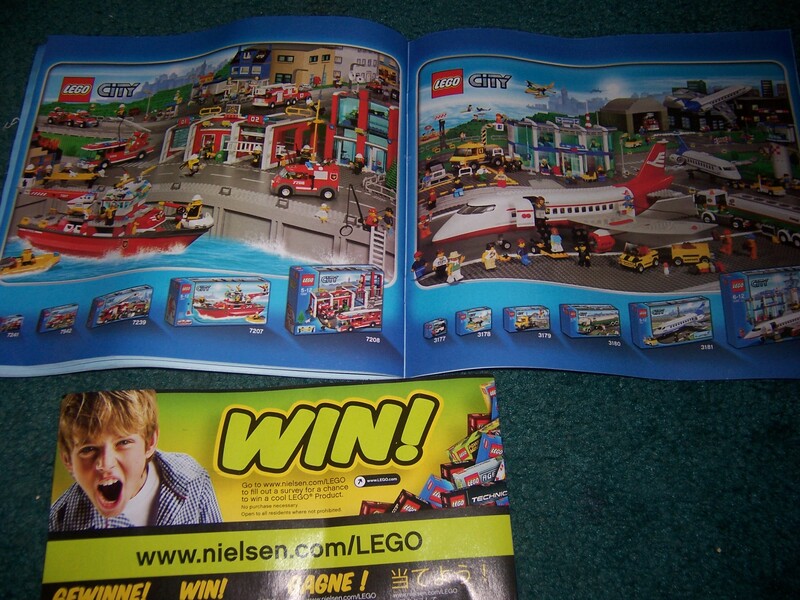 The very back of the instructions shows that you can enter to win a Lego product. 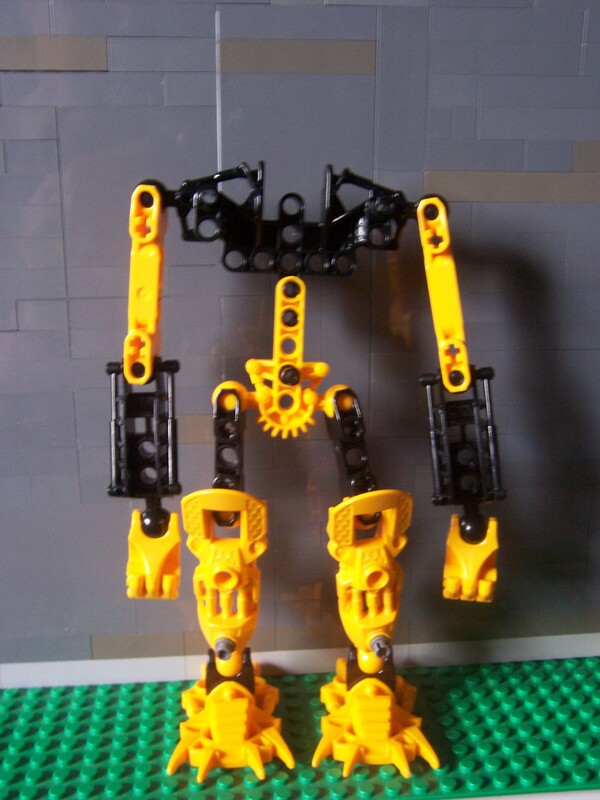 Here’s Mata Nui before he has armor and weapons. The shape of the figure is starting to build. At this stage he looks like a skeleton. Here he is with some armor and weapons. He now has all of his weapons and armor. Almost complete, he just needs his mask. 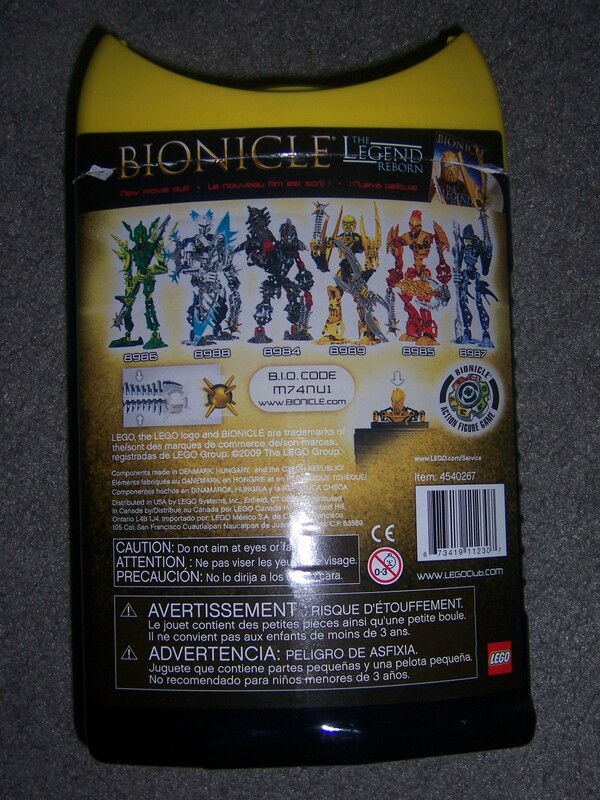 The back of Mata Nui. You have to squeeze the Thornax Launcher in order to shoot at targets in range. 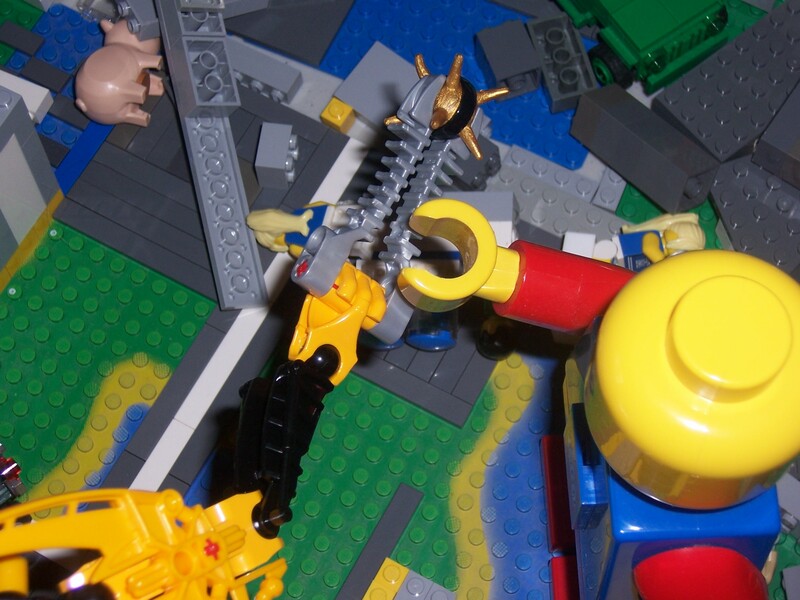 You can see that Mata Nui stands Tall to the Lego Flashlight and average minifigure. 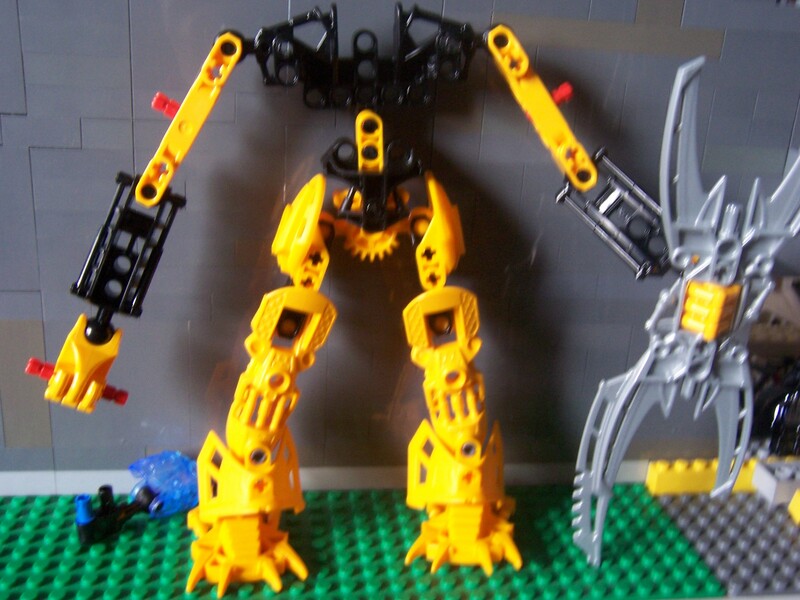 Though the Bionicle Inikas stand taller than Mata Nui. 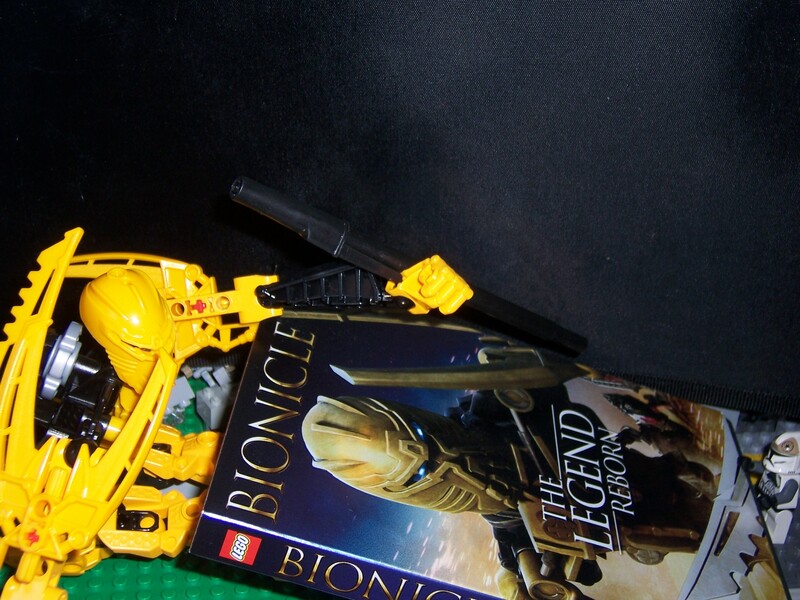 Mata Nui can be stored back in his canister with a few pieces removed from him. 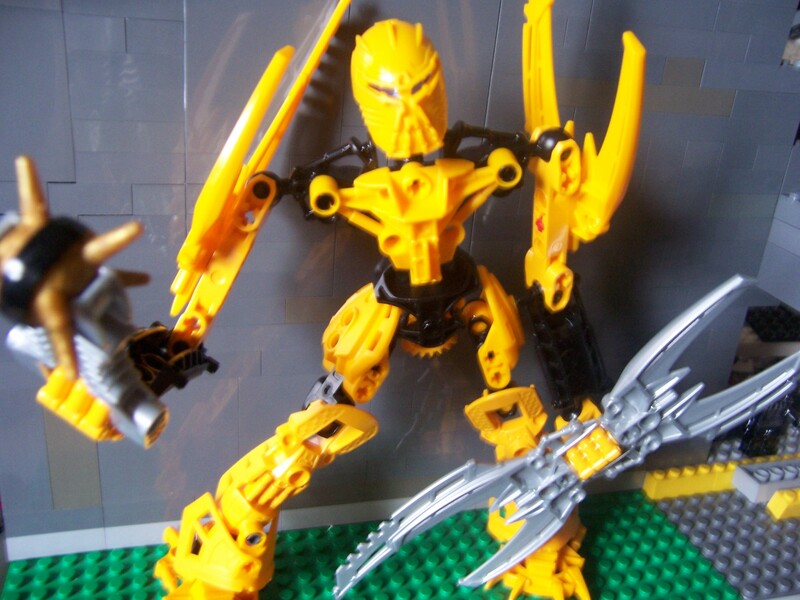 Design: 3/5 – A few simple changes to the armor, mask and weapons to make each Bionicle stand out. 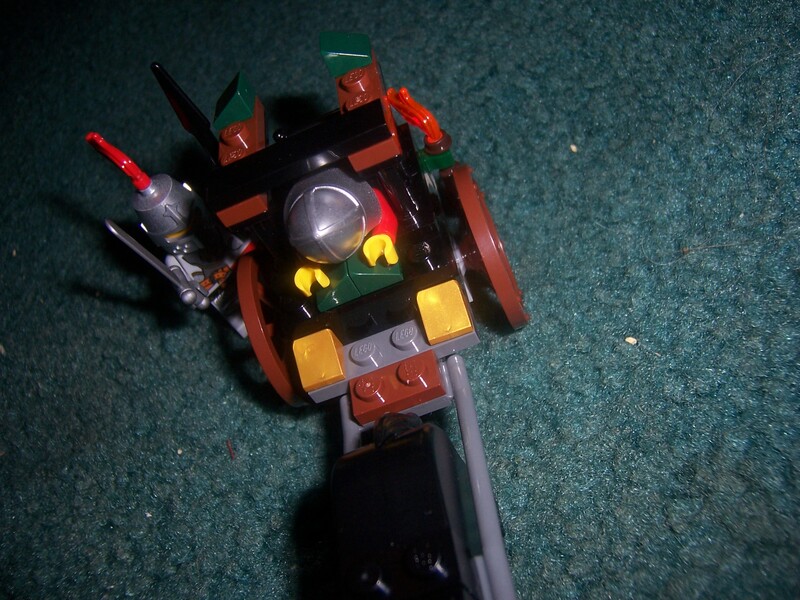 While moving his arms around his shoulder, his armor can whack his head which does get annoying after a while. 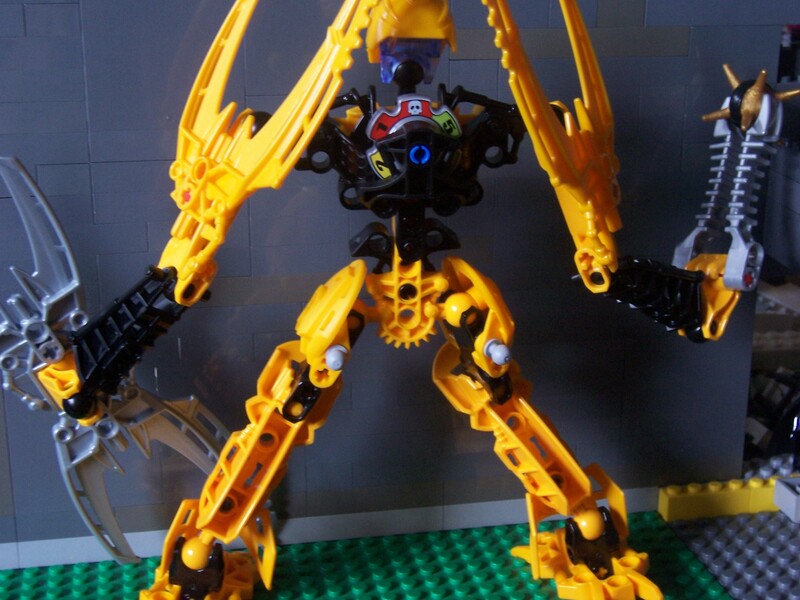 Build: 4/5 – This build will be familiar to other Bionicle sets and will make you at home while building this set. Playability: 5/5 – He’s an action figure, ’nuff said. 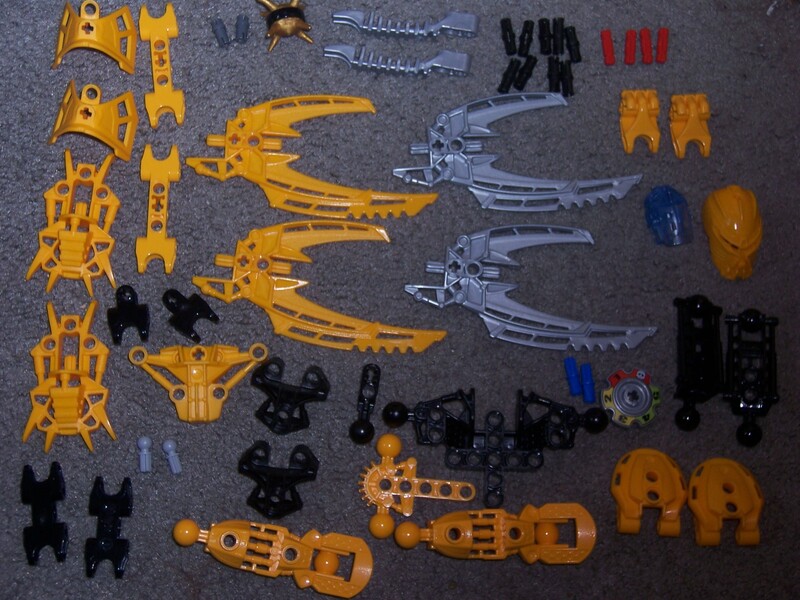 Parts: 4/5 – Some useful mocing parts that Bionicle fans will like. His head comes in Gold in set 8998. 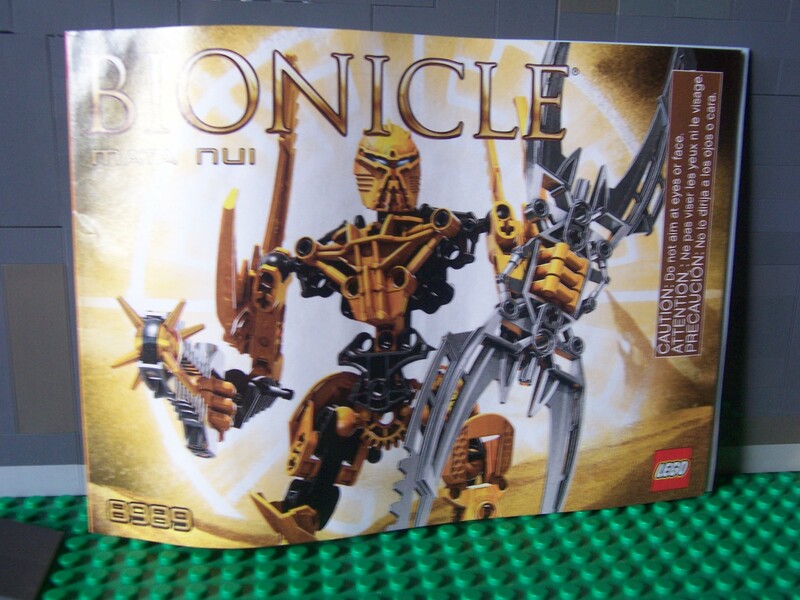 Price: 2/5 – He only comes with 52 parts and is charged at $13. The price should be lowered due to the lack of parts. 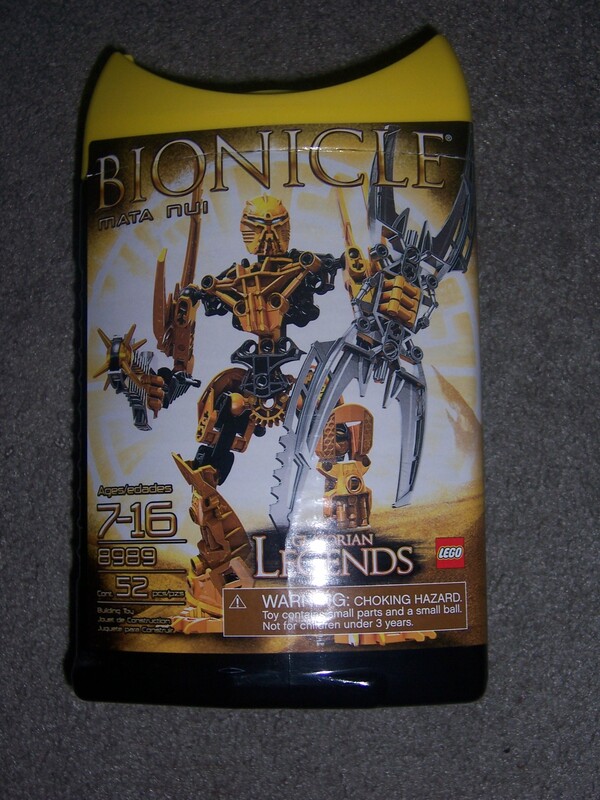 Overall: 4/5 –Even though the price is expensive and there’s some design flaws, he is a must have for collectors and those who have been waiting for Mata Nui to finally be released as a set. Here’s the Main Star of The Legend Reborn signing his DVD to a fellow fan. 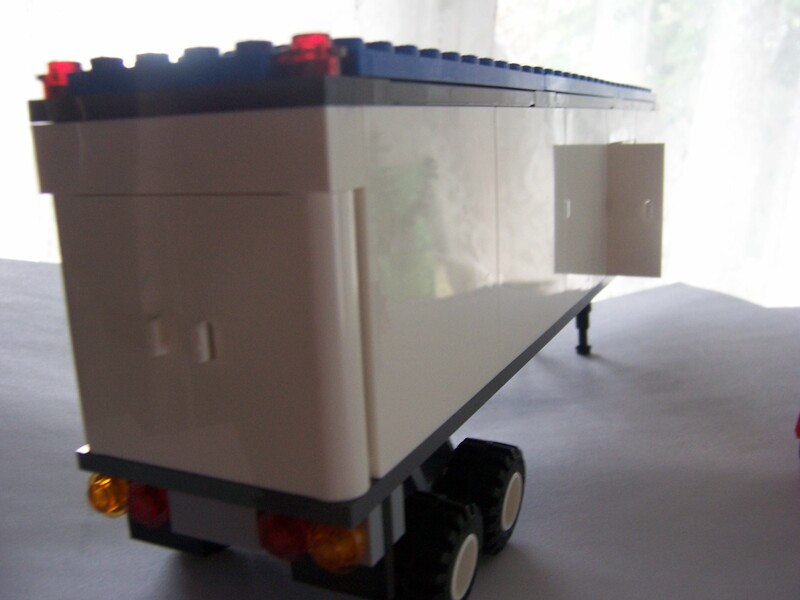 Here comes the Toys R Us truck to make its latest delivery of Lego Sets to Toys R Us. 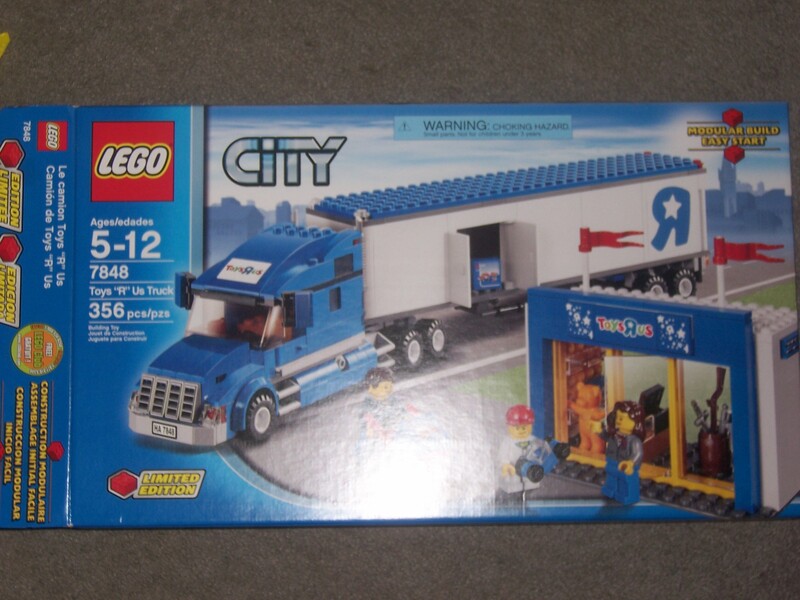 The front of the Box shows a fresh delivery of toys being dropped off at Toys R Us. 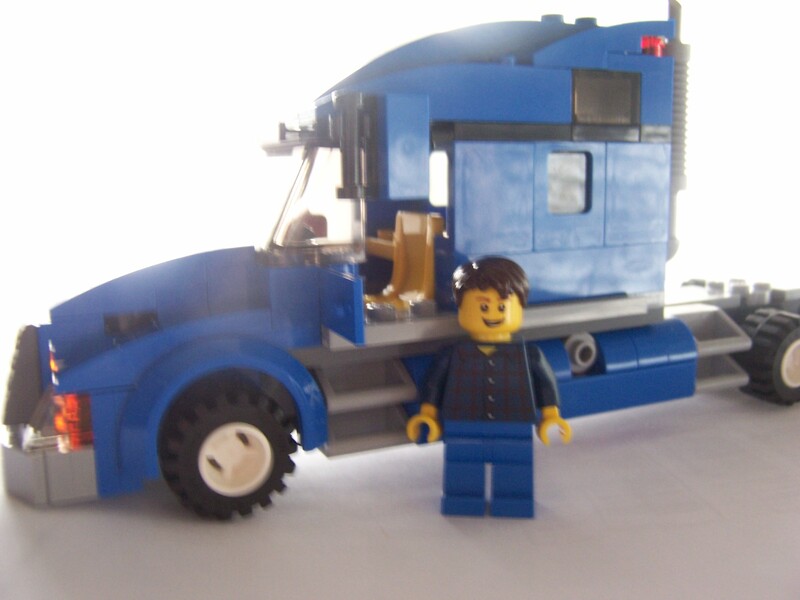 This set comes with 3 minifigures: A Toys R Us Clerk, Truck Driver, and a Customer. 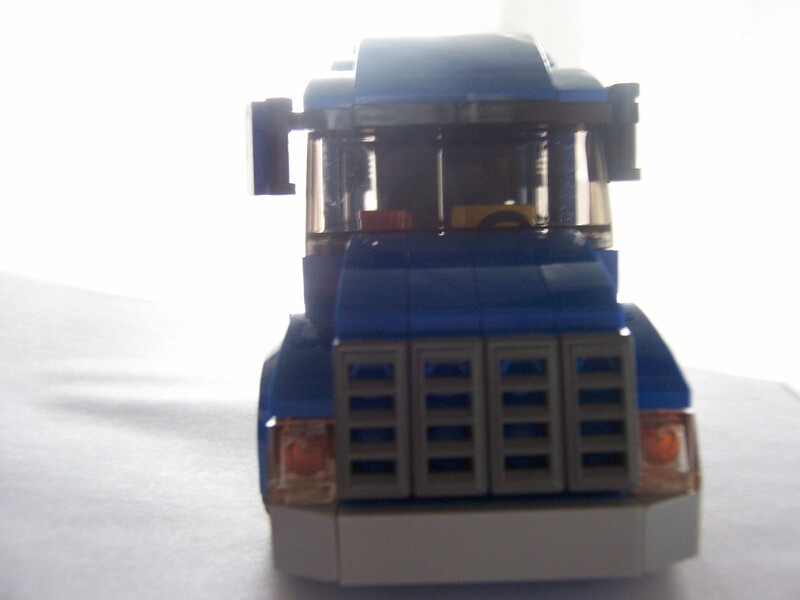 The Truck Driver is the same as 3221. The Child Customer is the only one with backprinting. 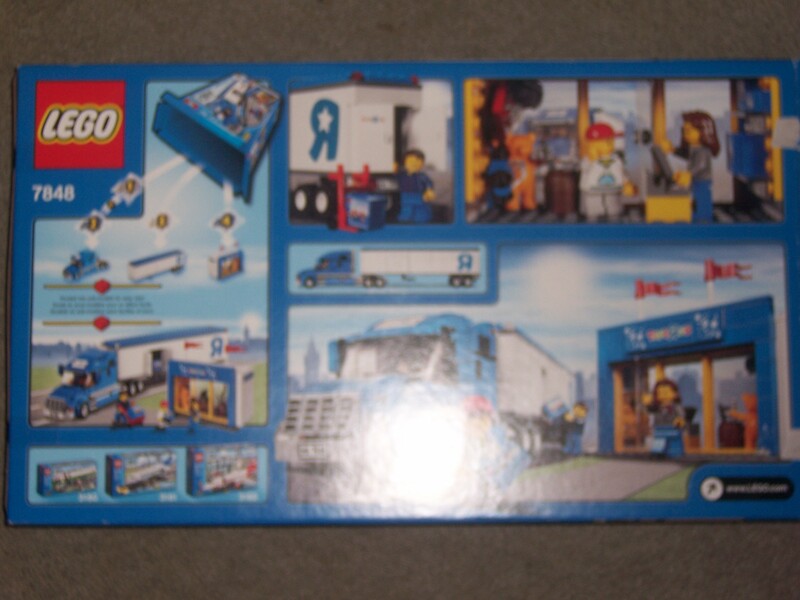 As you can see, the sticker sheet includes stickers for The Truck, The Store, and the Lego sets. There are only 3 pieces in the set that are printed( 2 monitors and 1 KeyBoard). Note: I won’t be putting any stickers on the store or truck. 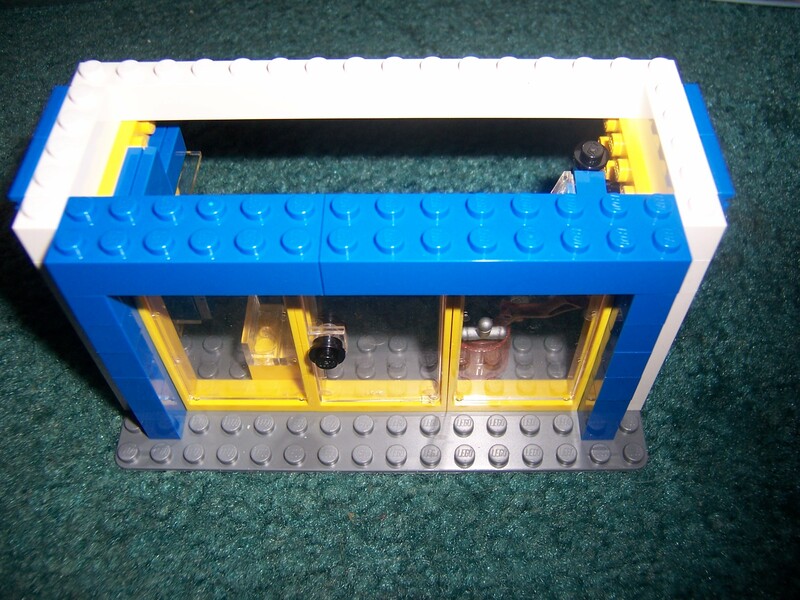 The Yellow door frames are new to this set. Also the Teddy bear only appears in this set and the Bellvile 2007 Advent Calendar. The sign on the front of the store uses 2 2×2 and 1 2×4. Each tile gets its own sticker. 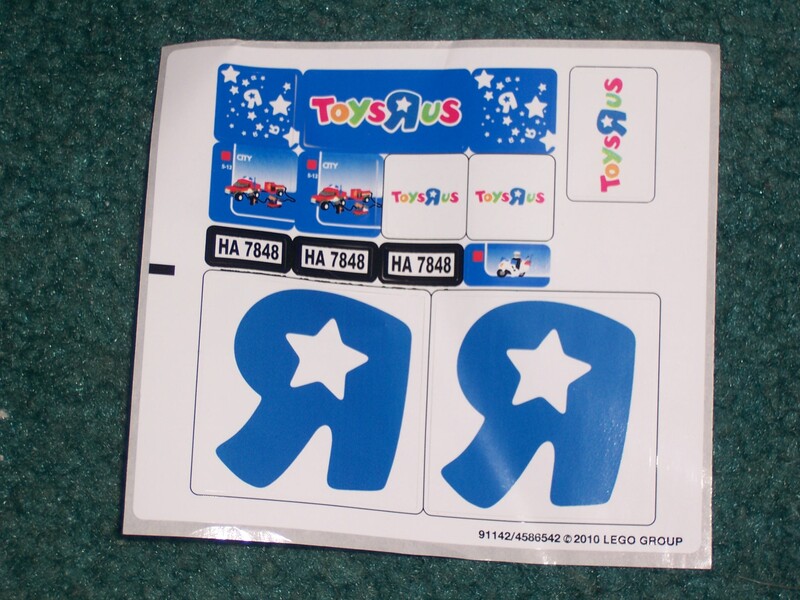 It would have been better if Lego had printed the Toys R Us sign instead of using stickers which take time to adjust as one whole sign whereas printed tiles would have been easier to use. Back of the store. The 1×2 transclear panels look very good as shelves. The yellow 4×6 plates are held up by a 1×4 headlight piece. The storage part of the truck. 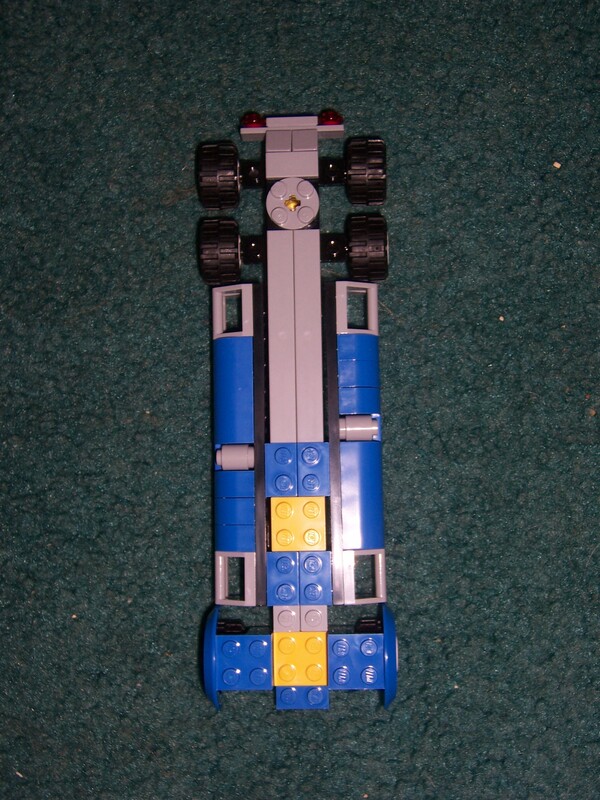 Design: 4/5 – The Truck is based off of the Lego Truck. 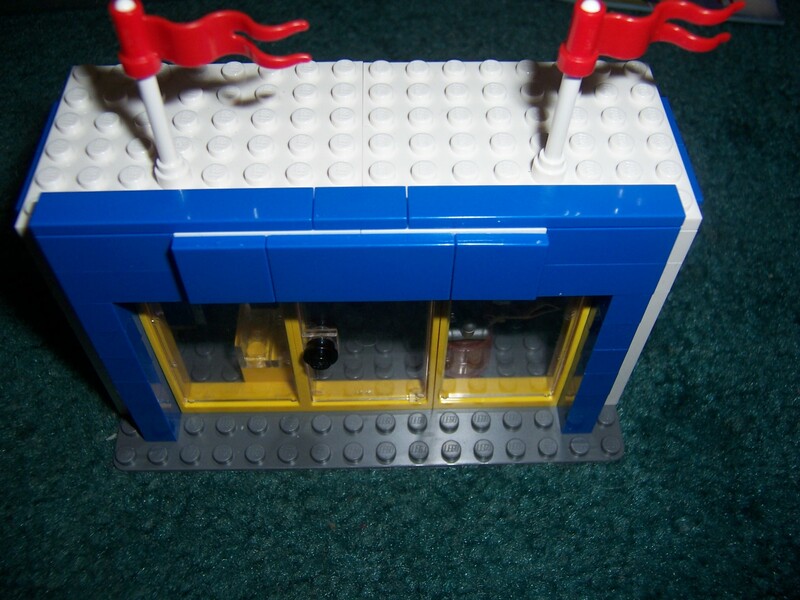 The store design is small but a good simple add on. 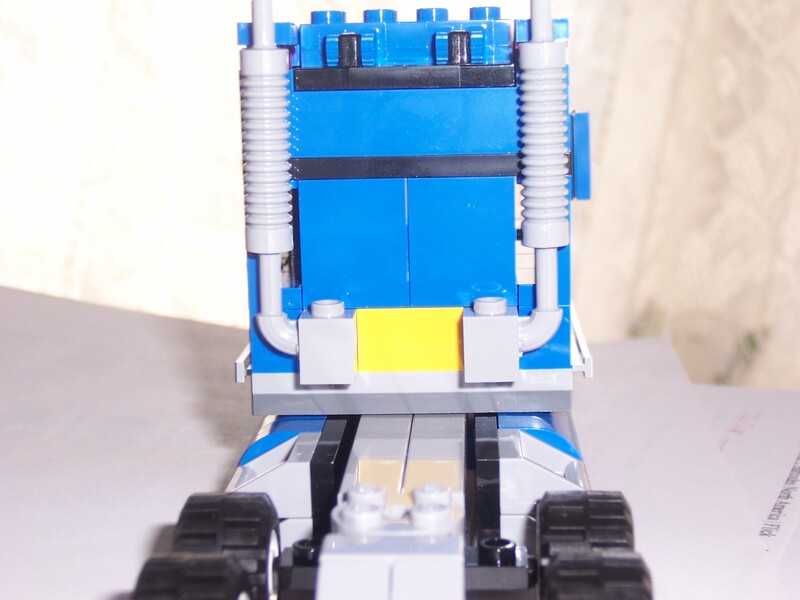 The Storage part of the truck uses telescopes to keep it from crashing to the ground when it detaches from the Front of the Truck. Build: 3/5 – The build is not hard at all. Only the front of the truck will take the longest to build. 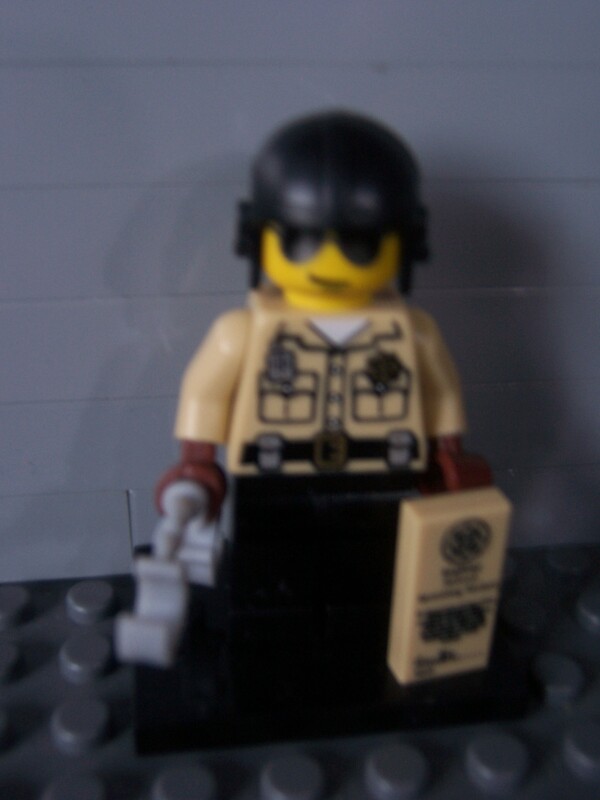 Minifigs: 3/5 – Average ordinary City Civilians. 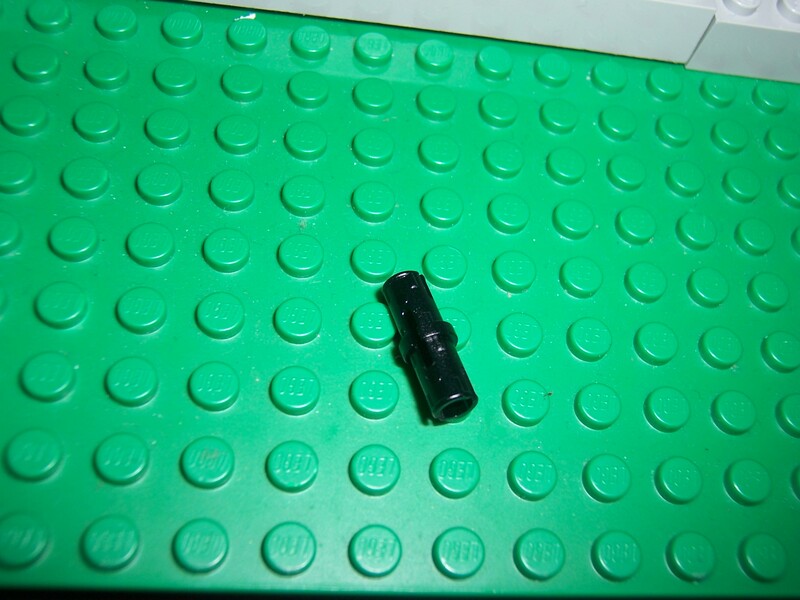 No brand new minifigure parts. 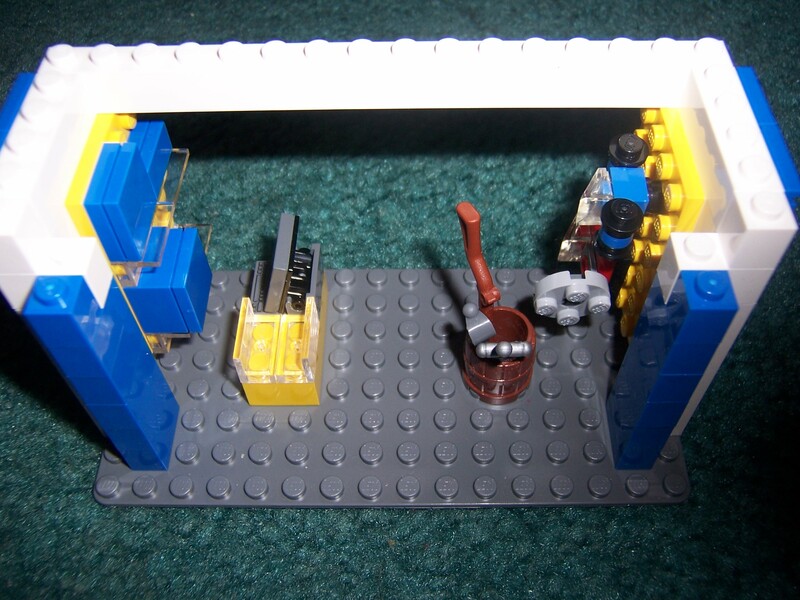 The set could’ve used a couple of more Lego kids. 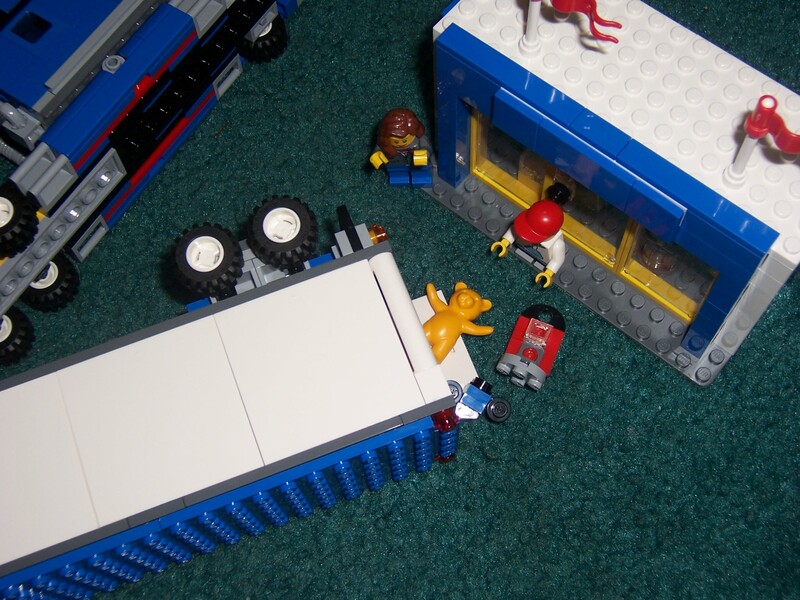 Playability: 4/5 – You can load the truck up with toys, ”drive” it to the Toys R Us store, Deliver the toys, and the Lego kids can buy them. 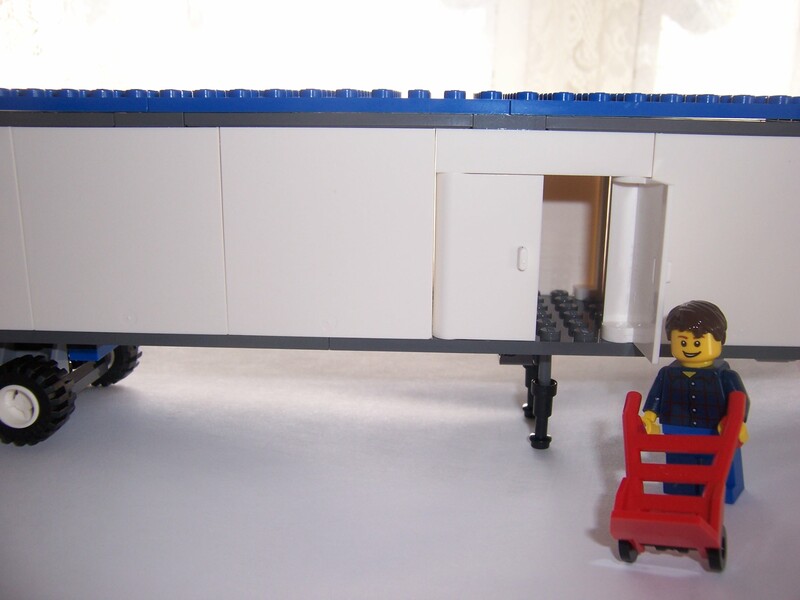 The truck even comes with a bed and monitor for the truck driver which is a nice add on also. 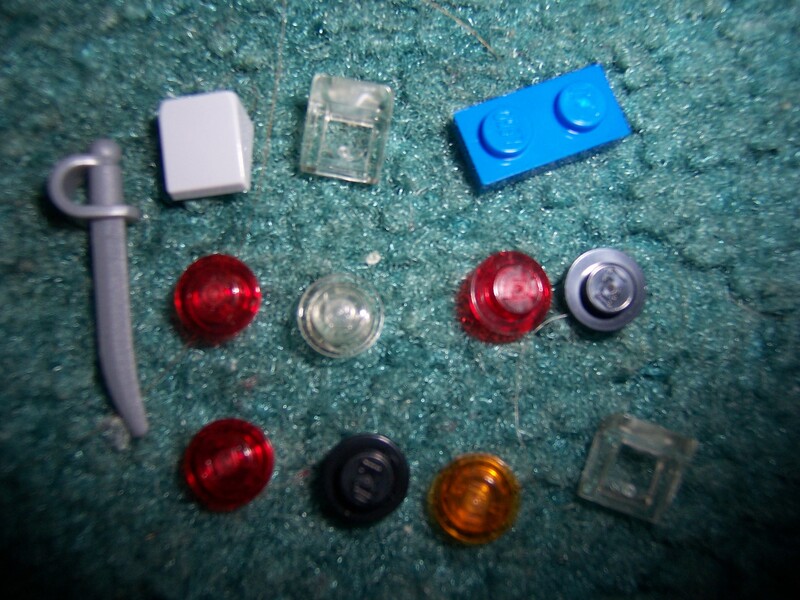 Parts: 4/5 – There’s a handful of good parts in the set. 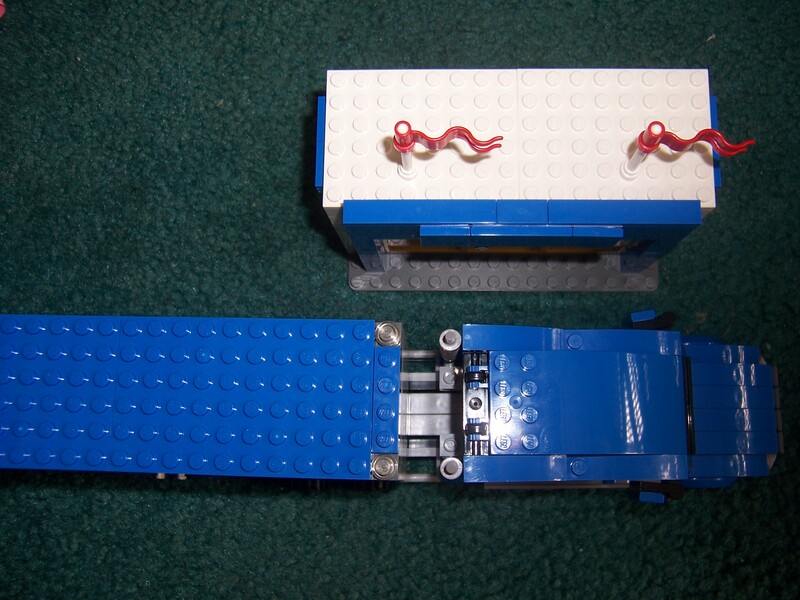 You get about 10 wall panels which can be quite useful for larger mocs. Price: 3/5 -The price is fair enough since A its a exclusive which makes the set price go higher and B its the usual Price per Piece ratio. Overall: 4/5 –The set is not a must have. 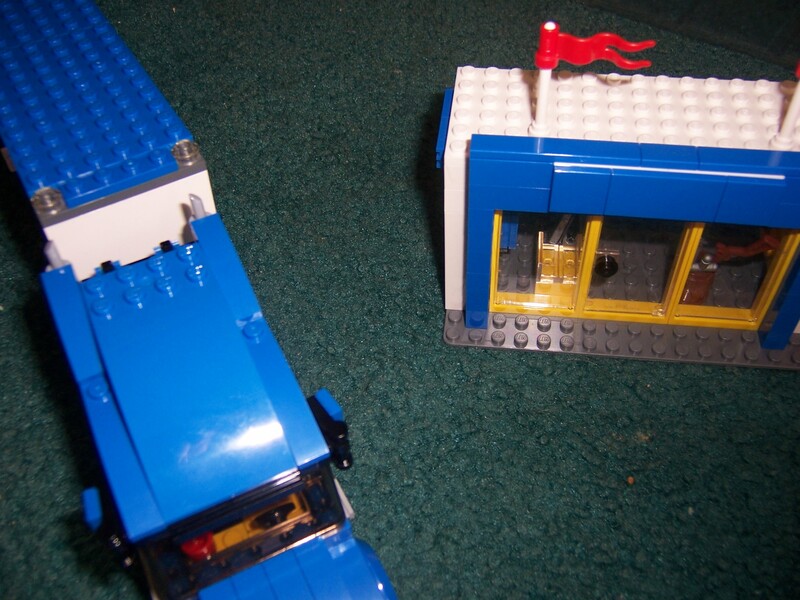 But if I had to choose between getting the Lego Delivery Truck or the Toys R Us Delivery Truck I would go with the Toys R Us one. 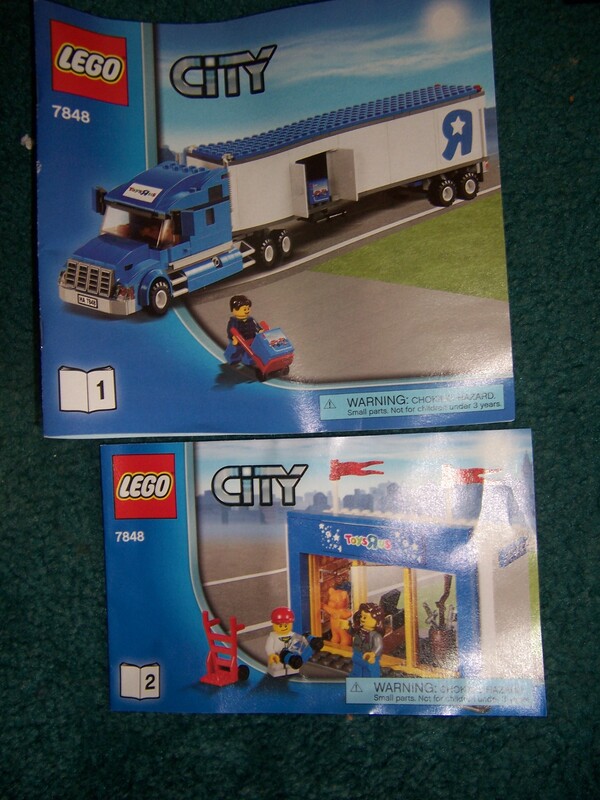 The Toys R Us Store is the reason that makes the set better than the other Lego Truck. 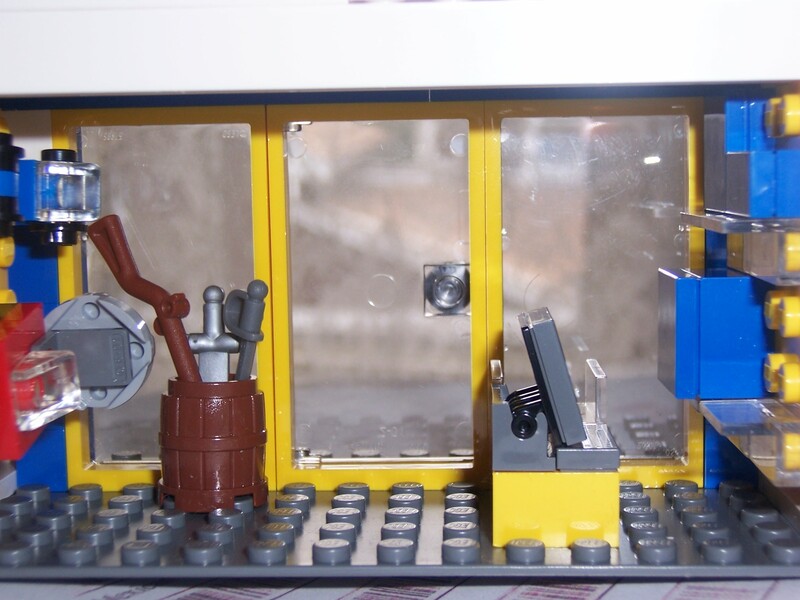 Hopefully in the near future Lego will release a set of an official Lego store. 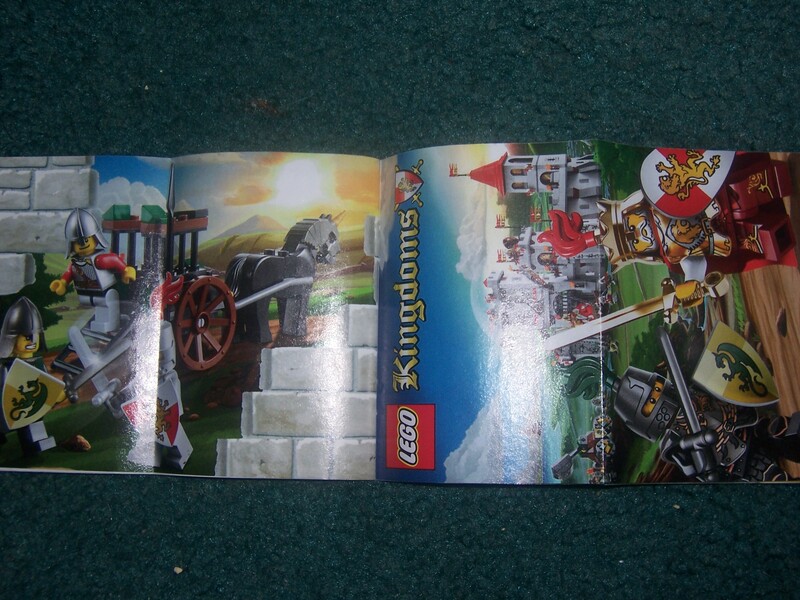 The back of the instructions, on the left shows the Carriage in action and on the right shows the two kingdoms in battle. 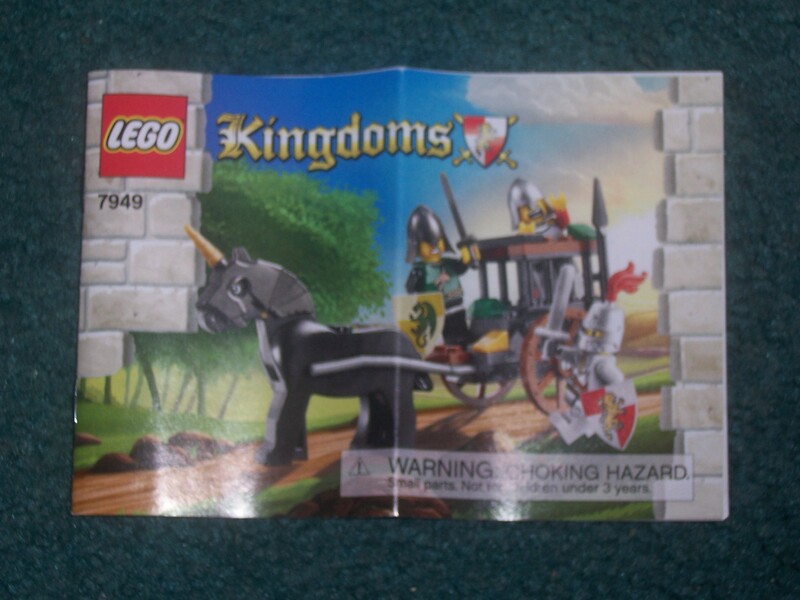 The brand new helmet piece in the Kingdoms sets is very detailed and I’m glad Lego made such a piece. 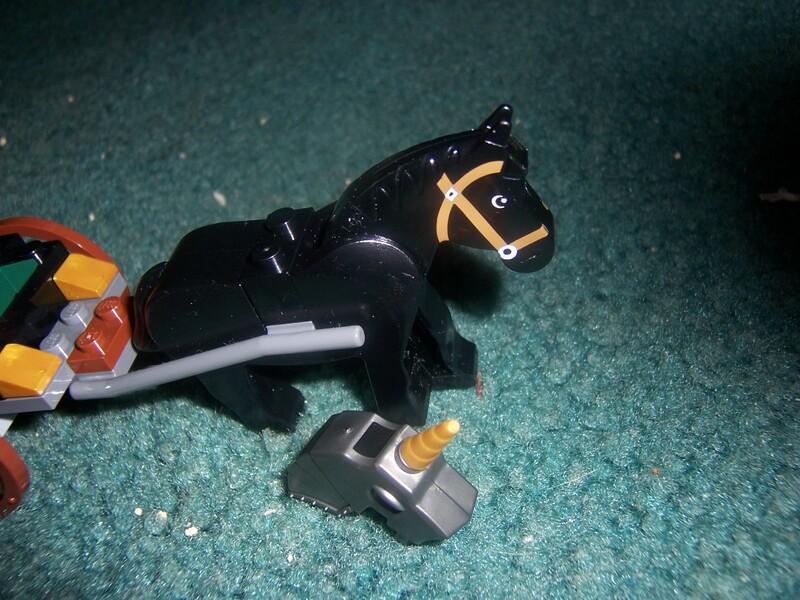 The unicorn is actually a horse. The horses headpiece makes it look like a unicorn. The helmet part is two pieces. 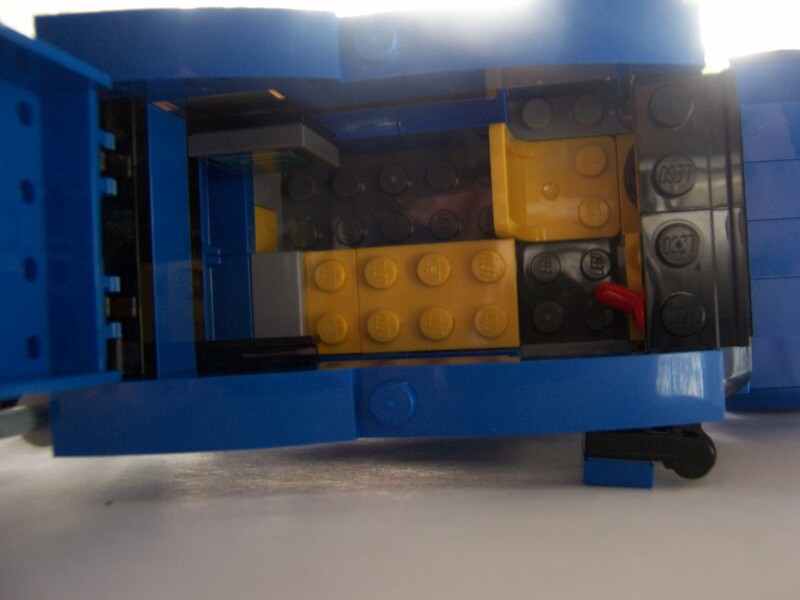 The prison part of the carriage can be easy to get out of for minifigures. 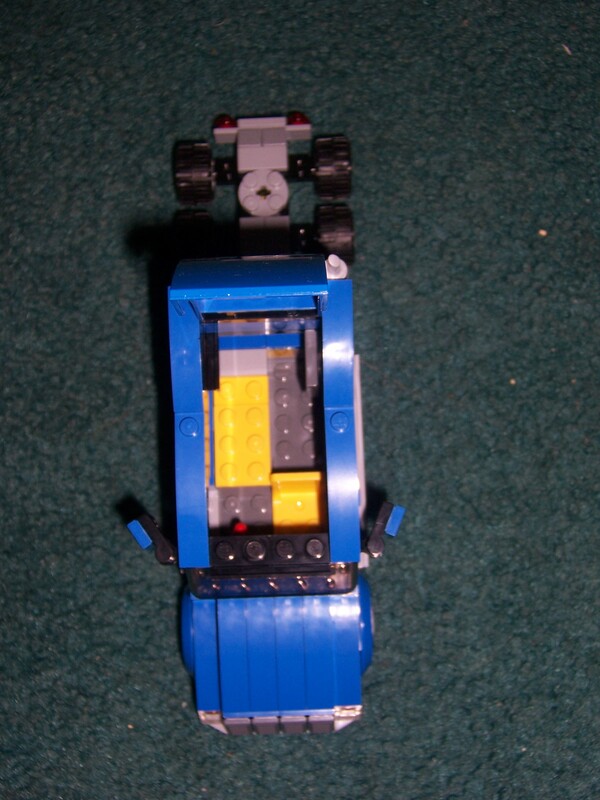 Design:2/5 –The design of the prisonment part of the carriage is rather weak and needs some modding to it. Build: 2/5 –Simple and no new techniques. 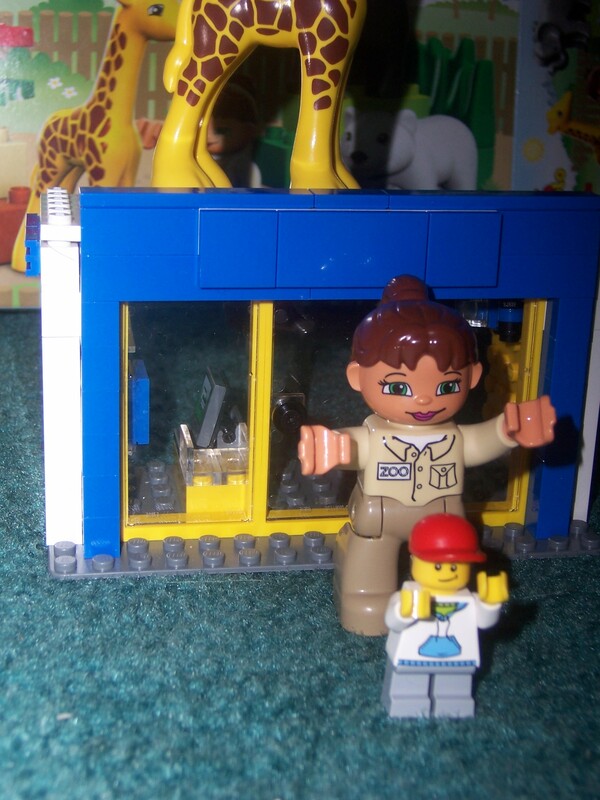 Minifigs: 4/5 – The selection of minifigures is pretty good. It’s good to get a King’s Knight in a cheap set. The accessories that are included are pretty cool, too. The Unicorn/Horse is a great add on also! One more Dragon Knight would have been good so that both sides in this set would have a fair ratio and would make it easy to build a larger army of these guys. Playability: 2/5 – Not much to do in this tiny set. All you can do is go after the Dragon Knight, battle the Dragon Knight, and save the King Soldier. 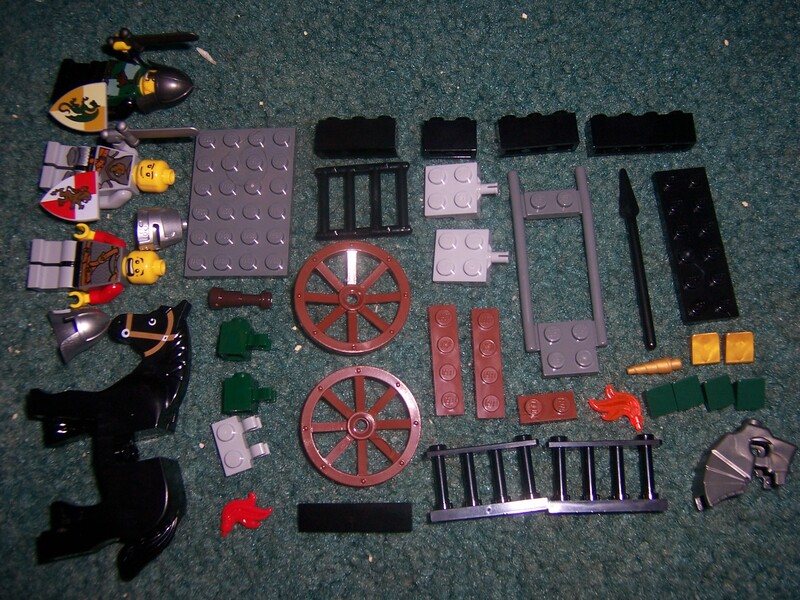 Parts: 3/5 – There are Dark Green pieces, the unicorn helmet, and Golden cheeseslopes which I find to be lovely! Other than that most of the other pieces aren’t that great. 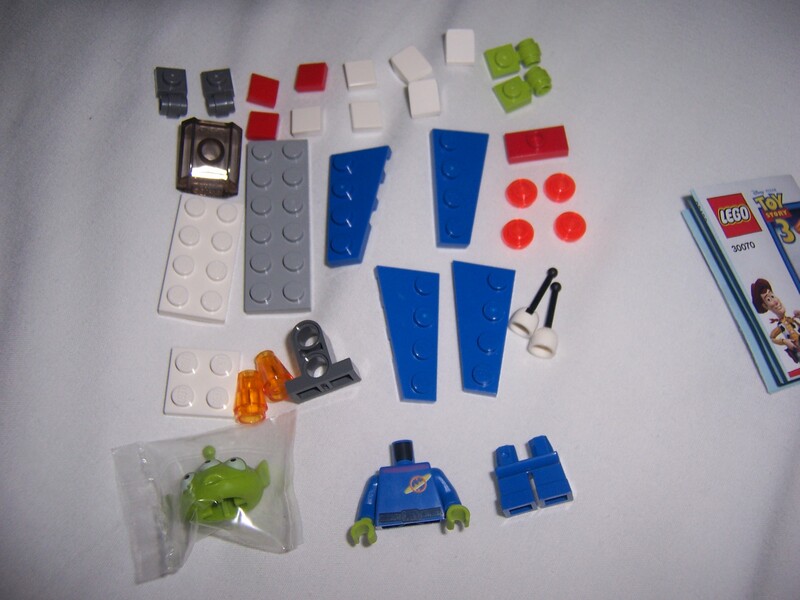 Price: 2/5 -The piece per price ratio isn’t that good in this set. The set should have been sold at $7 and not $10. 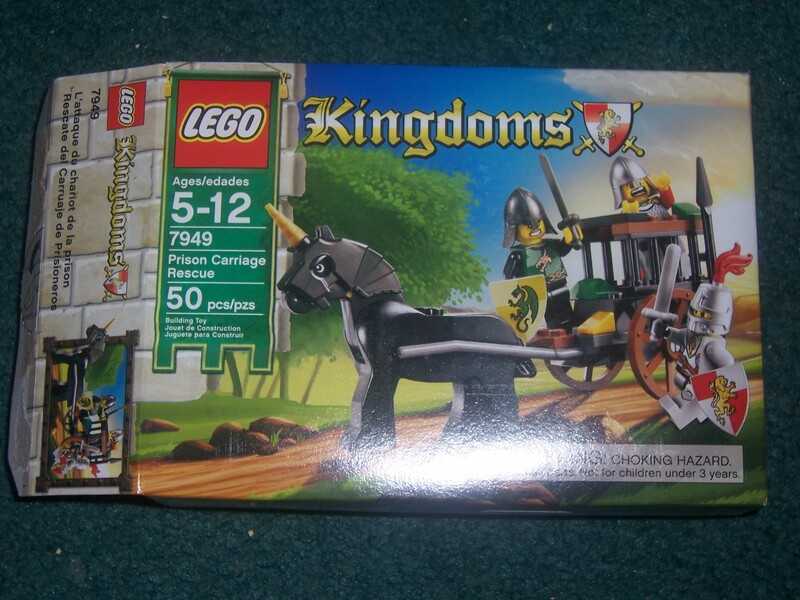 Overall: 4/5 -This set makes a good army builder to any Kingdom collectors. 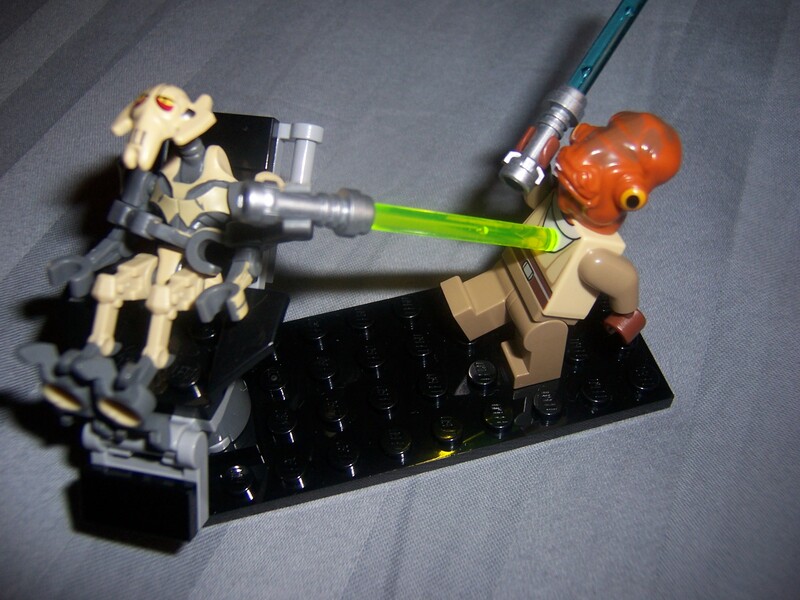 Its been 3 years since Lego first released a Grievous Starfigher. Will the original version be better than the 2010 version or will both models not be up to date? 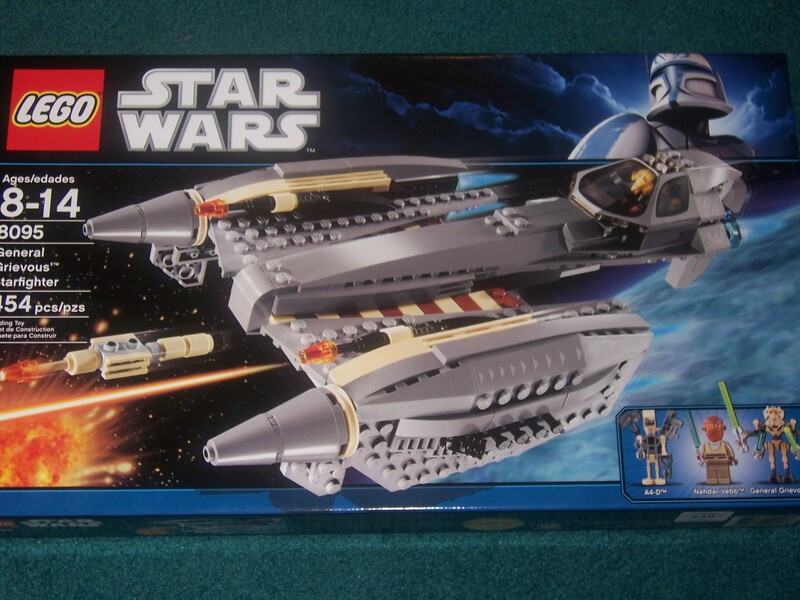 The front of the box shows the Grievous StarFighter detaching a bomb toward his enemy. 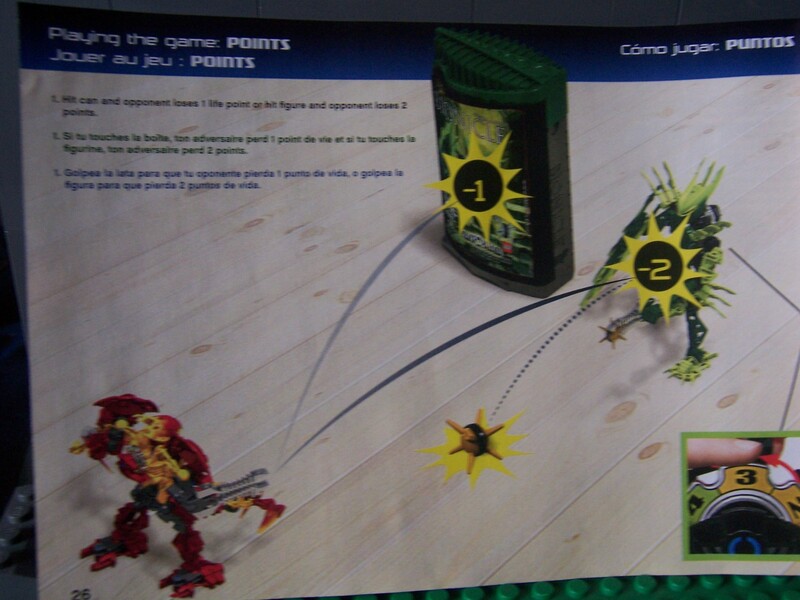 The back of the box shows Grievous going back to his ”lair” to either recover from a previous battle or plot against the republic. The same image appears on the Box cover also. 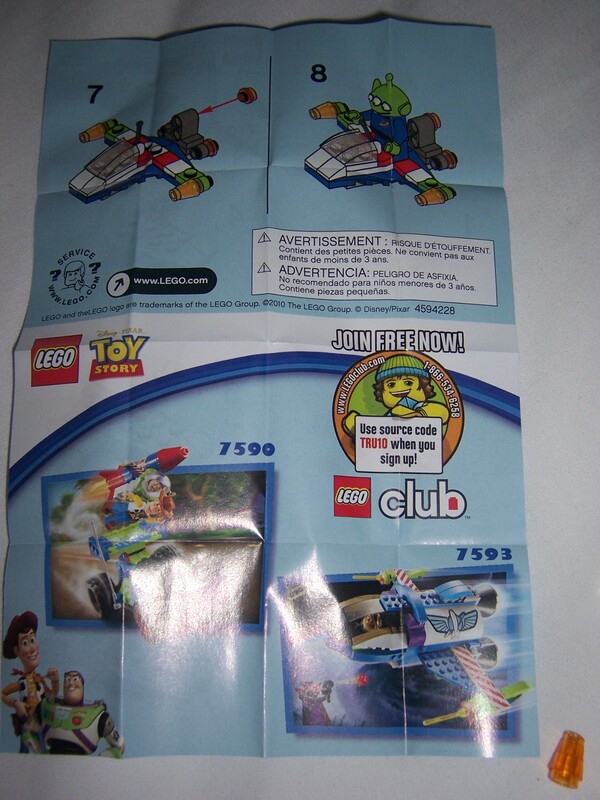 Near the back of the instructions are computer animated pictures to advertise the Lego Clone wars sets from this year. 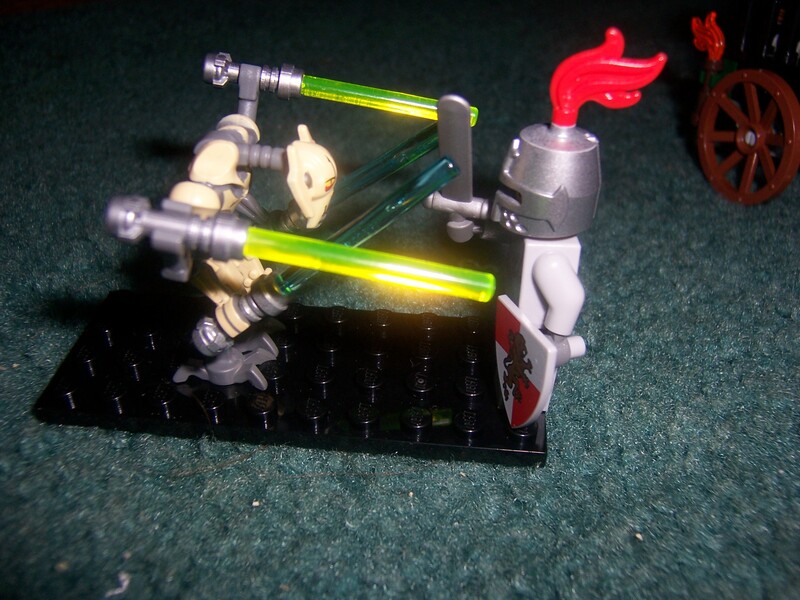 The Grievous minifigure is very awesome! 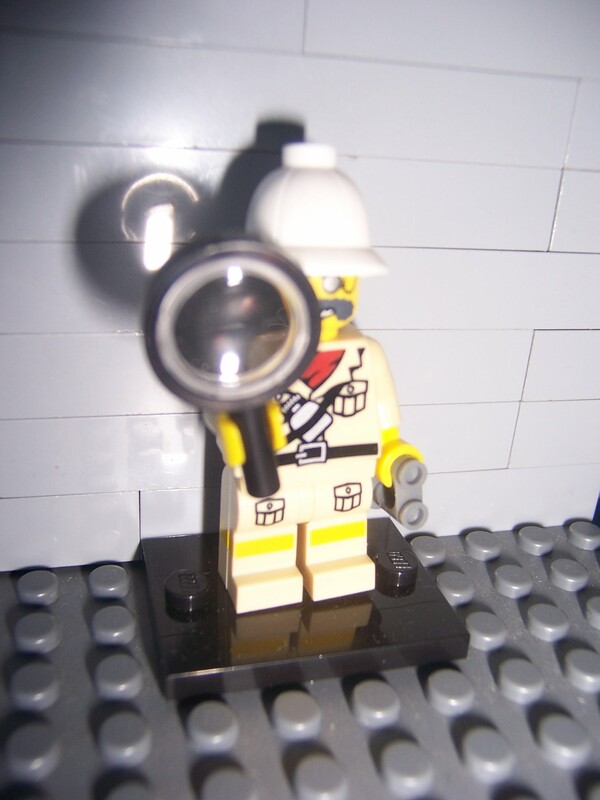 So many details packed into one minifigure. I hate that A4-d has a sticker as a face. It will lower his value since stickers don’t seem to last a long time. Yay! There’s backprint in this set. 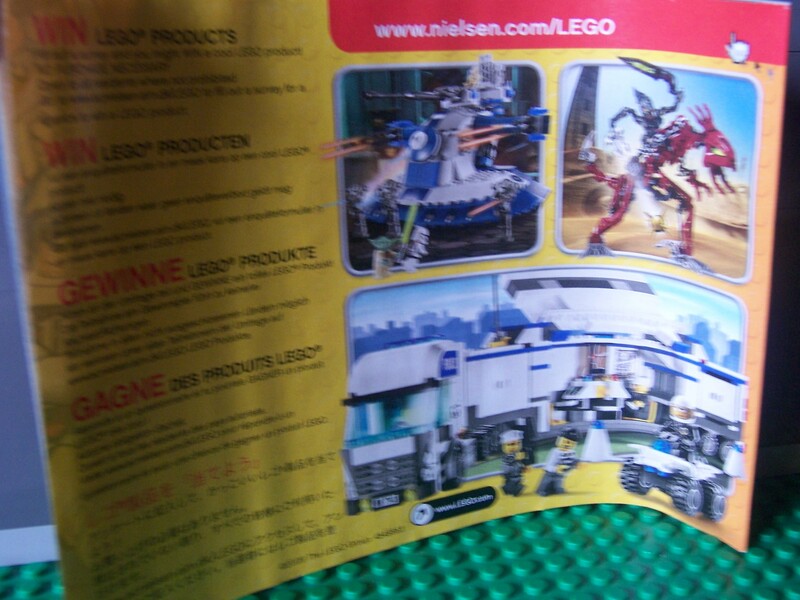 Again, just look at all the details on Grievous. My only complaint on him is that his arms don’t form from two to four. 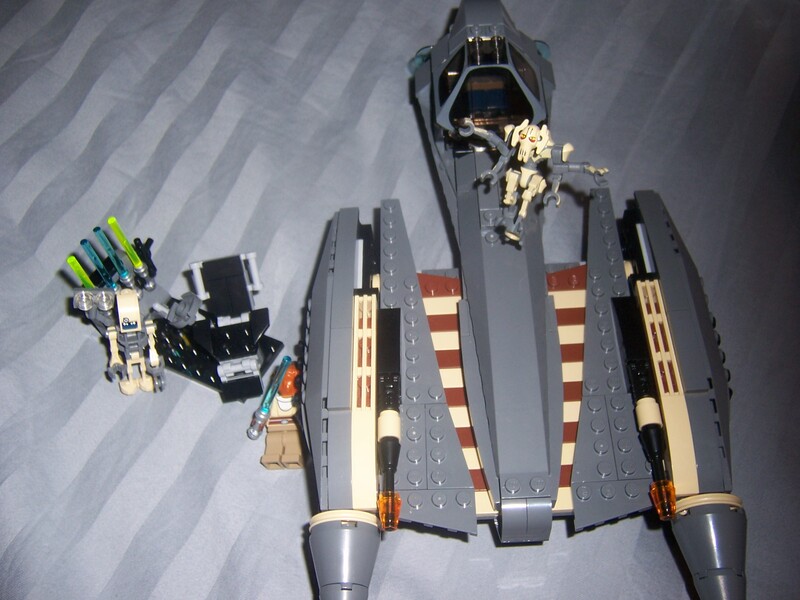 Comparing the 2007 Grievous to the 2010 version. 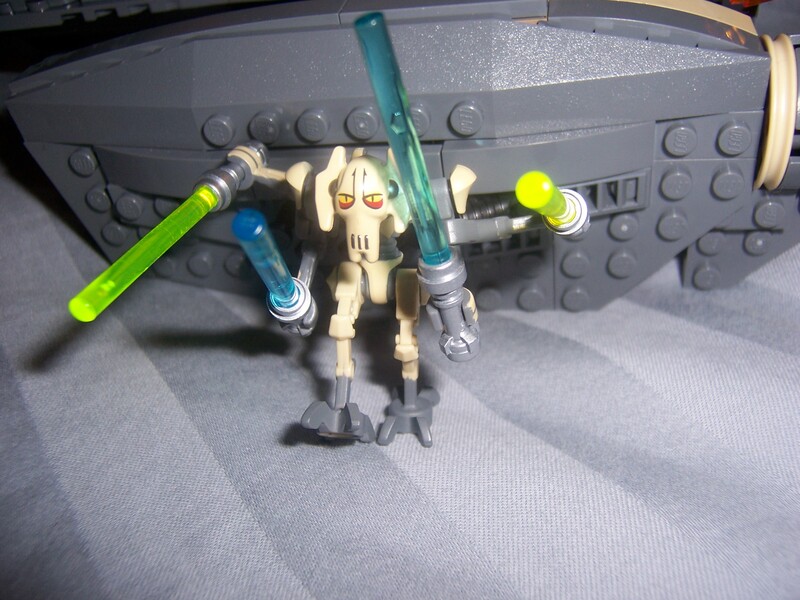 Another look at Grievous just to show how awesome he is. This part is very fast to build. 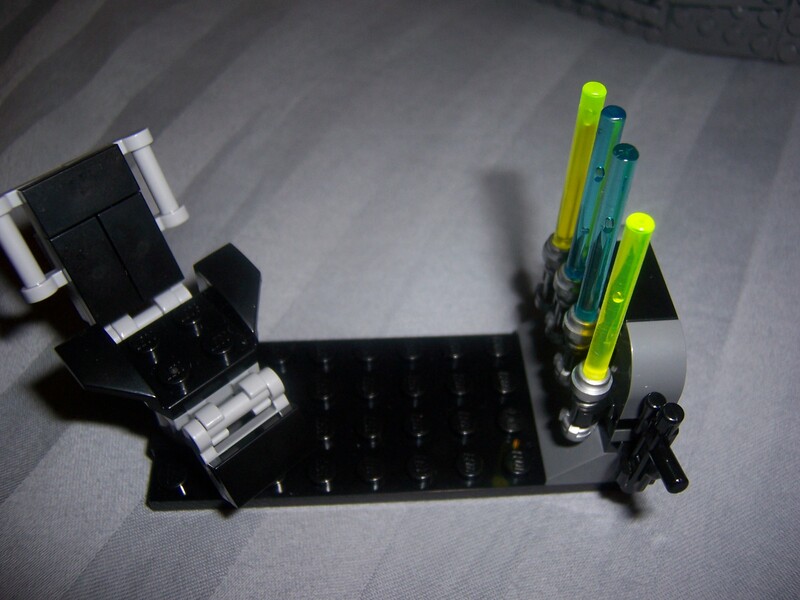 The chair is nice but it seems like it was thrown into the set just to rank up the pieces. It’s great to see chrome lightsaber handles again after there disappearance for a couple of years. 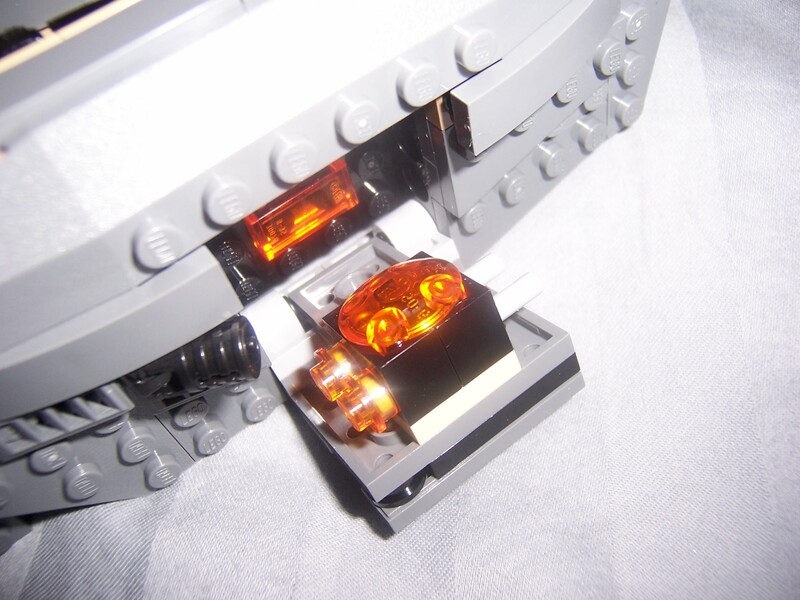 The sliding cockpit is a really good feature instead of having to lift the piece or detach the piece, thumbs up to the designers! 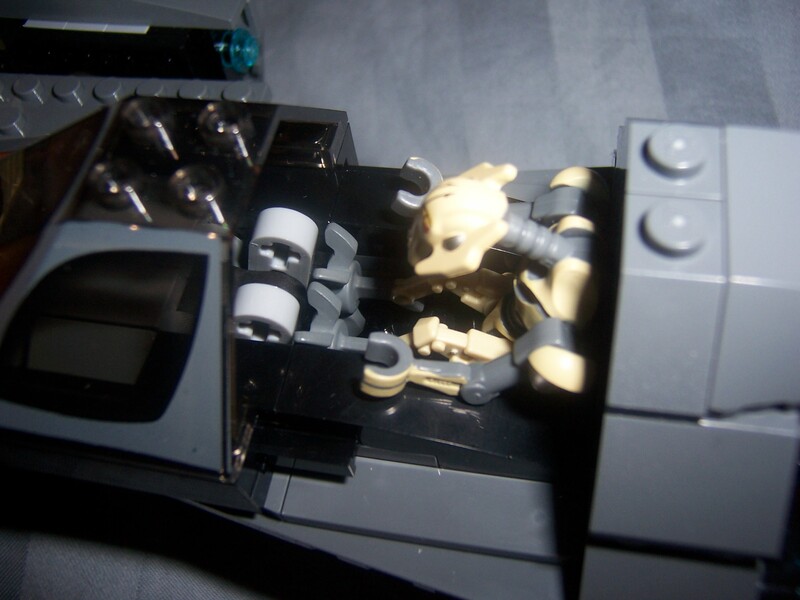 You have to detach two out of four of Grievous arms so he can fit in the cockpit. 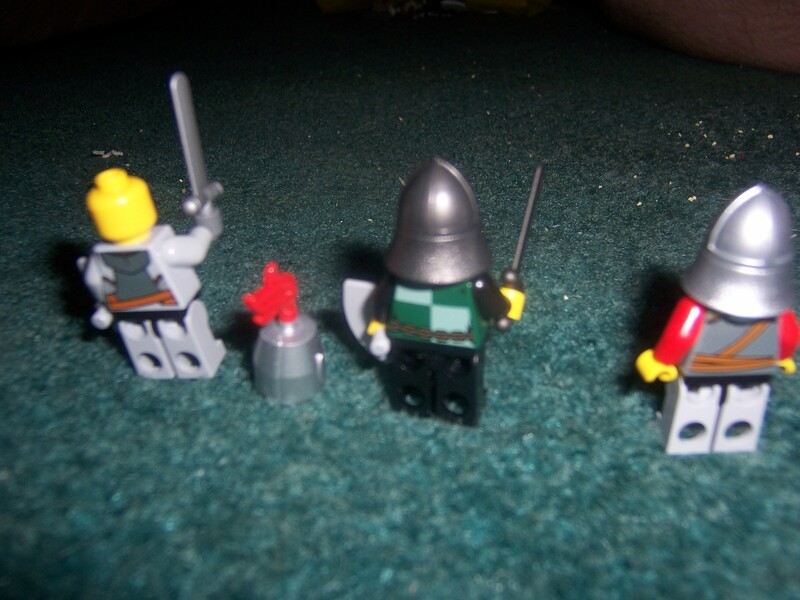 Some other normal minifigures can fit in it as well. 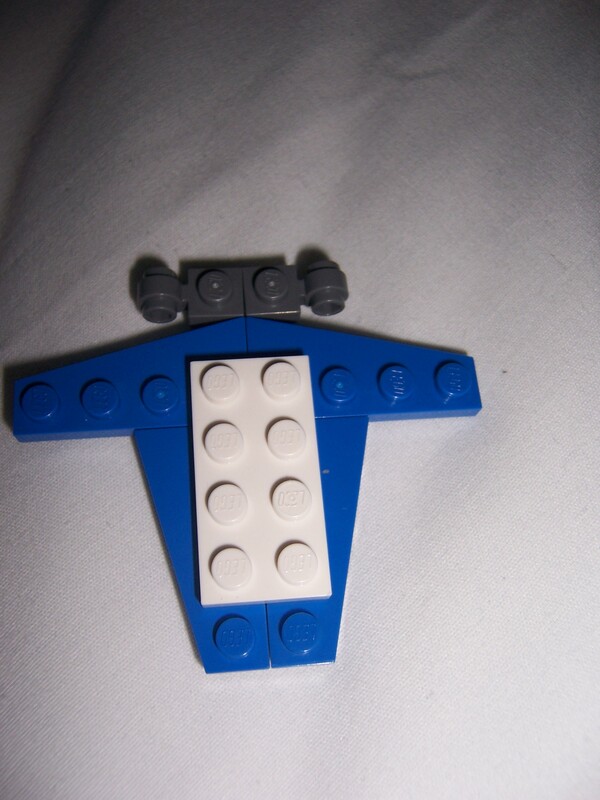 The rear end of the starfighter. The fin can go down when the ship is in landing mode and can be pushed up when the ship is not on ground. 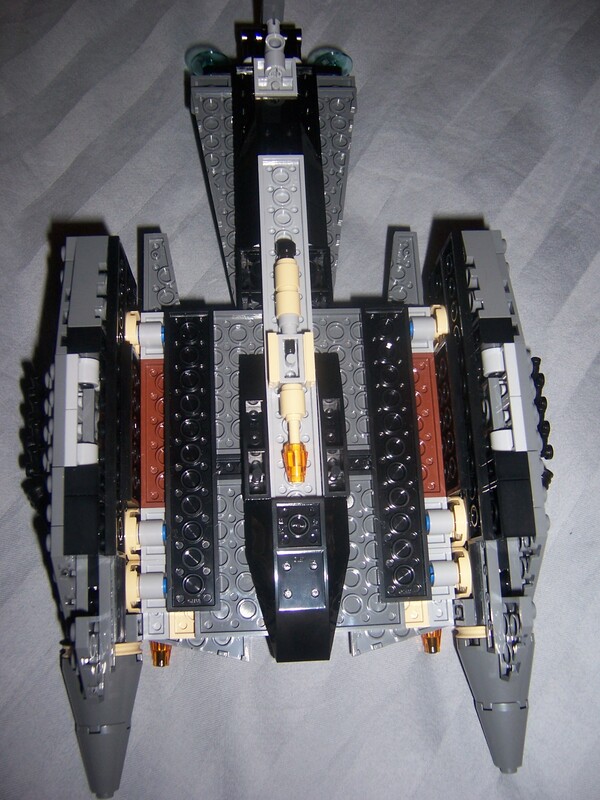 On both sides of the ship are ”secret compartments” each that hold two lousy flickfire missiles. The bottom of the ship isn’t as beautiful as the top. Theirs another ”secret weapon” underneath the ship that’s a bomb to drop on enemies. A closeup on the bomb. 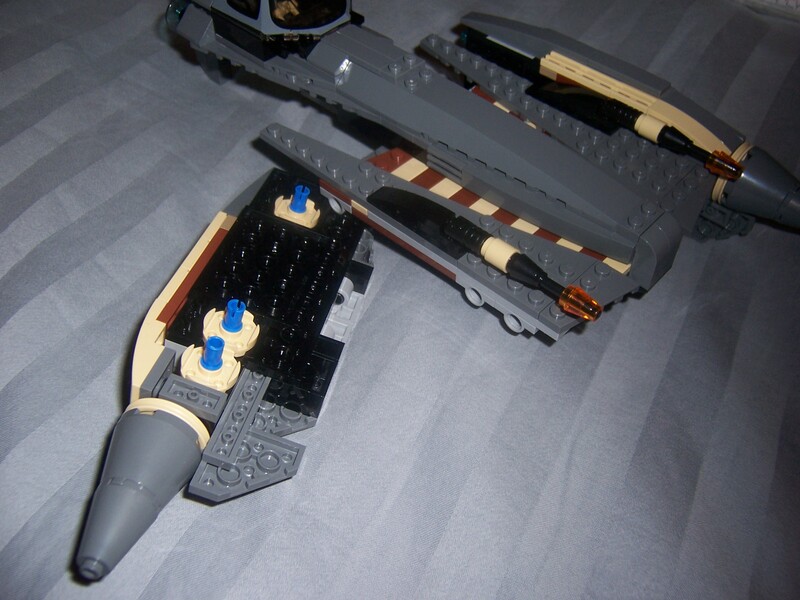 Both side wings can detach the main hull of the ship. 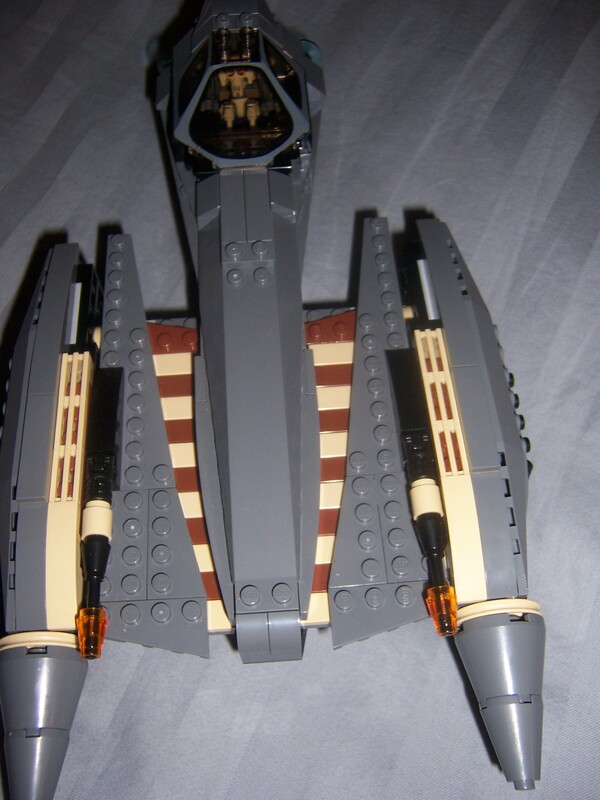 Design:5/5 – The design on the starfighter looks pretty spot on to the original. Build: 4/5 – The build was rather nice and had some techniques. 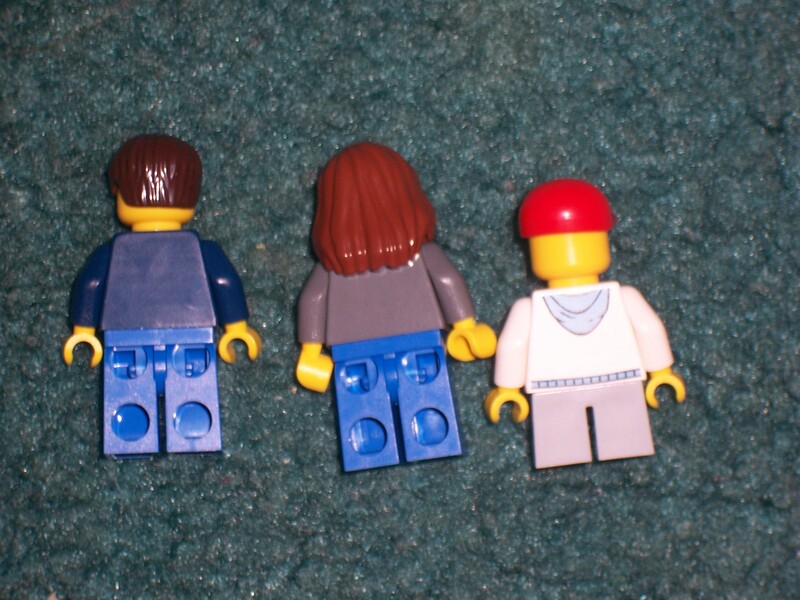 Minifigs: 4/5 – It would be 5 out of 5 if A4-D had a printed head and not a sticker. 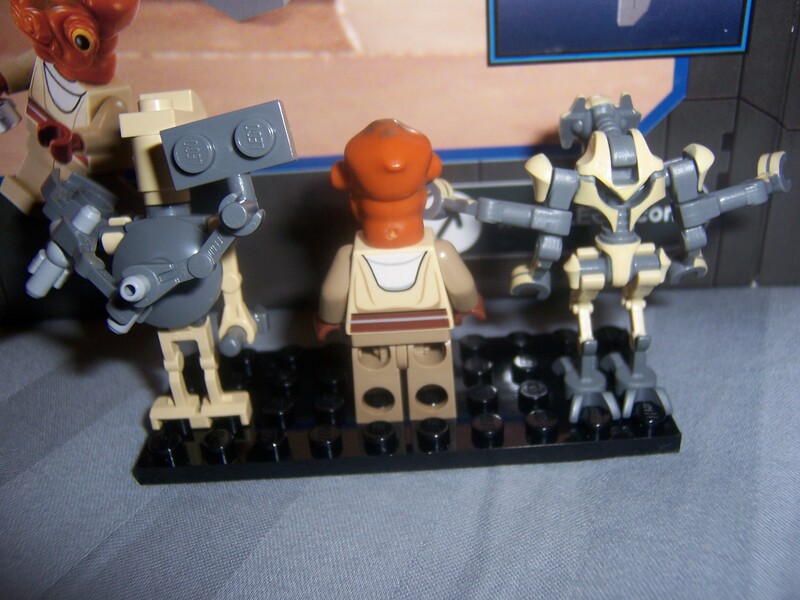 The Grievous minifigure is really accurate except for the fact that his arms don’t detach into four. Playability: 5/5 – Lots of playability in this set. 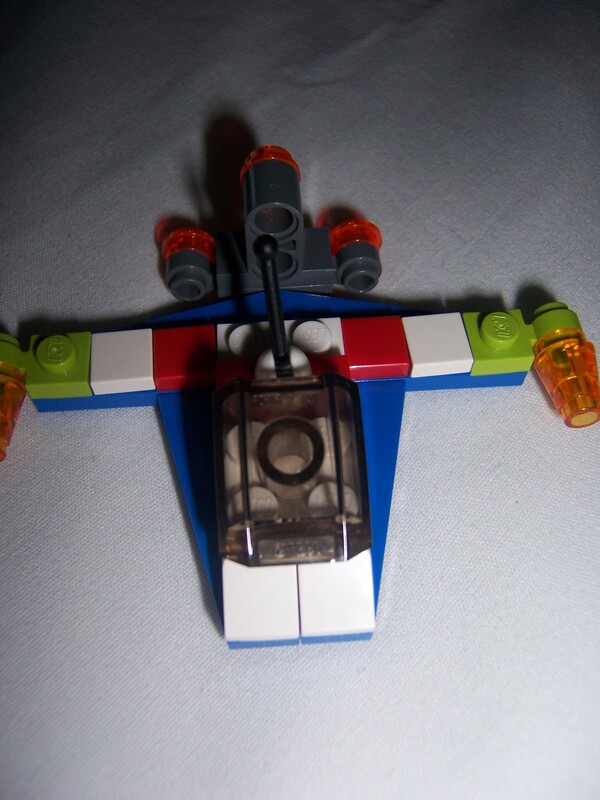 Four flickfire missiles, a sliding cockpit, and it has a back fin for landing gear. 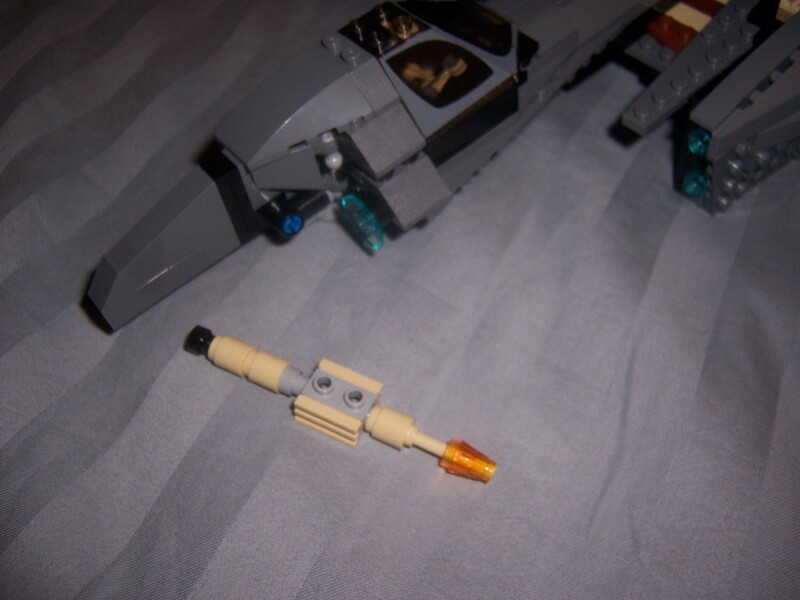 Parts: 4/5 – The Hyena Droid bombers legs come in Dark Bluish Grey which is pretty sweet. 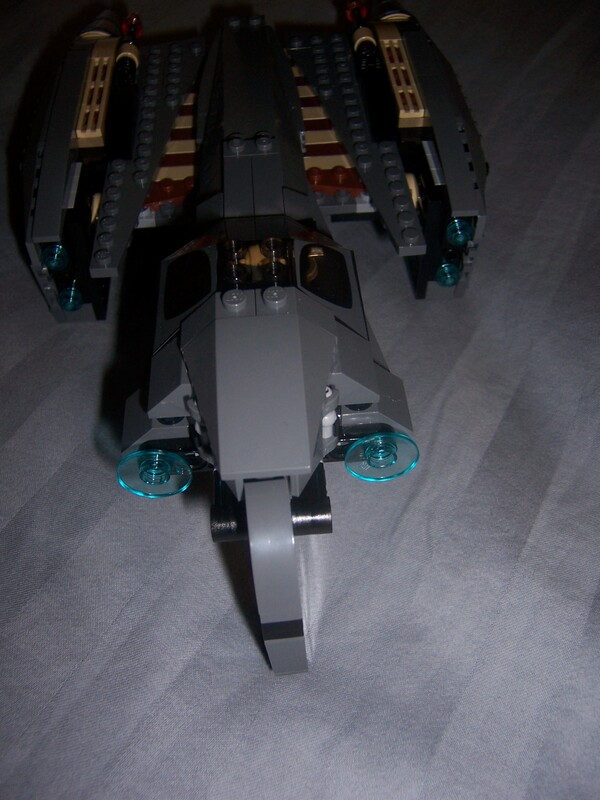 The printed cockpit is also good and there’s a healthy variety of Dark Bluish Grey. Price: 4/5 -The price is somewhat fair. 11 cents per piece. 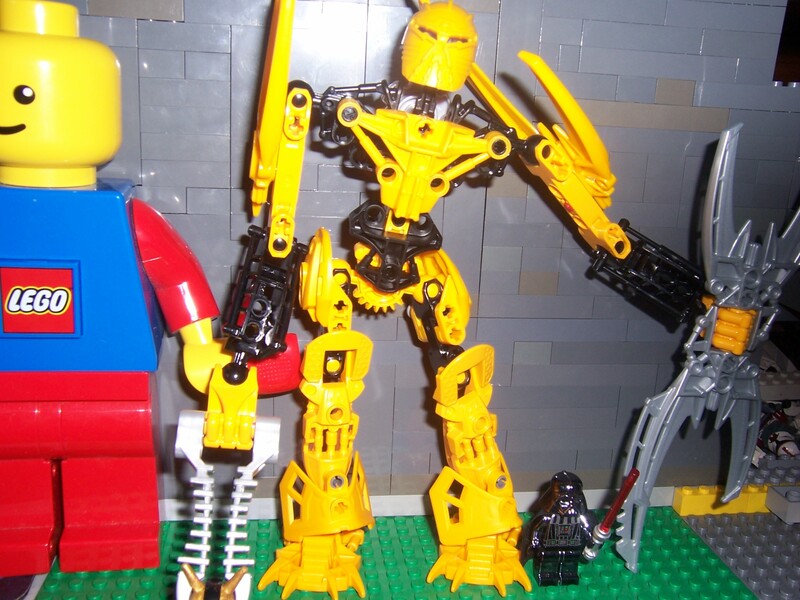 Star wars is usually more expensive than the average Lego. 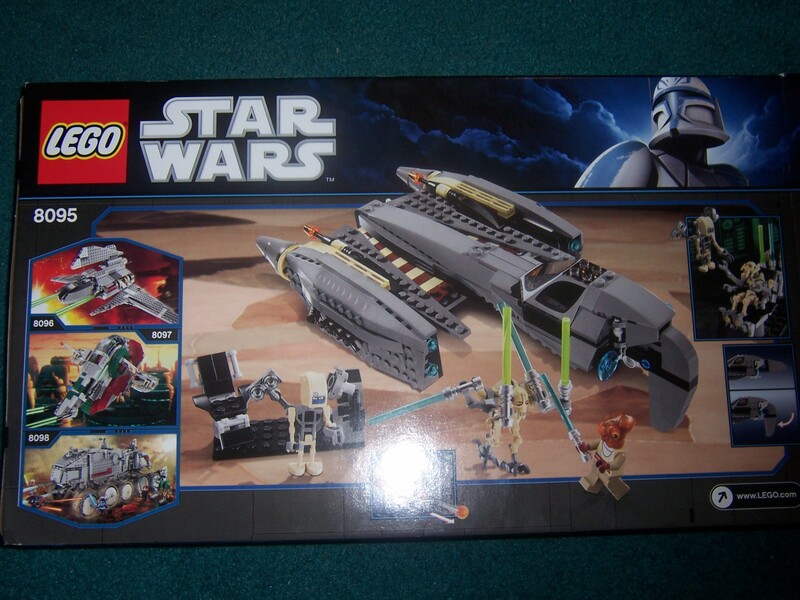 Overall: 4/5 -This set is an average star wars set. A decent design model. 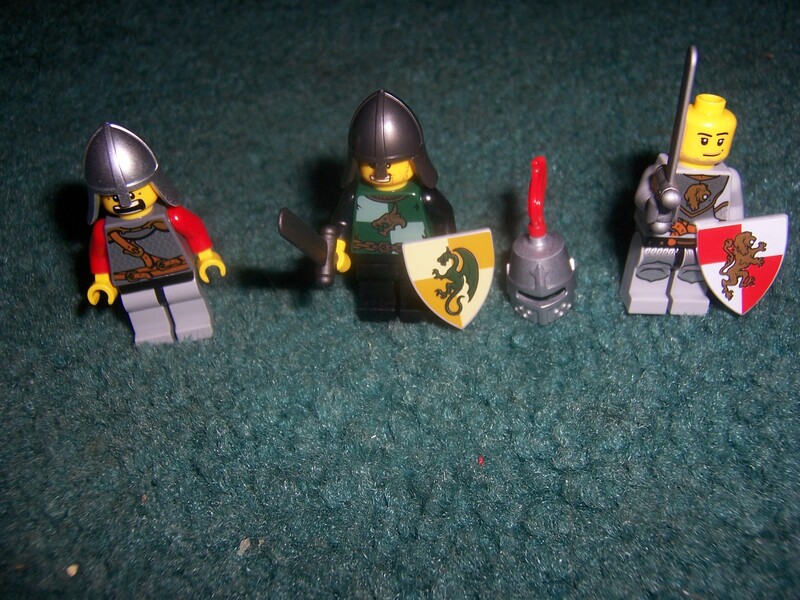 Some cool minifigures. The only letdown is A4-d has a sticker as a face. A Sticker! 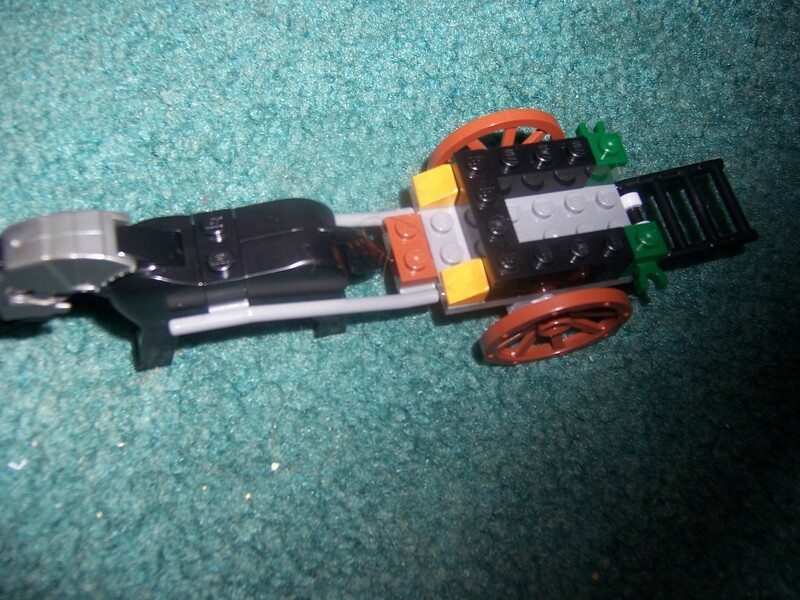 What was Lego thinking? 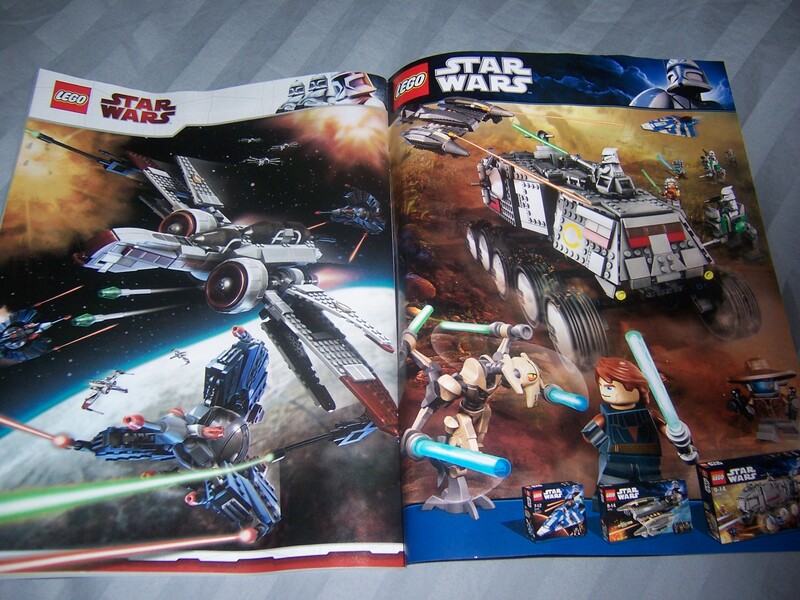 But seriously I think this set is a worthy remake of the previous Grievous StarFighter. Come on everybody, lets go take a trip to the zoo! 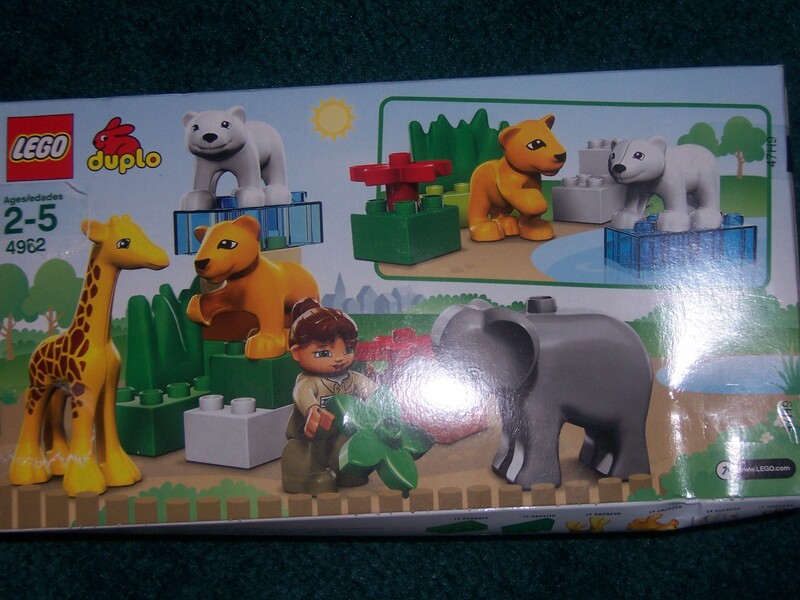 The front of the box shows the animals in the zoo being in their captivity being taken care of by one of the zookeepers. 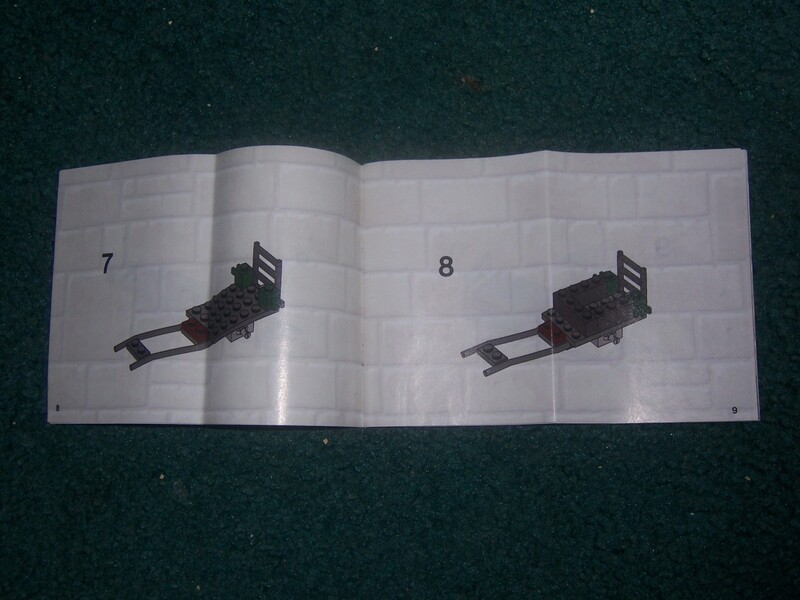 The back of the box shows 2 different models you can build with this set. The contents from inside the box. As you can see, the Giraffe and Lion cub come in their own bag and the elephant doesn’t come in any bag. 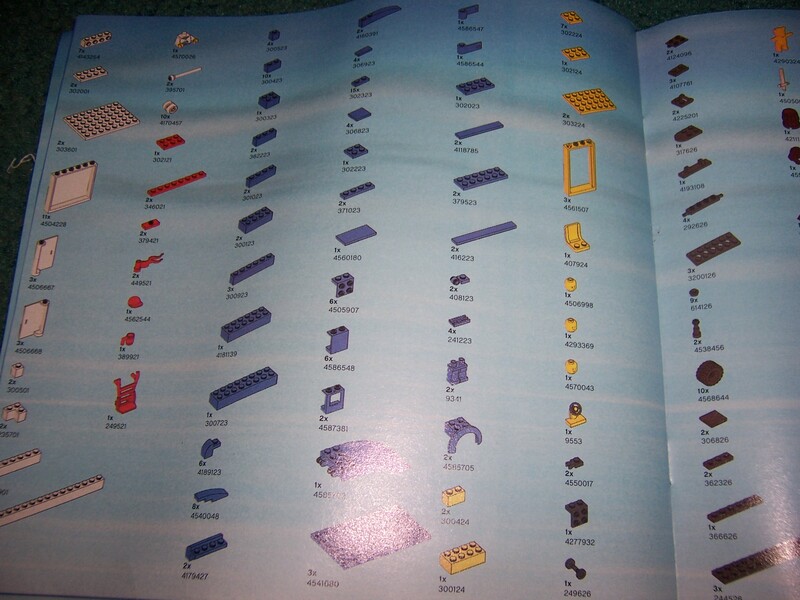 The set does not include instructions, that way the child building it can use their imagination to build anything they like. 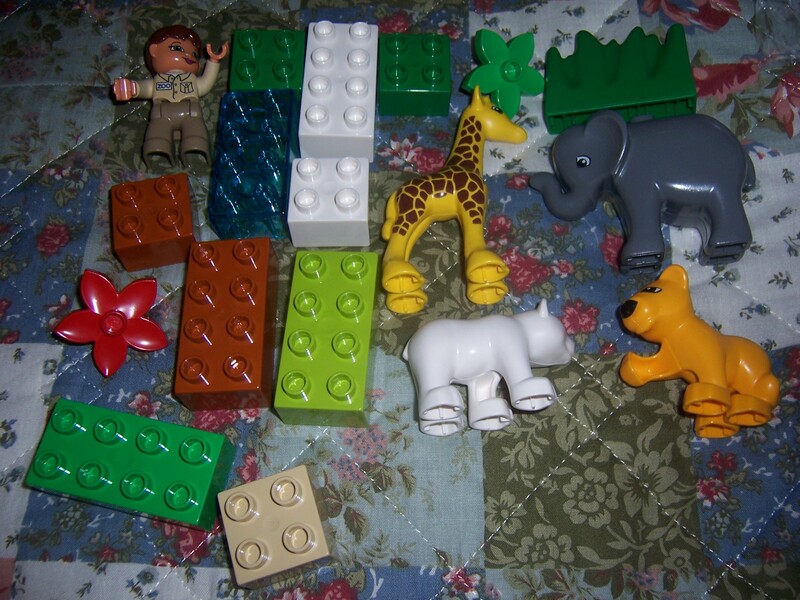 But you need much more Duplo to be able to build specific models. Here is the model built like the front of the box. A closer look at the animals. 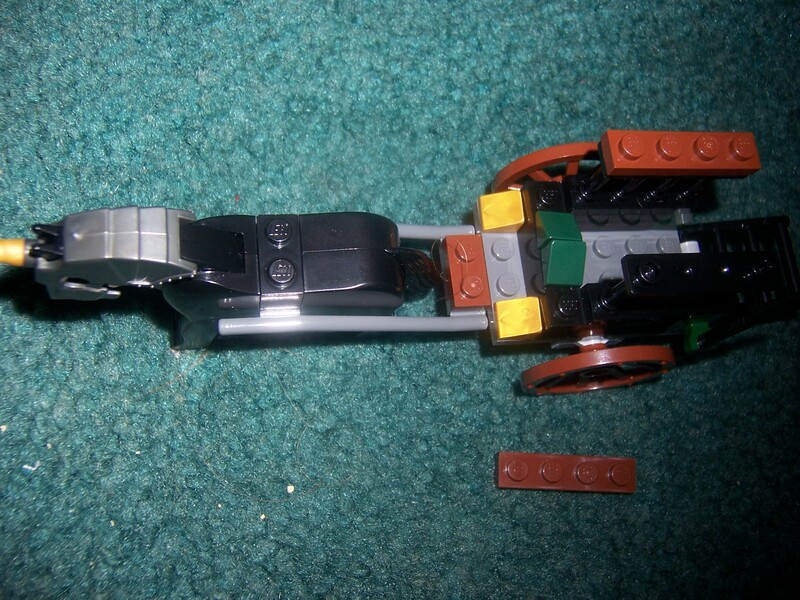 Not all of the Duplo in this model are able to connect with the regular Lego system. 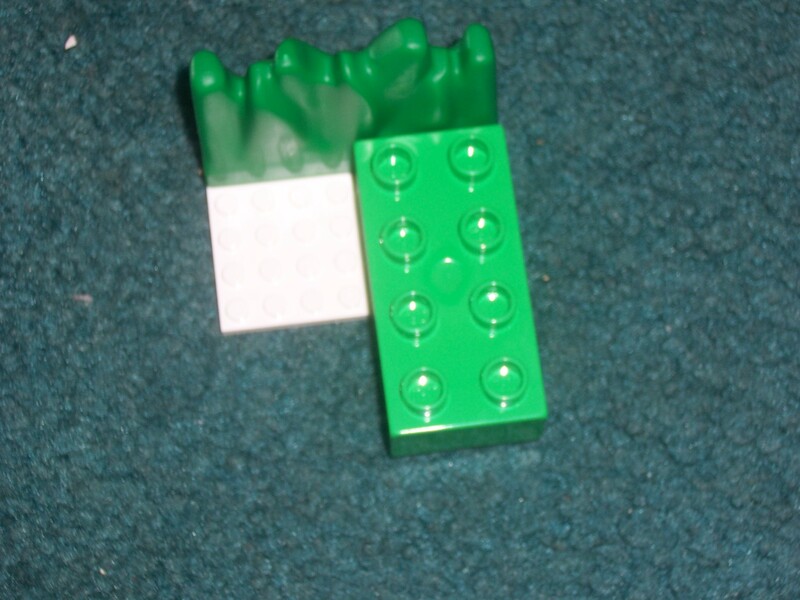 Only the 2×4’s, 2×2, and the 1×4 grass are Lego compatible. 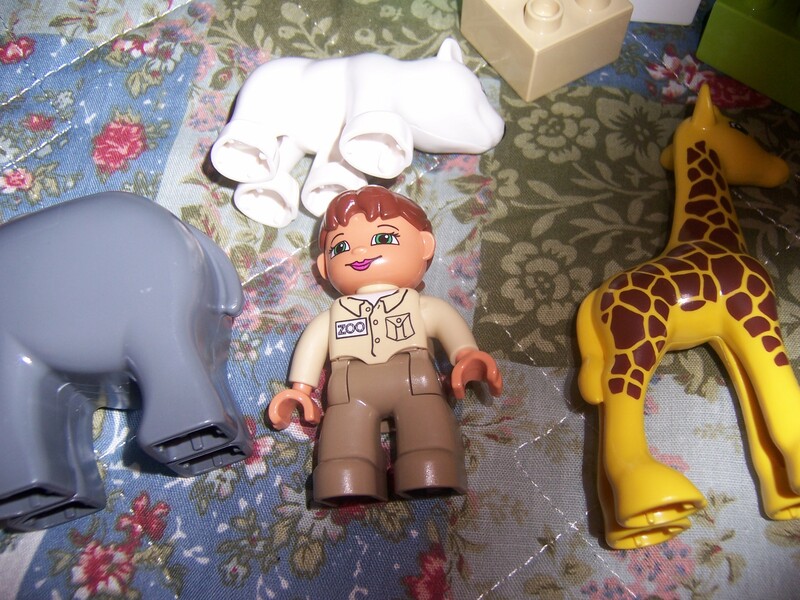 If Lego never releases a System scale Lion or Giraffe then this set will be your best bet on getting those two animals. Design: 2/5 -Not much of a design. Just a bunch of 2×2’s and 2×4’s stacked on top of each other. Build: 3/5 – Supremely simple. Then again it’s a 2 year old model. 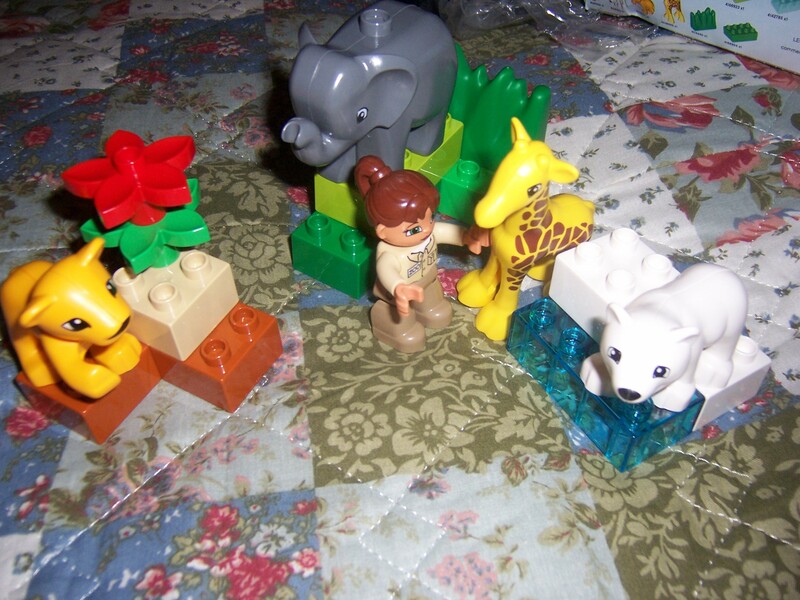 Minifigs: 4/5 – The animals are adorable. No complaints here. 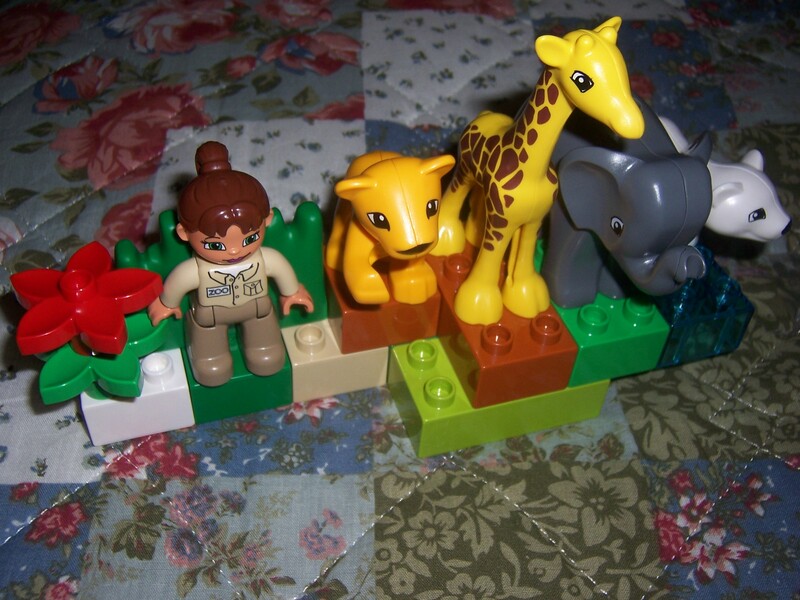 Playability: 4/5 – Duplo helps children’s imagination expand so the animals and bricks are used to play and build. It can be fun for Toddlers. 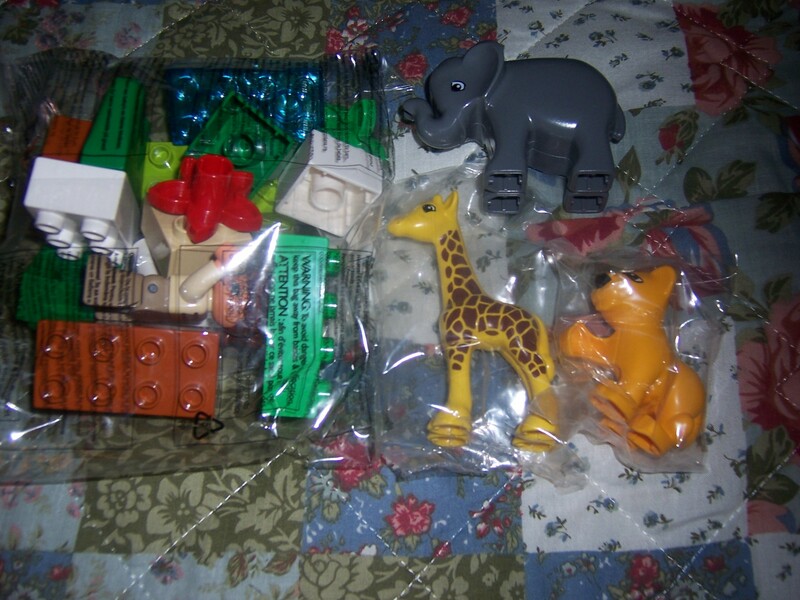 Parts: 3/5 – The only interesting parts in the set is the 1×4 grass, the Giraffe, the lion cub, and the Trans-Blue 2×4 brick. 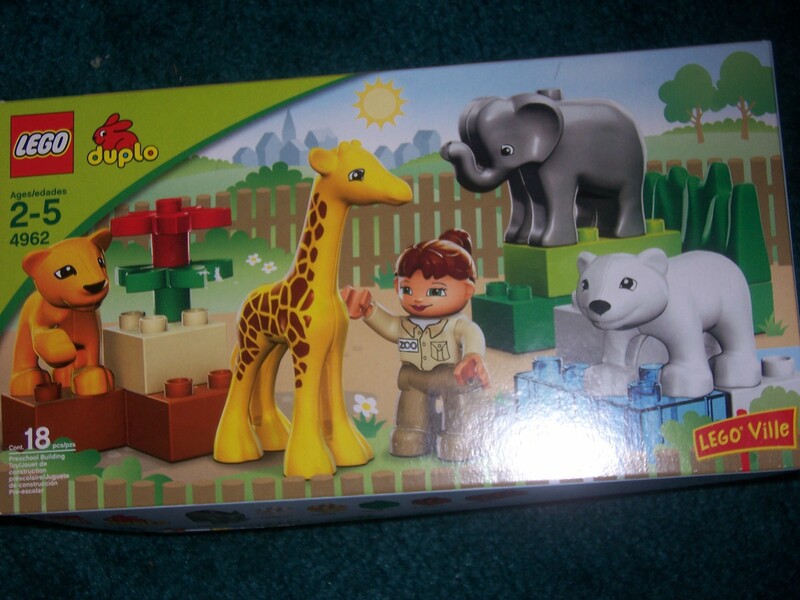 Price: 3/5 – Duplo is usually more expensive than regular Lego. Its better to get this set on sale. 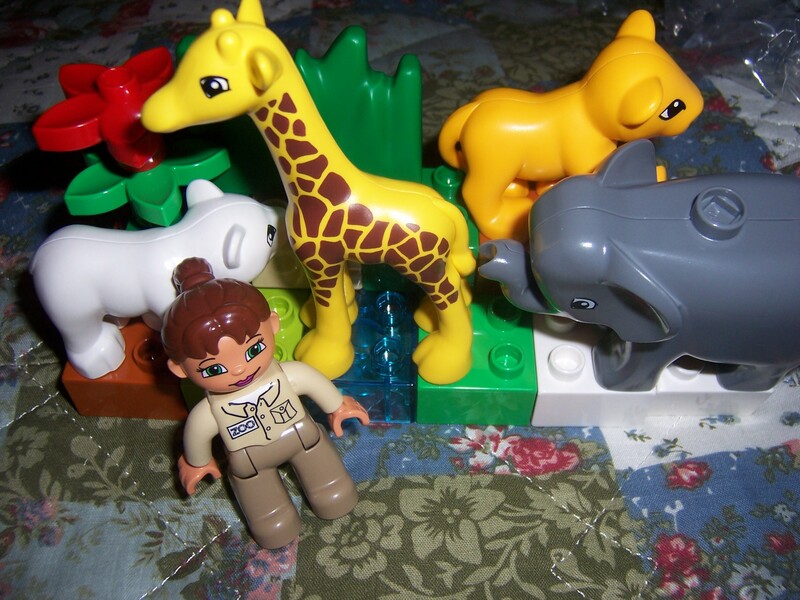 Overall: 4/5 –Its a good set for toddlers and to those wanting to build a zoo or safari. 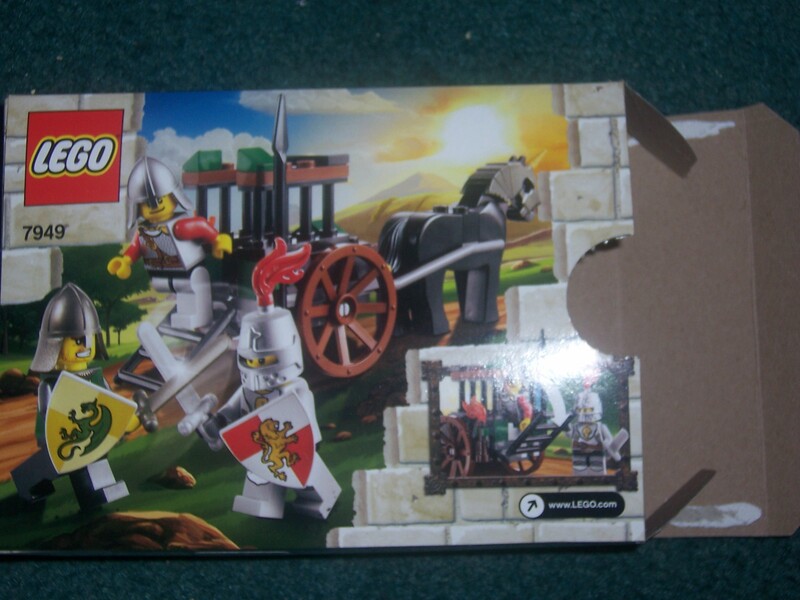 It also makes a good starter set for infants that are just getting into Lego. 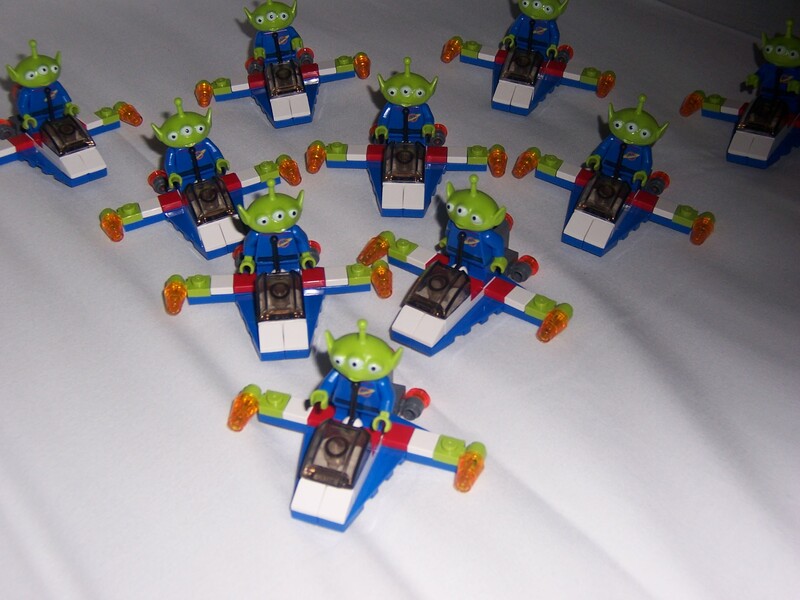 Attack of the Duplo martians. A stranger from the outside. OOOOOHHHHHHHH. This is the latest Toy Story Promo featuring the Squeeze Toy Alien from the Toy Story Trilogy. 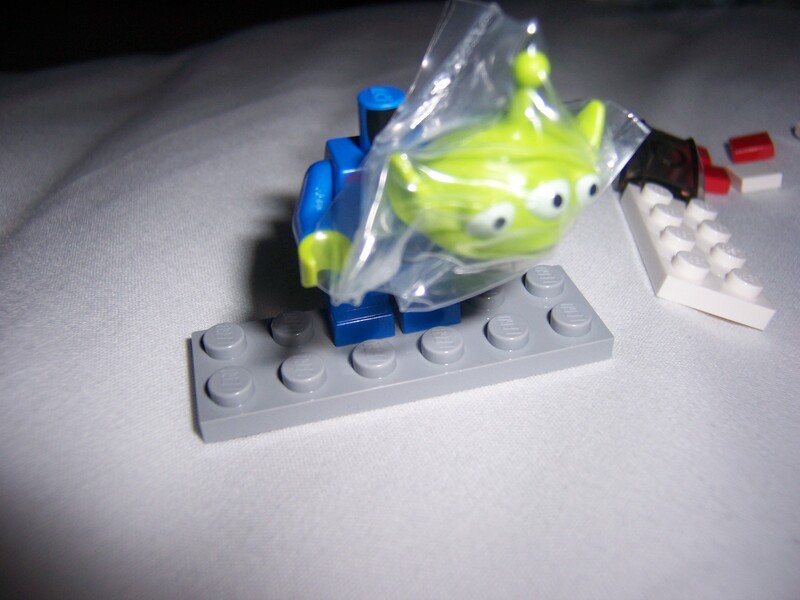 The front of the poly bag features the Squeeze Toy Alien flying through space. 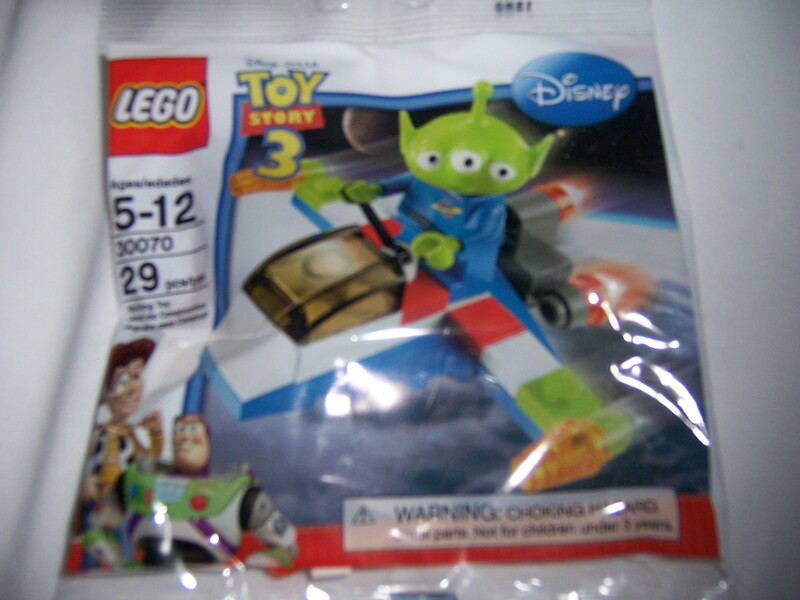 This set was not in the third film even though it has the Toy Story 3 logo on it. 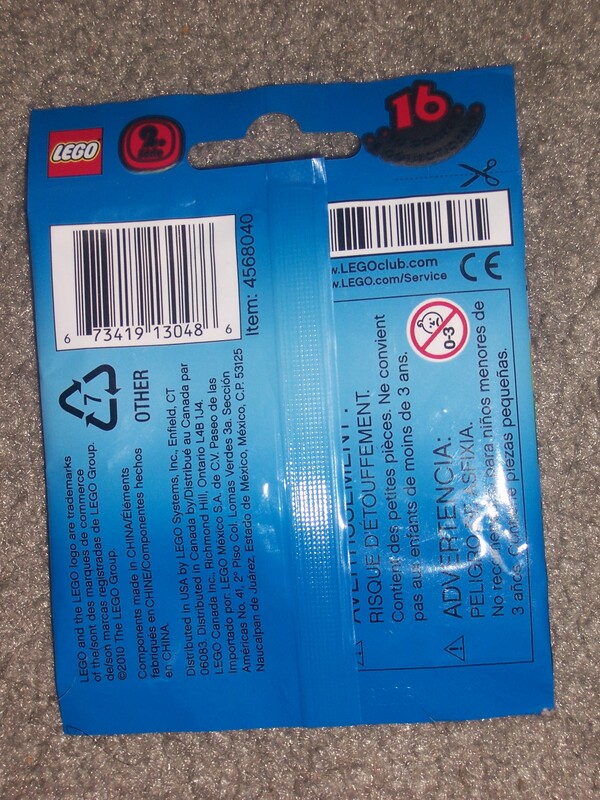 The back shows warning labels in different languages, where the parts were made in, and the Lego Club Logo. To open the bag without completely ruining it use the middle of the back so the bag wont be in bad condition. 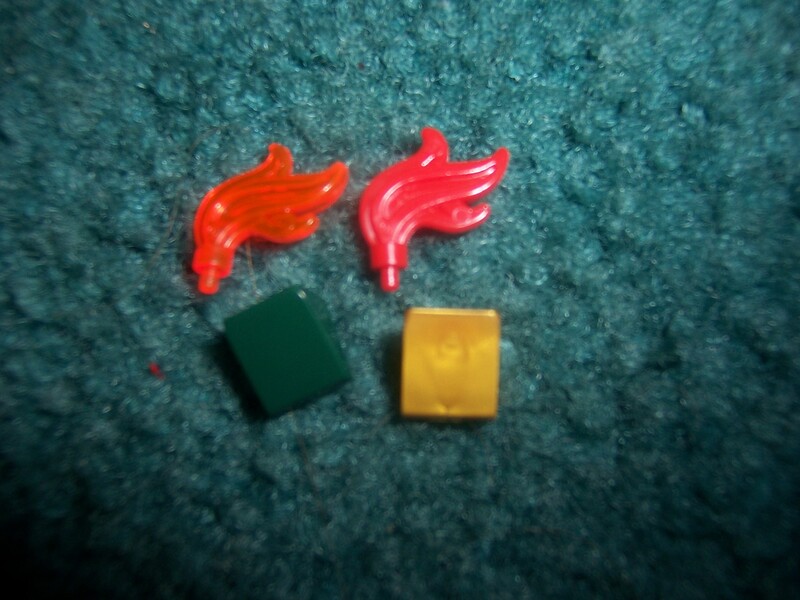 The pieces are pretty generic. No new pieces sadly. The LGM’s head comes in its own bag. 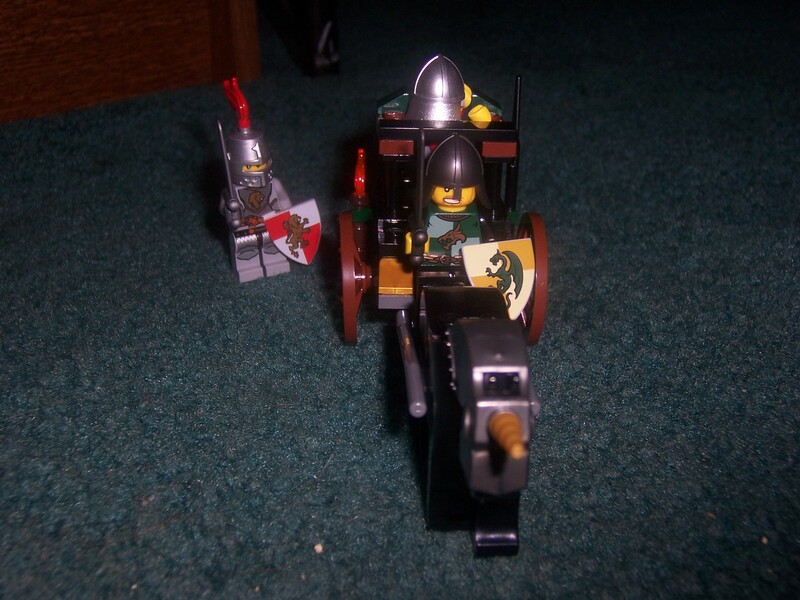 For me the reason to get this set is the minifigure. Right now it is the cheapest way to get a LGM. The details of the Figure are pretty good. 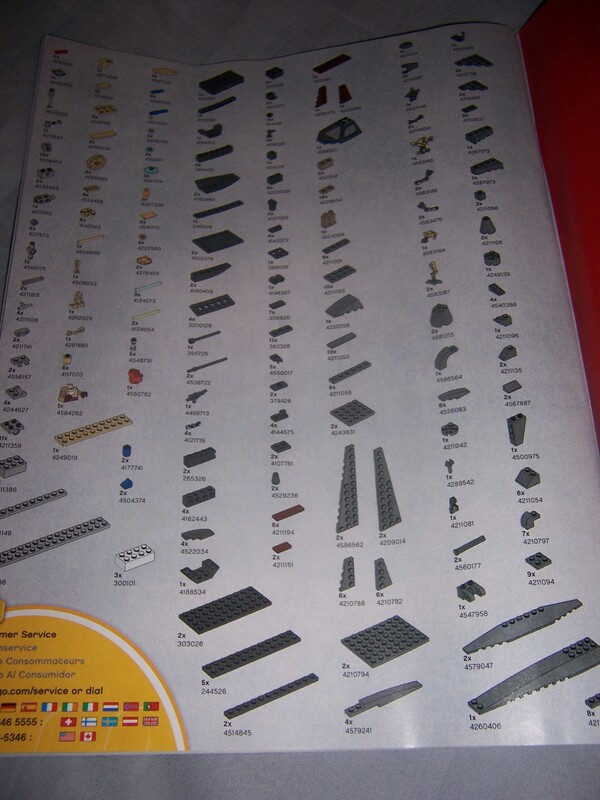 3 thumbs up to The Lego Company! Yes! There is backprinting! Simple but good. The build is very fast( a minute or so). 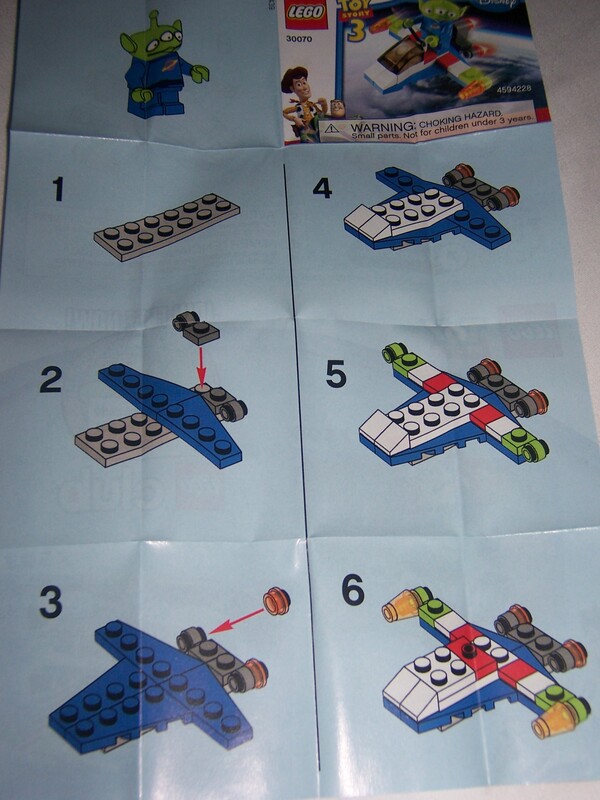 The instructions are made up in 8 steps. 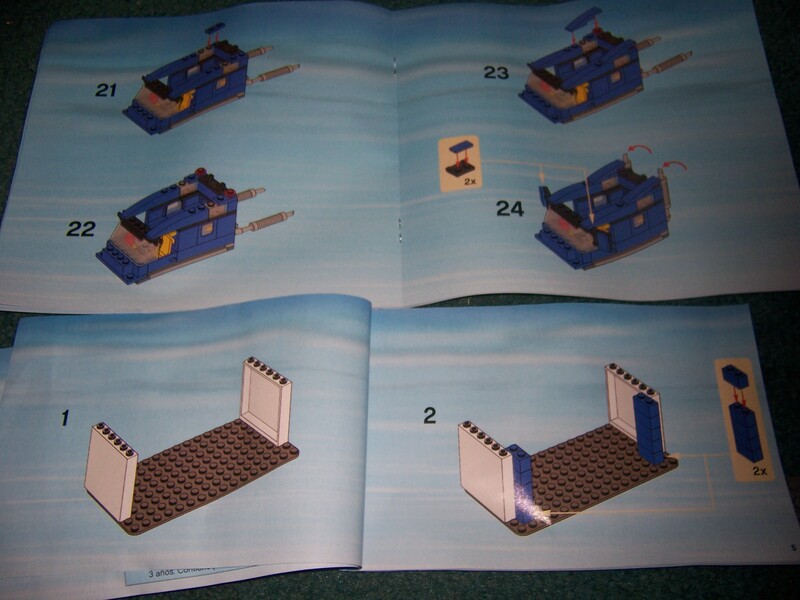 Half of the back is devoted to two of the Lego toy story sets, 7590 and 7593. Here’s the build in 4 pictures. 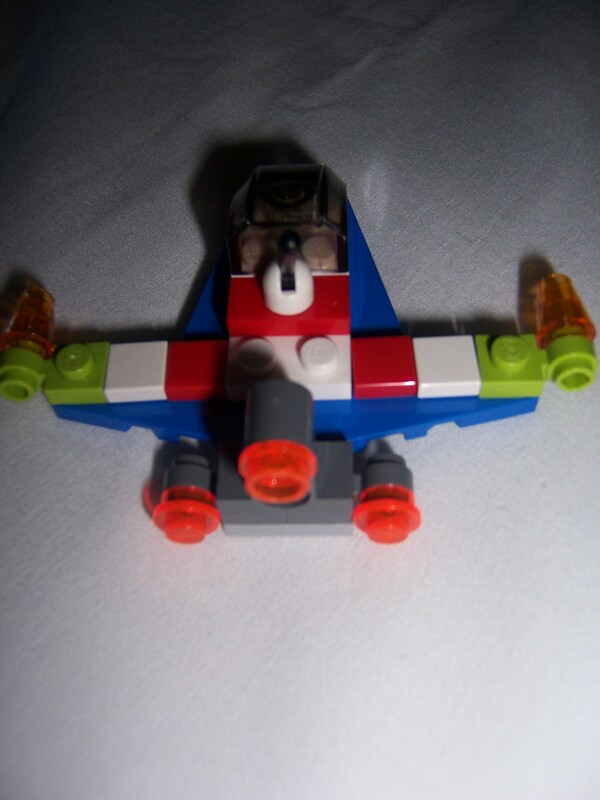 The spaceship with the LGM. 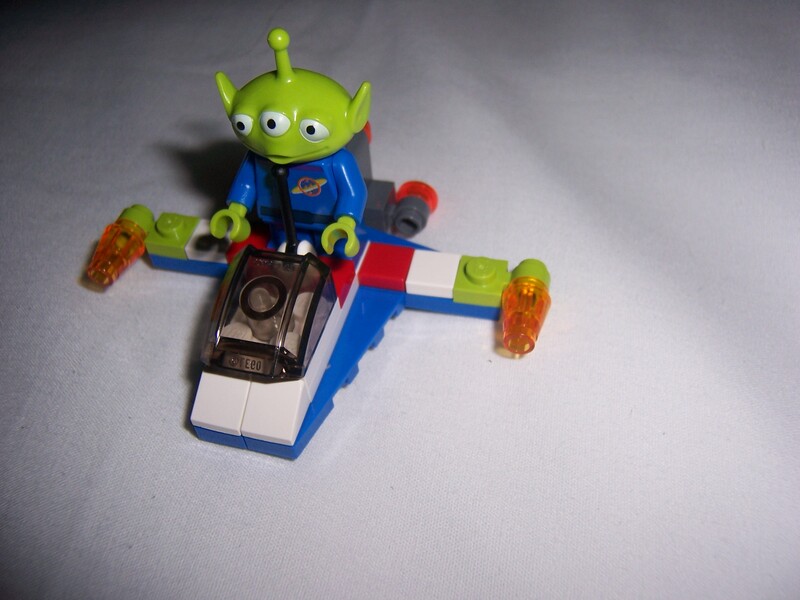 Design: 4/5 -The design of the spaceship seems to be mostly based off of Buzz’s Star Command Ship. Build: 3/5 – Fast build and very simple. Nothing hard to it. 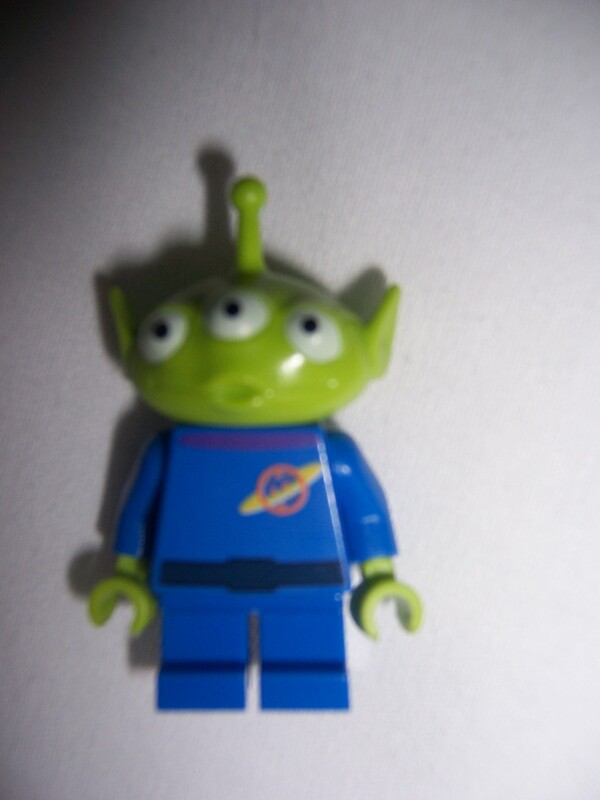 Minifigs: 5/5 -It comes with a squeeze toy alien. Can it get any better than that? Playability: 3/5 – The only play feature is that it is very Swooshable. 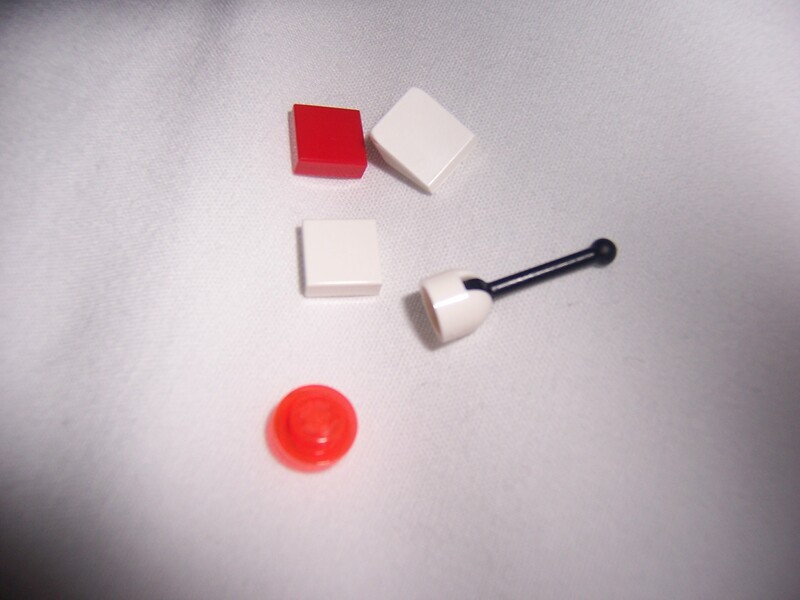 Parts: 4/5 – A decent amount of pieces. Some tiles and 2 lime green modified 1×1 with clip light, nothing to special. Price: 4/5 -A dollar more than promos usually are. the price does help it be a army builder. Overall: 5/5 – Its a pretty nice set. 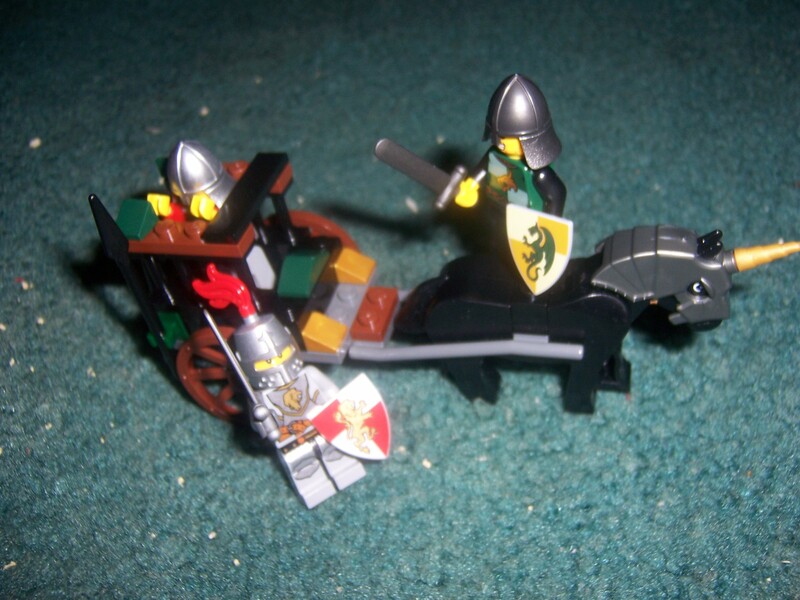 The minifigure is the highlight of the set. I wish the set could be available a little longer. The price could have been cheaper. Overall i recommend buying it.